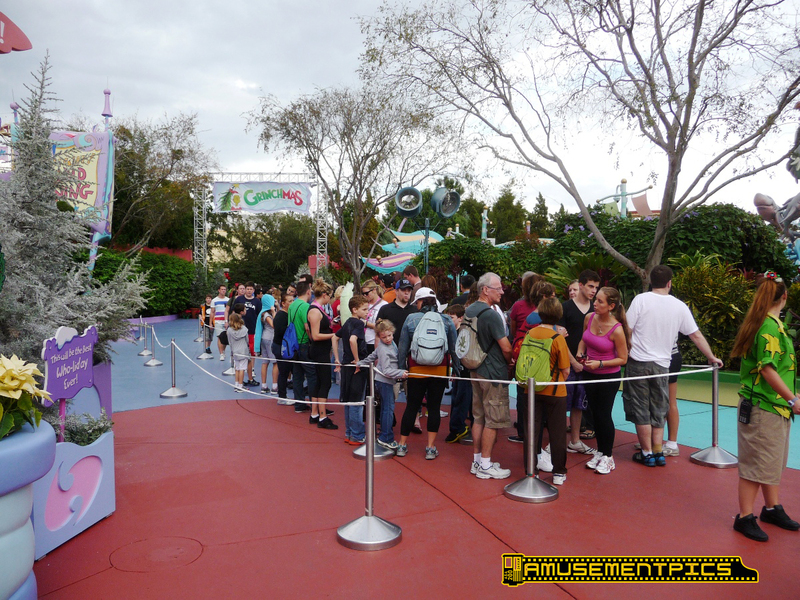 Shrek/Donkey photo area. 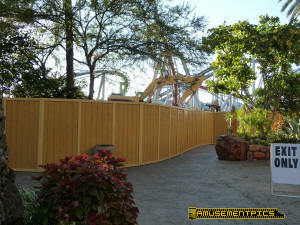 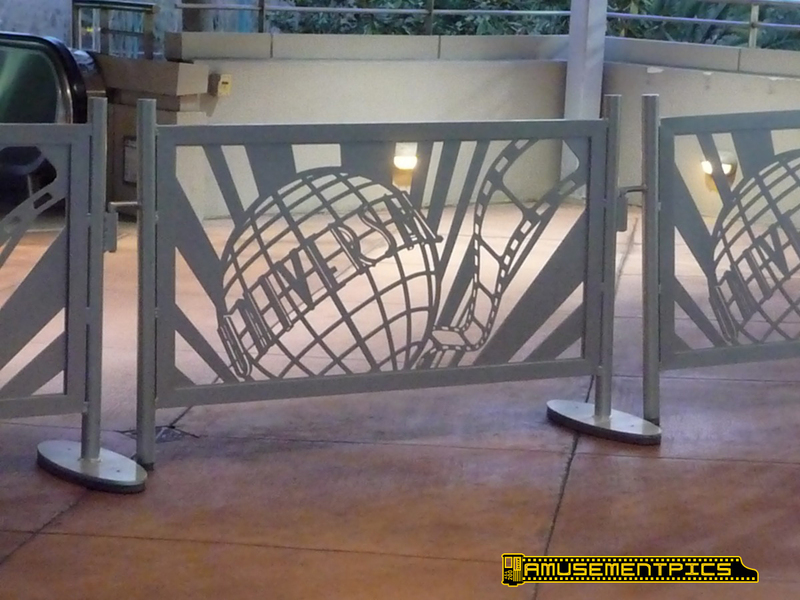 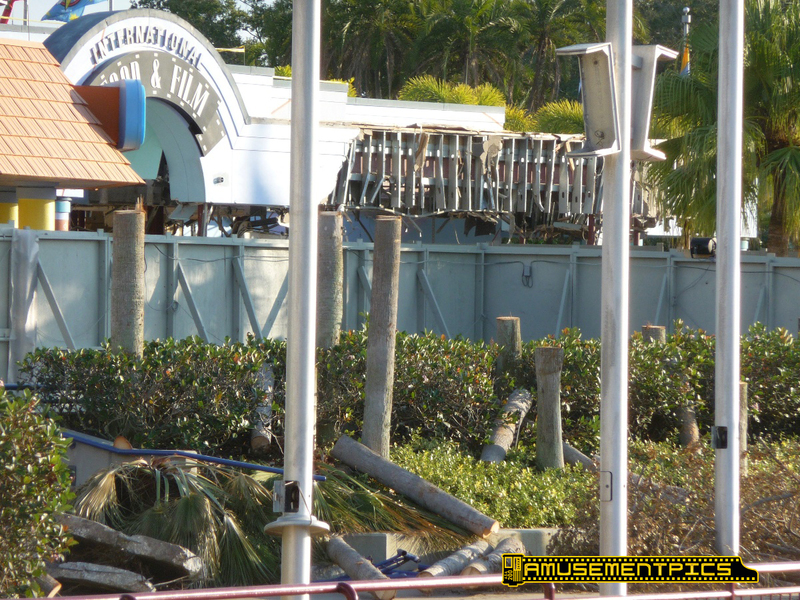 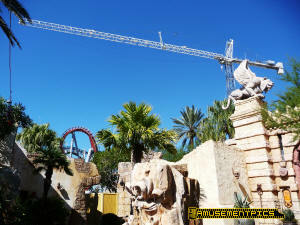 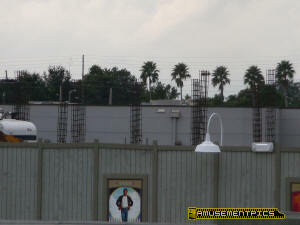 Some decorations went up on the Mummy construction fence. 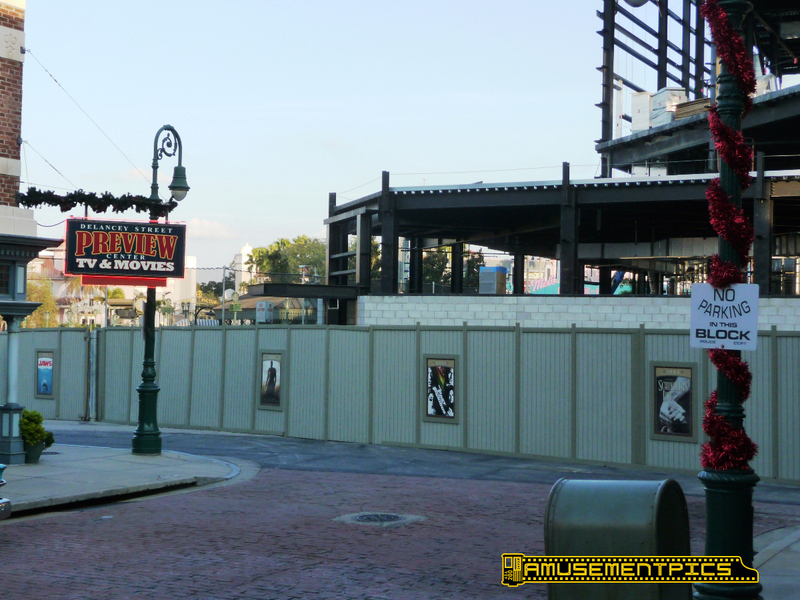 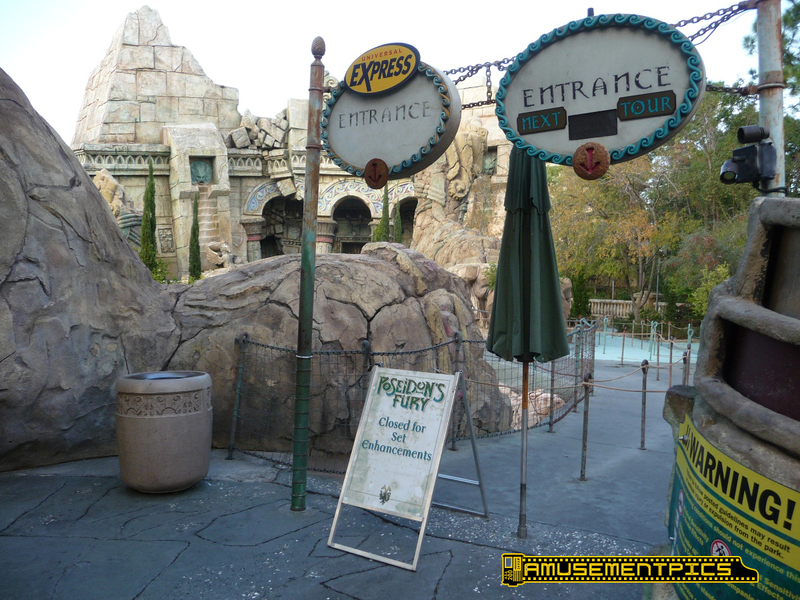 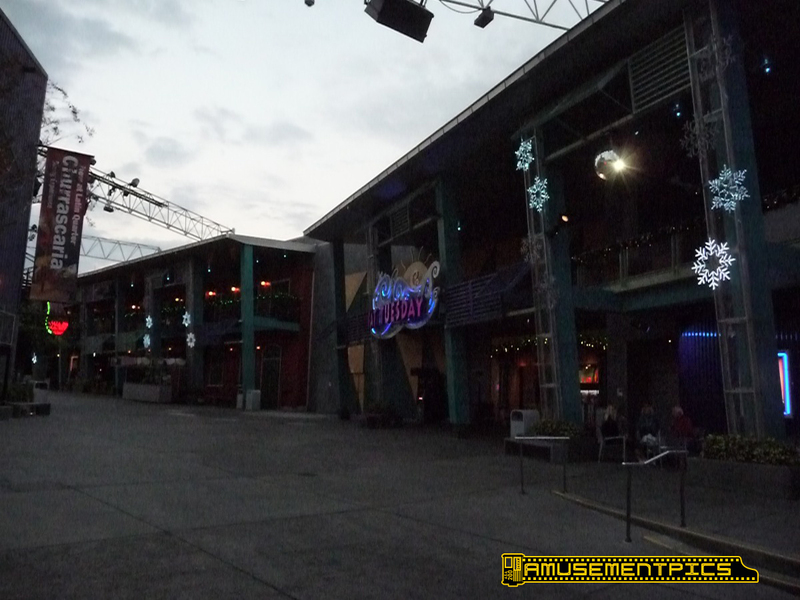 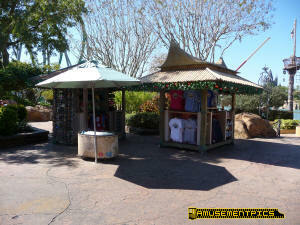 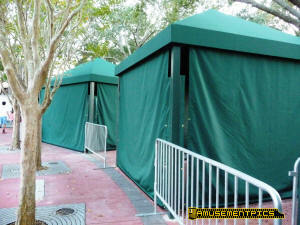 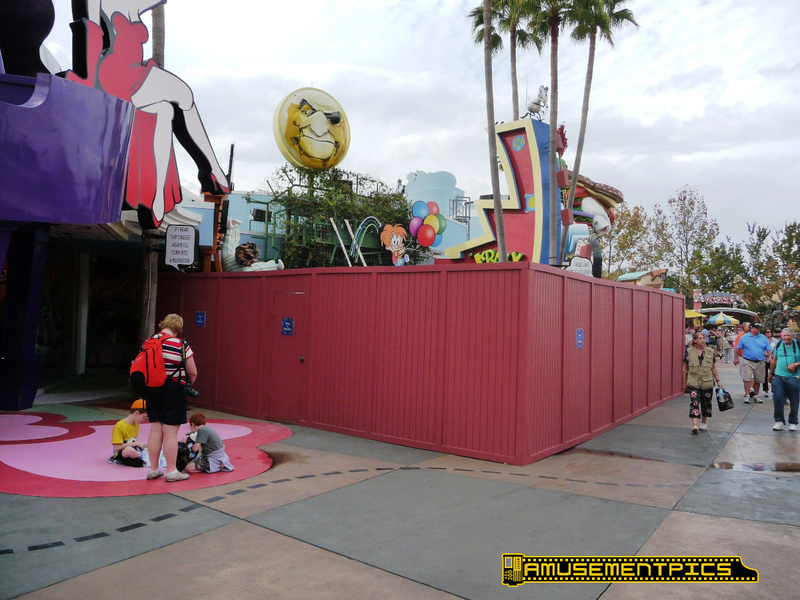 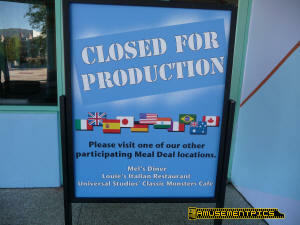 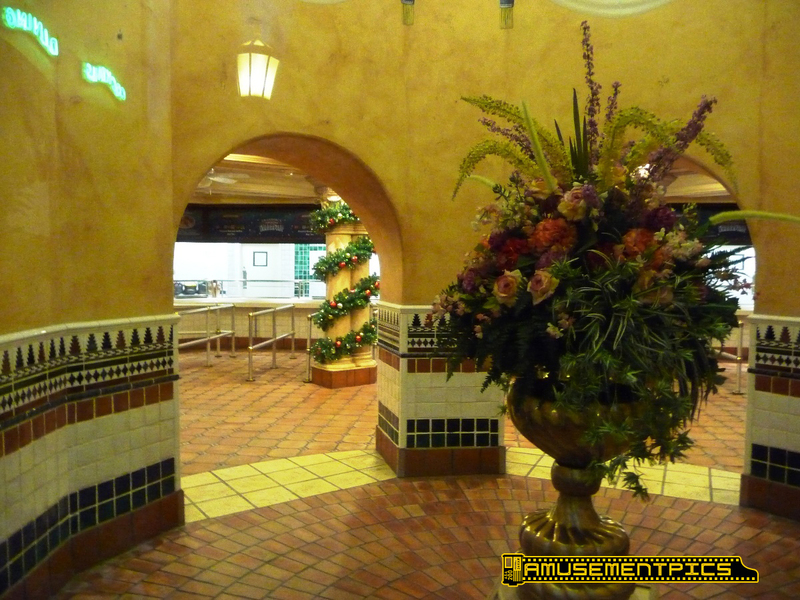 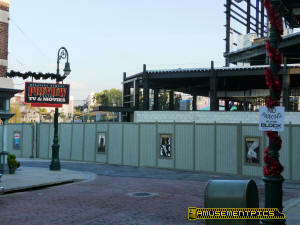 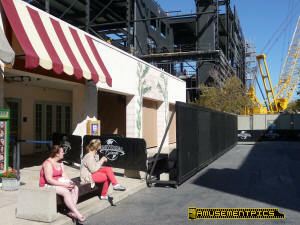 The bathrooms next to Louie's are closed rehab...maybe something to do with the Mummy queue work. 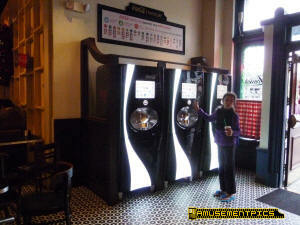 Louie's has their Coke Freestyle machines up and running. 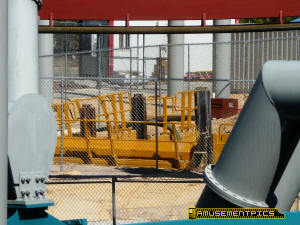 You can see the crane with the drill rig setup just behind the fences. 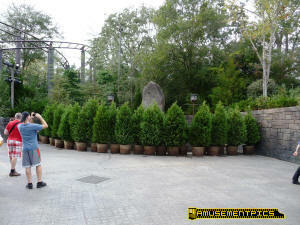 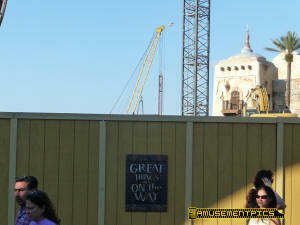 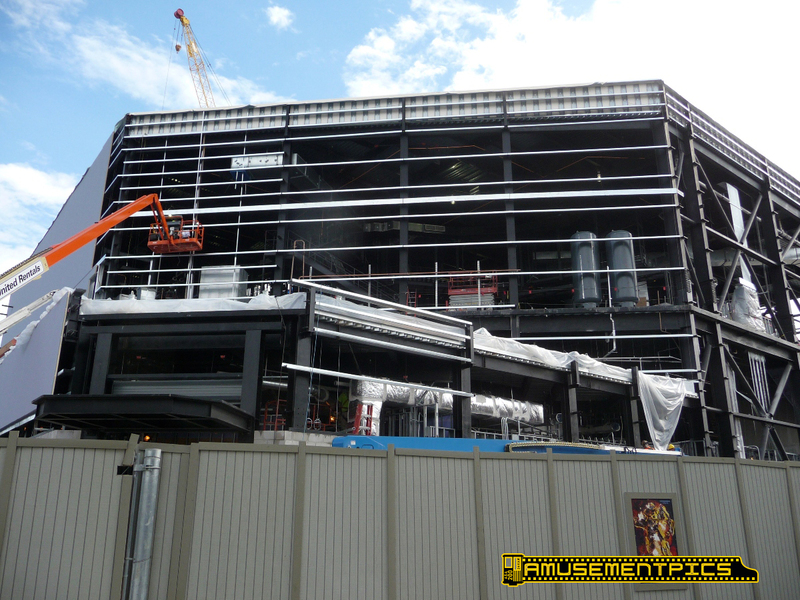 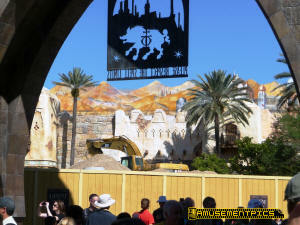 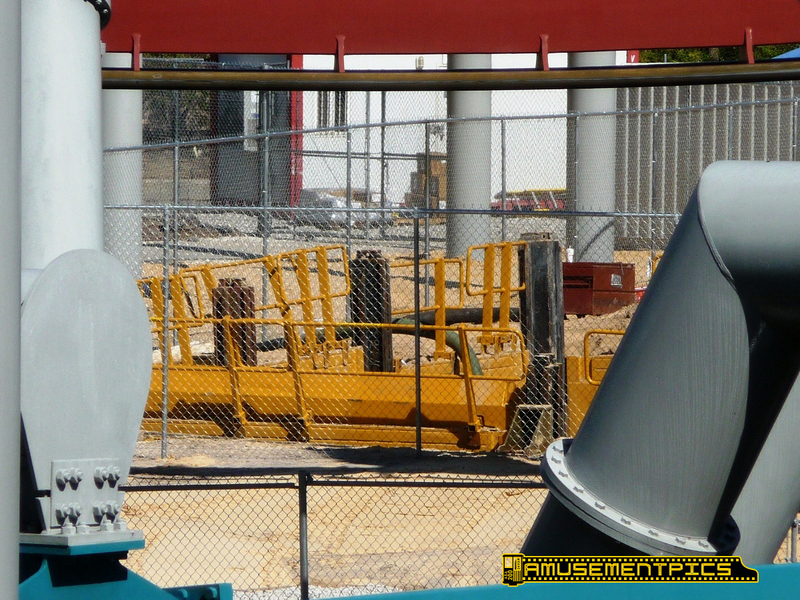 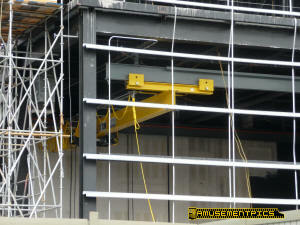 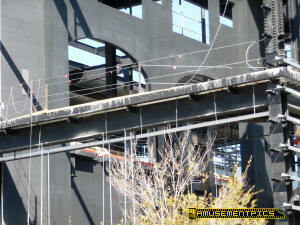 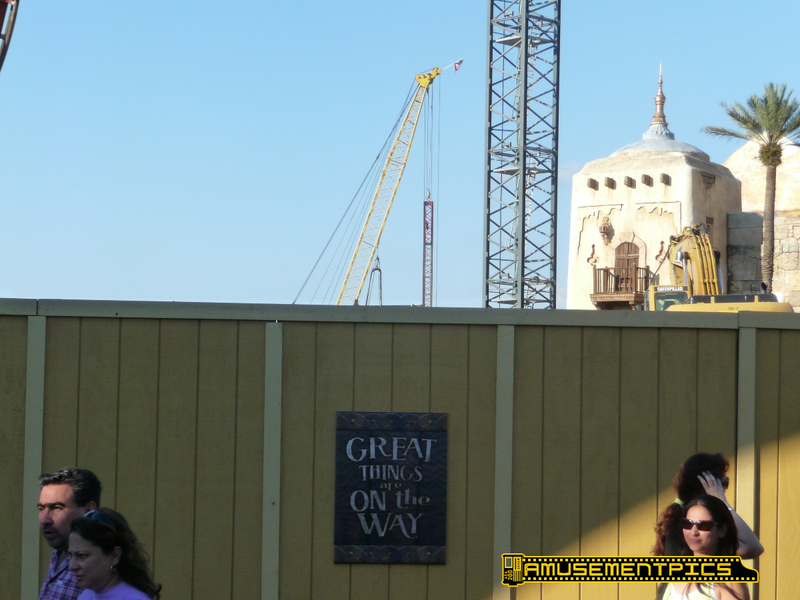 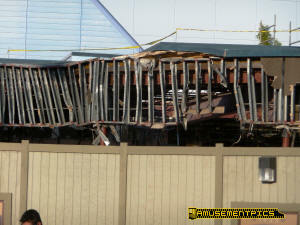 This is supposedly part of the Hogwarts Express construction project. 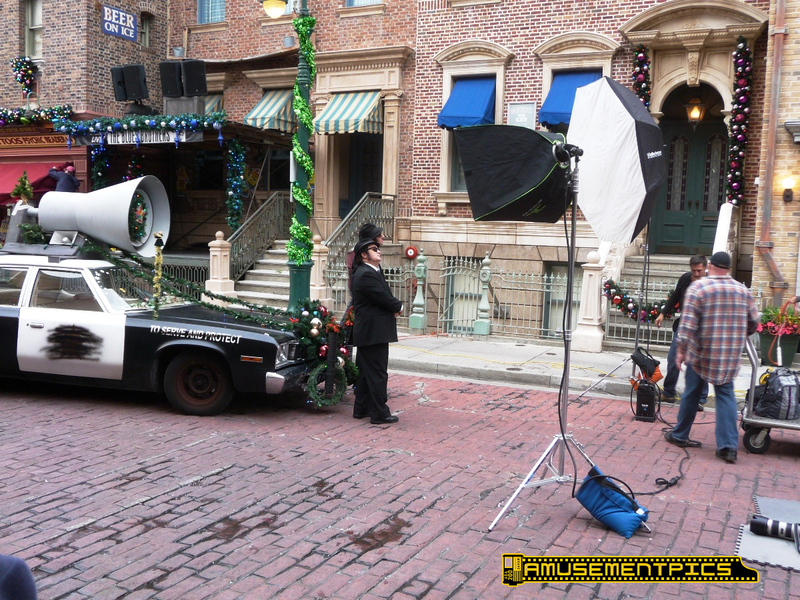 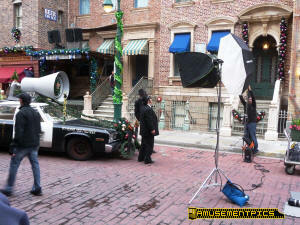 They were filming the Blues Brothers for something on Delancey Street this afternoon. Everything is set for the weekend performances. 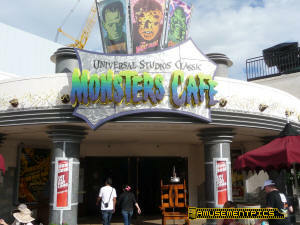 Monsters Cafe is still jumping. 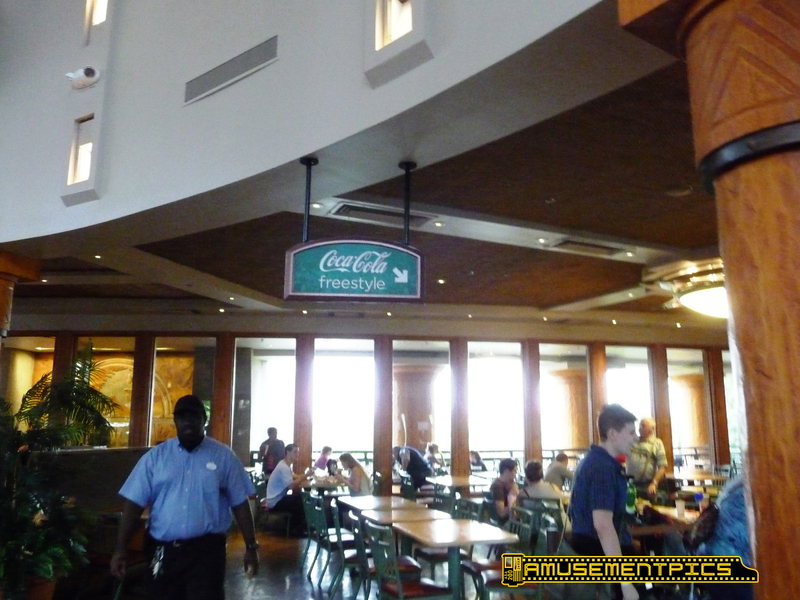 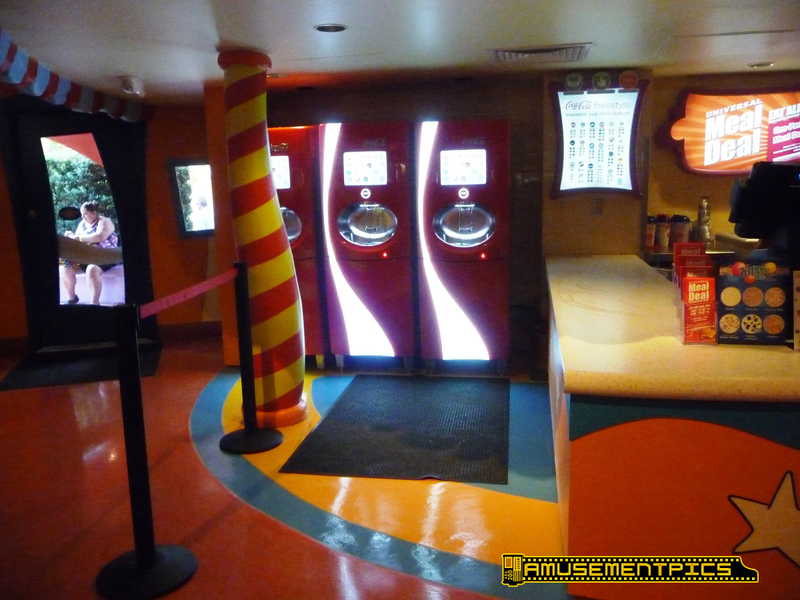 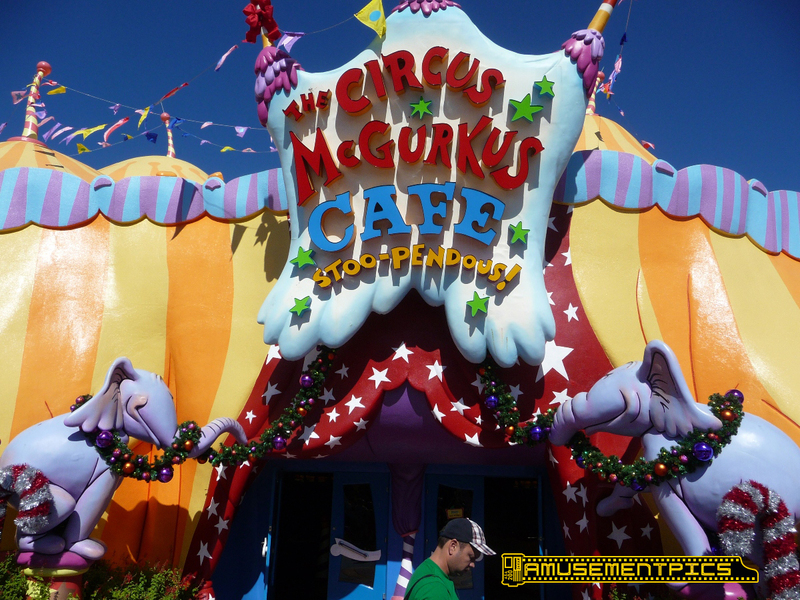 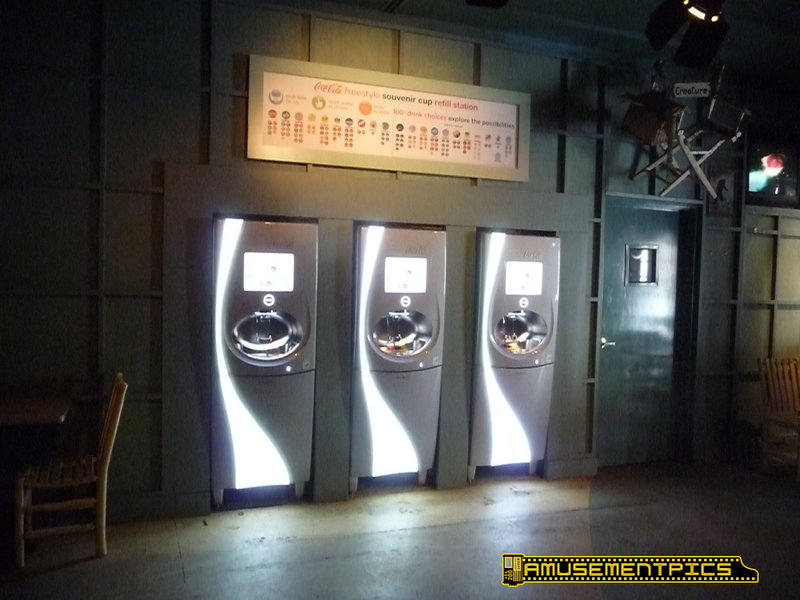 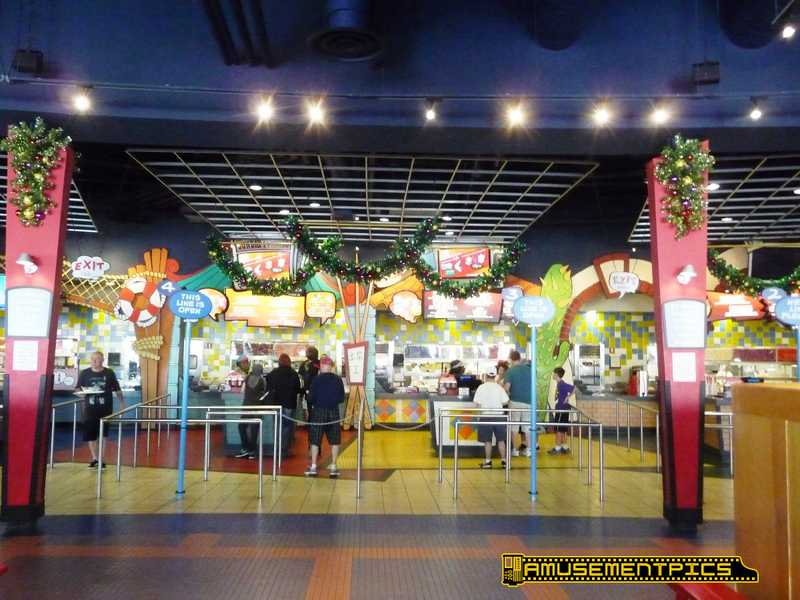 With the rumor that Monsters Cafe is going to become a Transformers themed restaurant, it seems strange they would have spent the time and money installing the new Coke Freestyle machines. 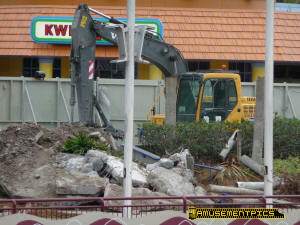 Maybe that was all the "foundation work" that was happening as they installed the plumbing for the new machines? 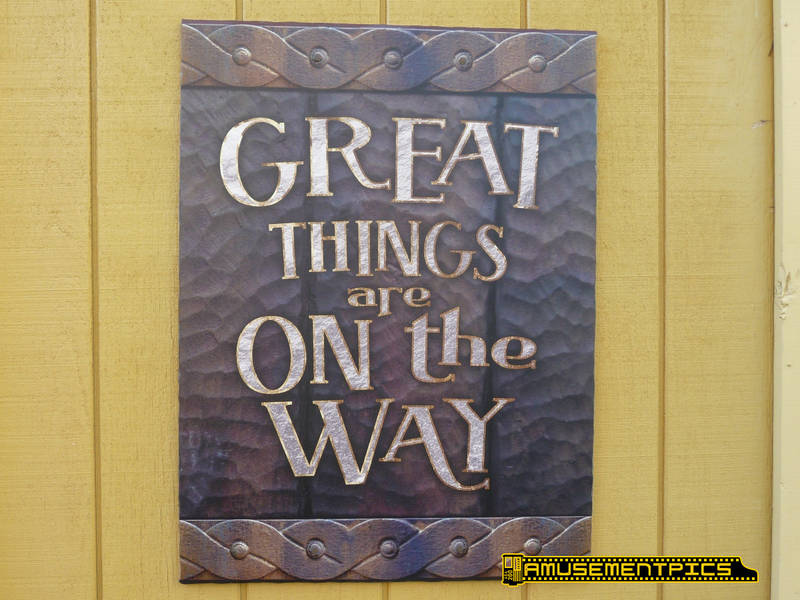 Rumor has it changes are coming. The Coke Freestyle machines have been installed in Monsters Cafe. 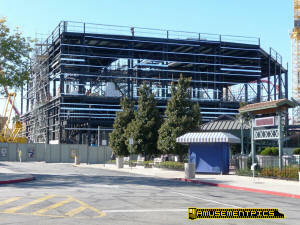 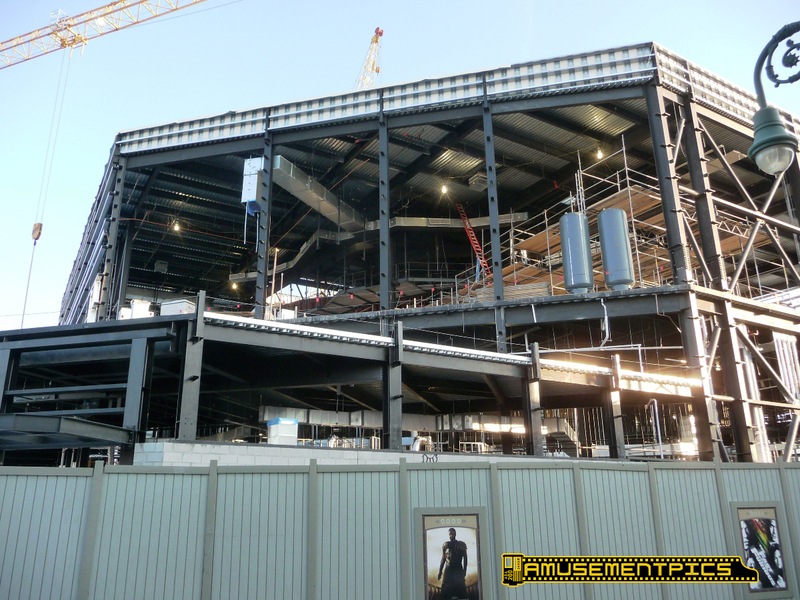 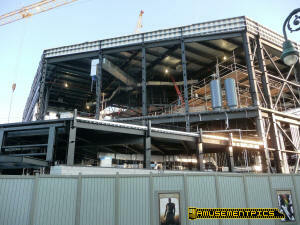 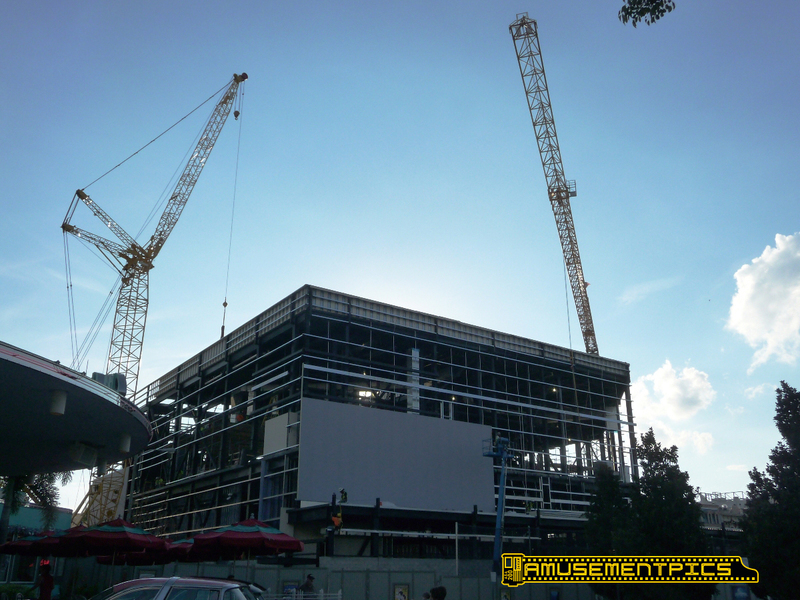 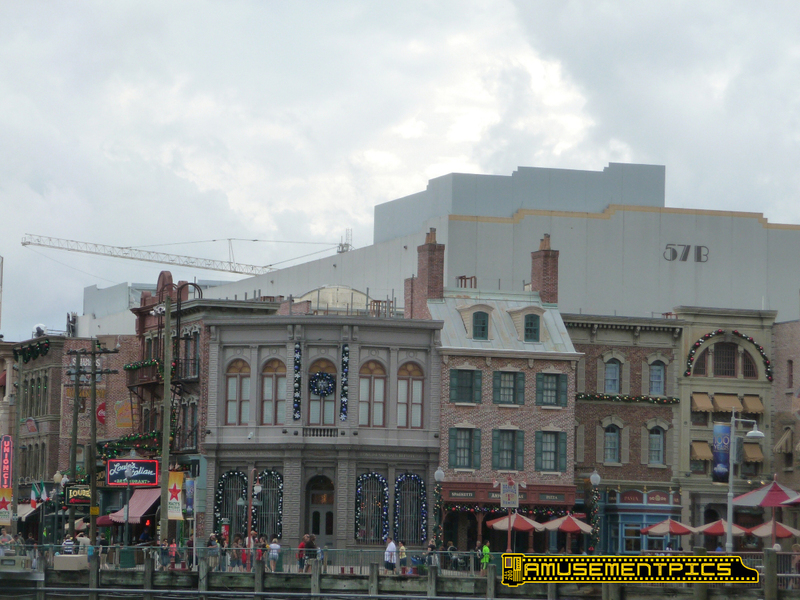 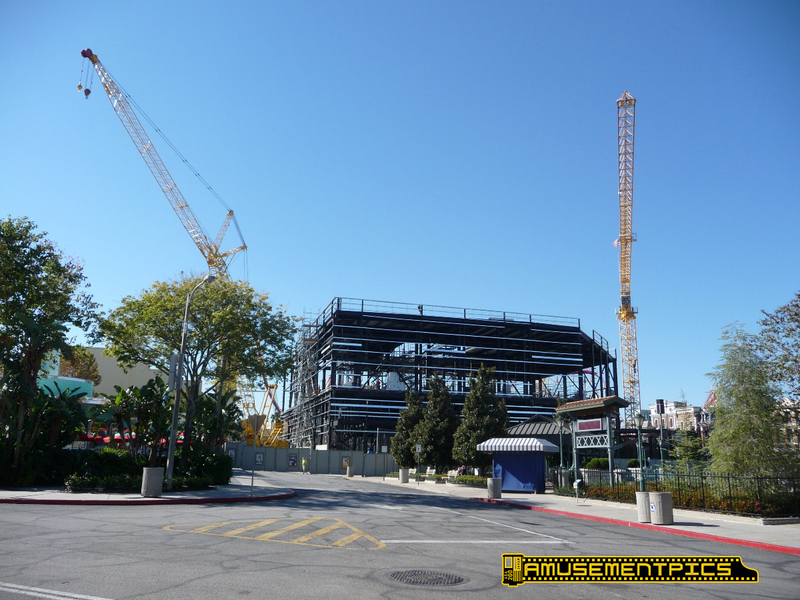 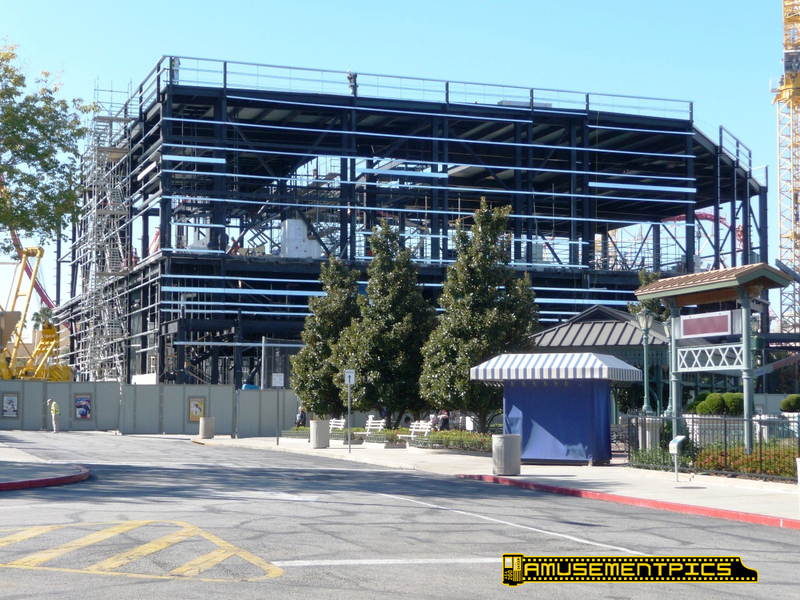 Nearly the whole Transformers building is now enclosed now. will be done, with the crane now in place. Here's the "front" of the building. 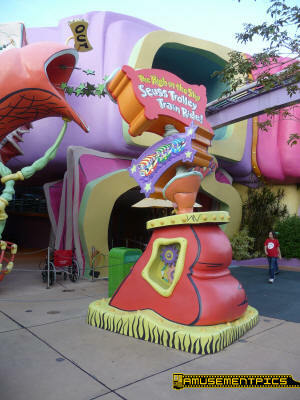 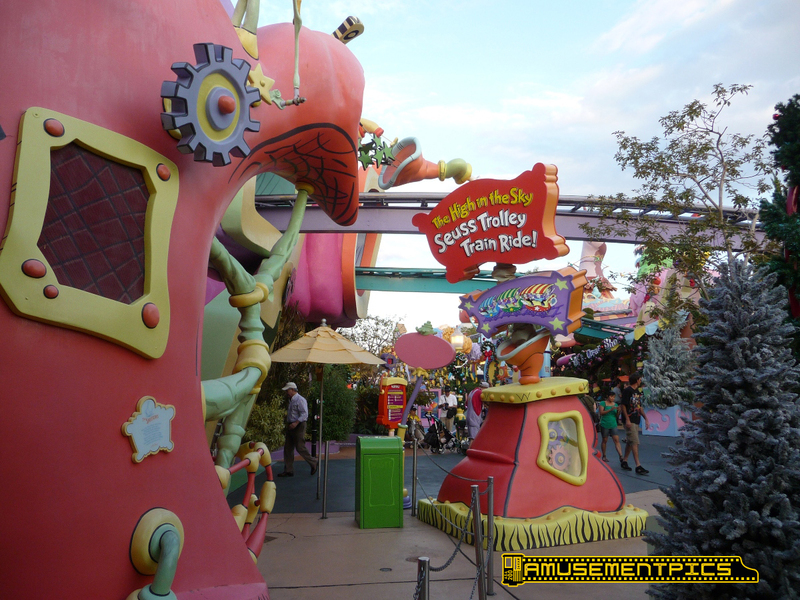 Here's the entrance to the ride. 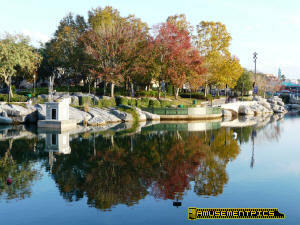 View from the lagoon. 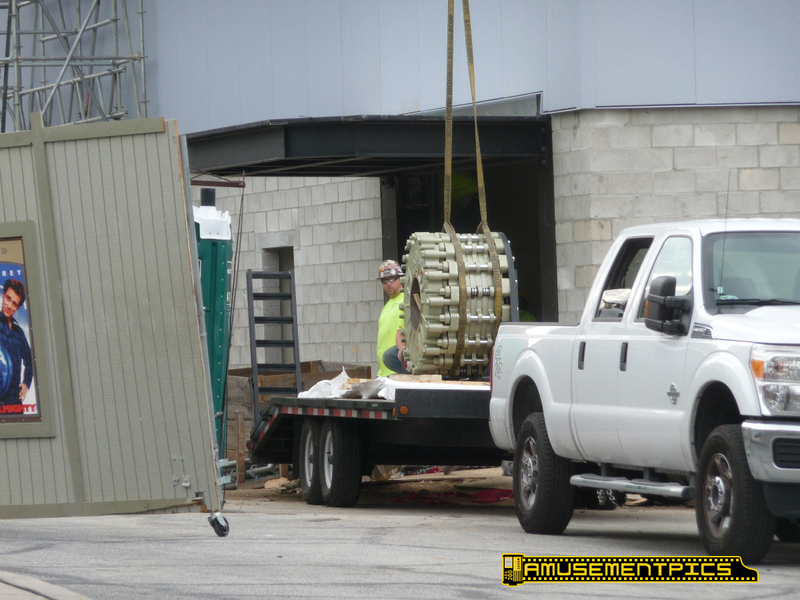 More parts keep arriving all day. 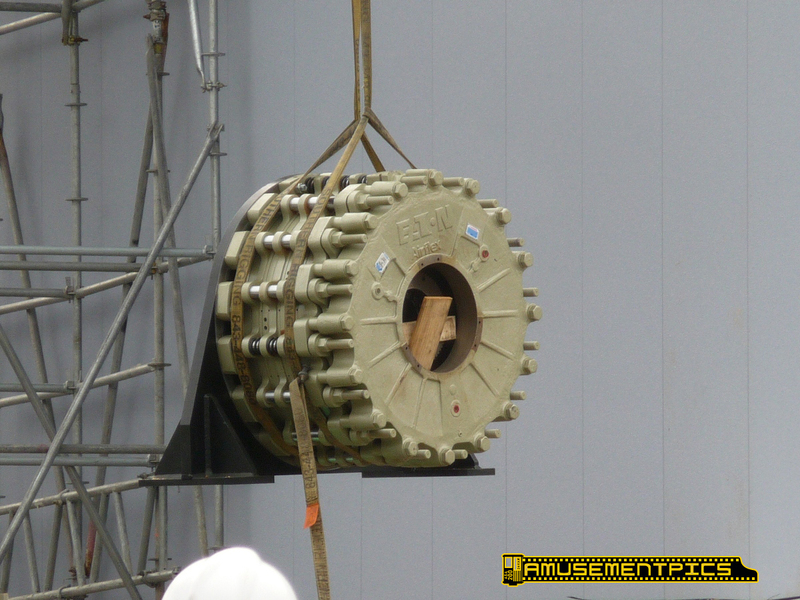 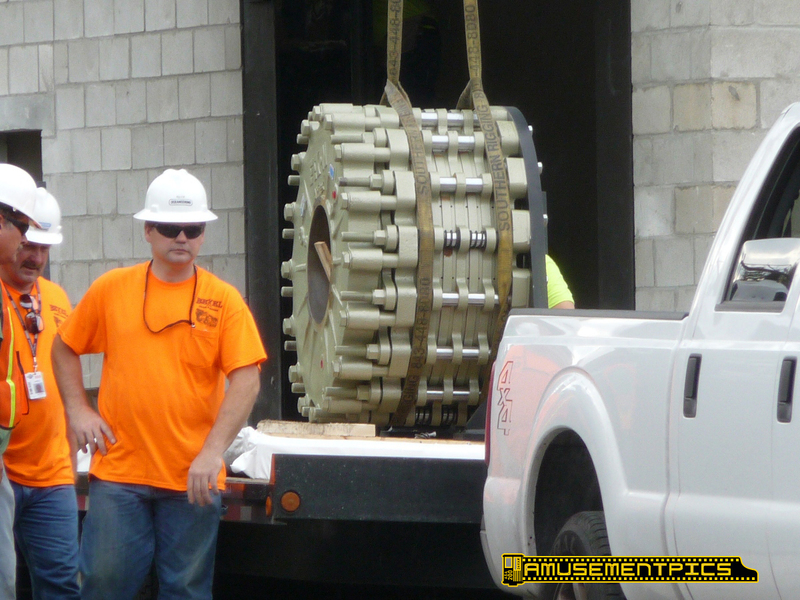 Here's a heavy piece of equipment being delivered. It appears this is the clutch for one of the rides elevators. 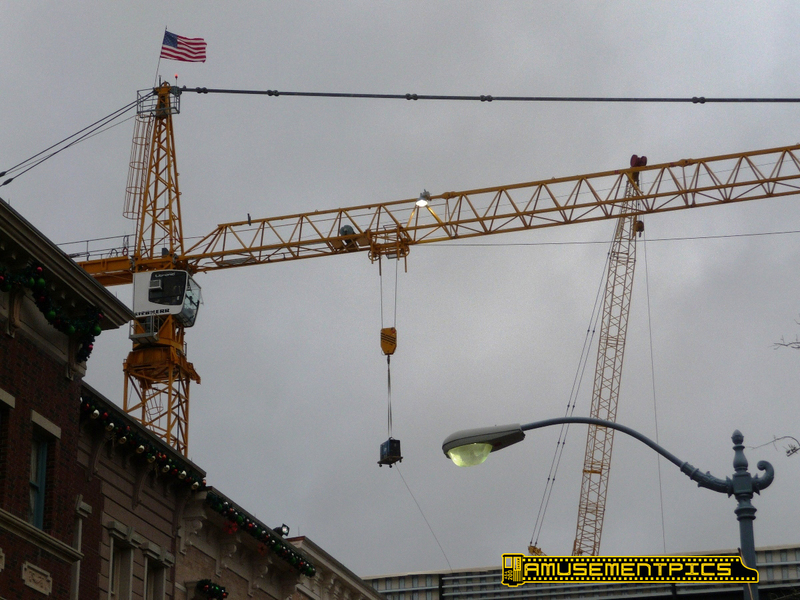 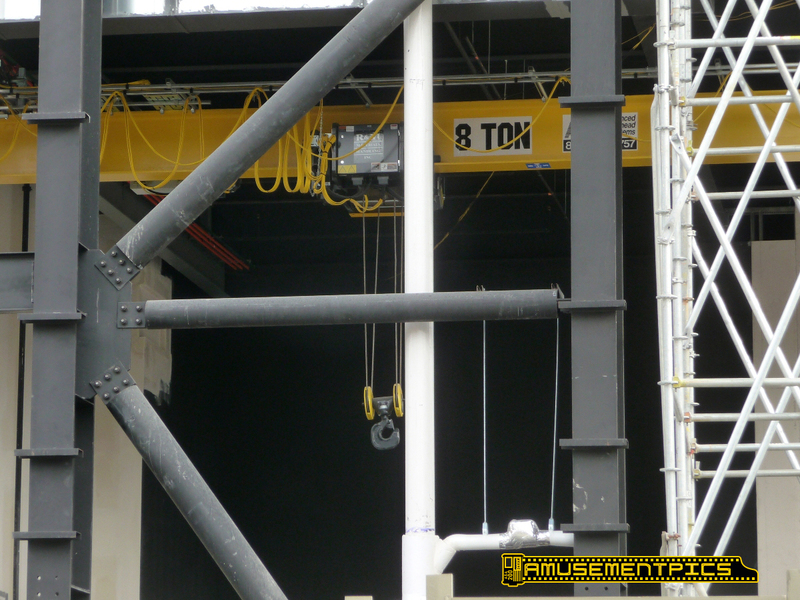 The part was hoisted to the roof where it was lowered through a hatch. 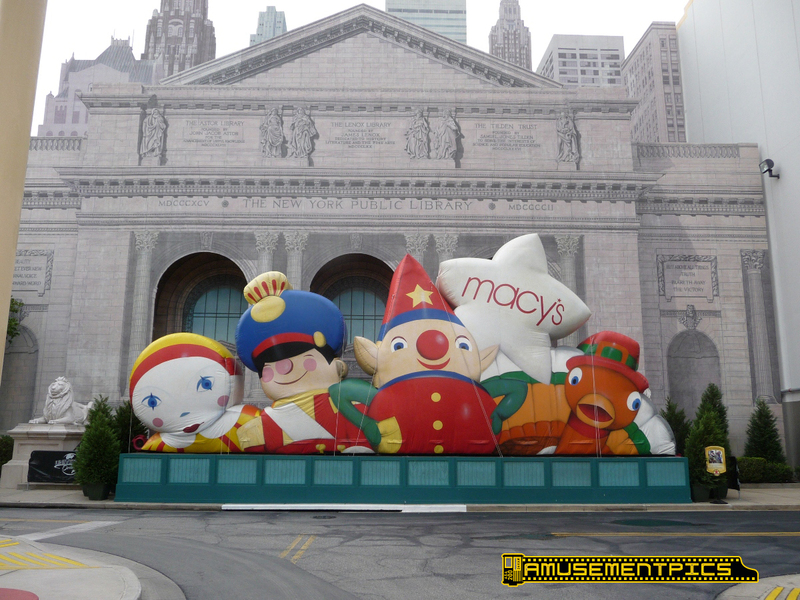 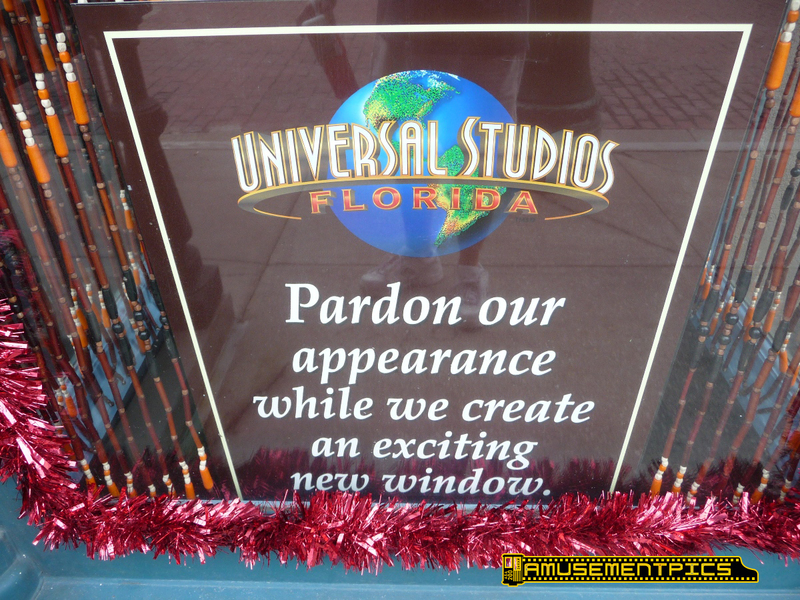 Over on the Streets of New York, one of the windows was being refurbed. 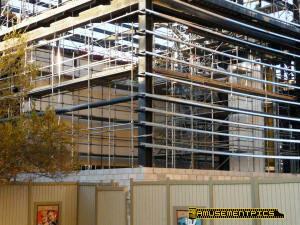 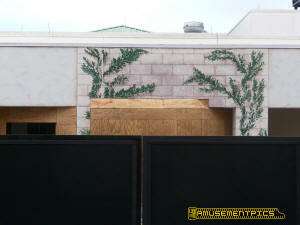 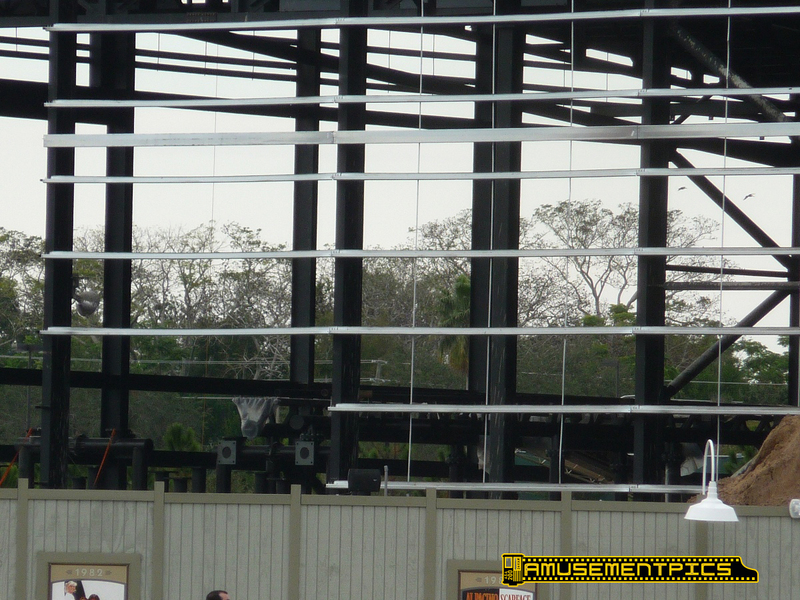 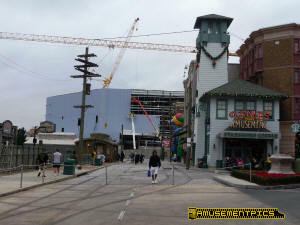 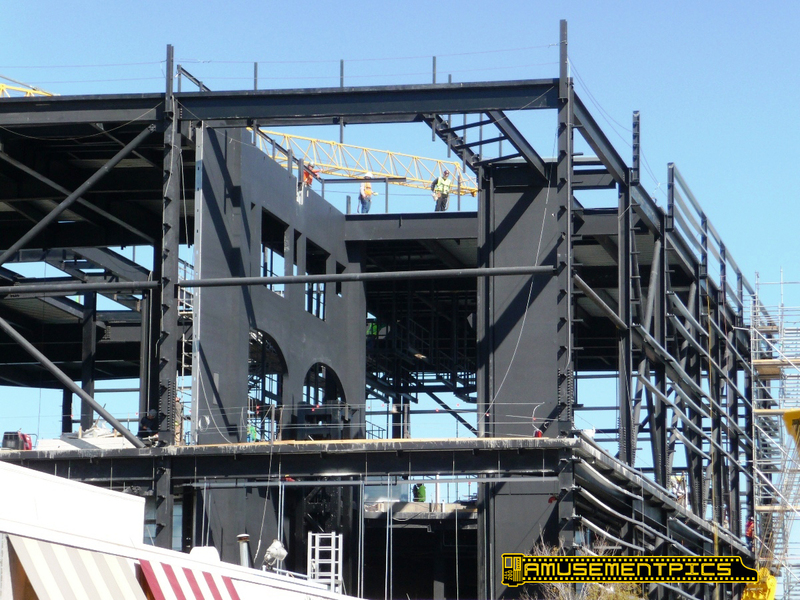 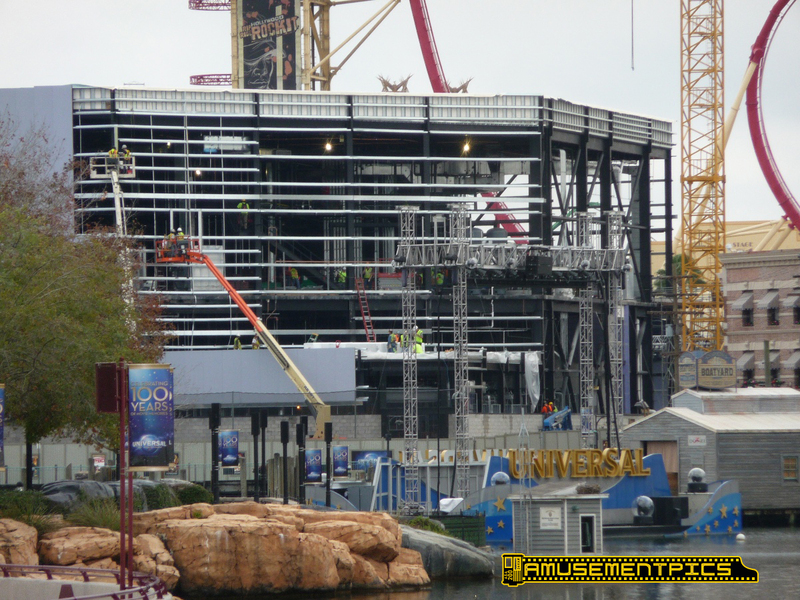 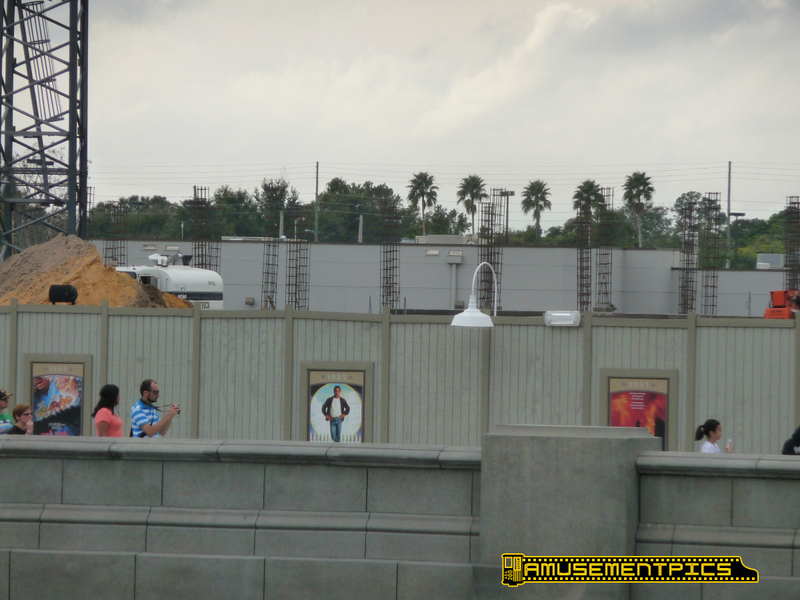 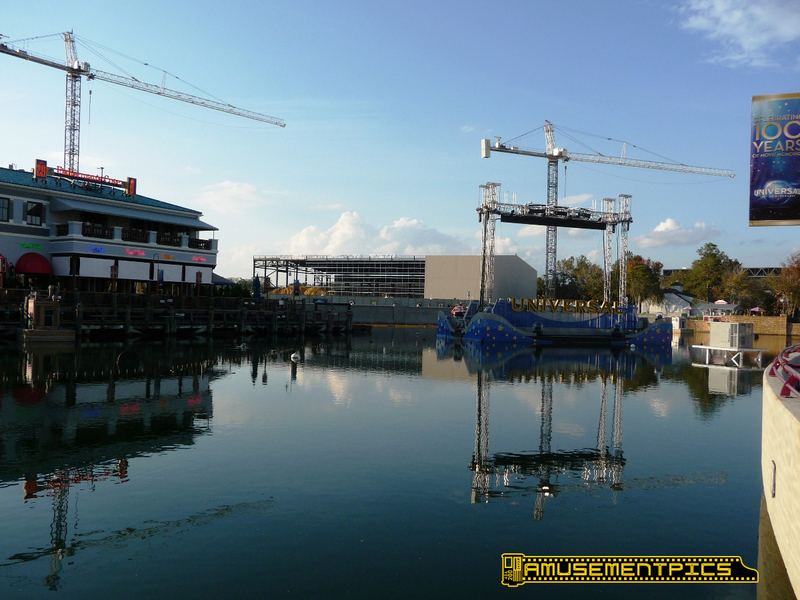 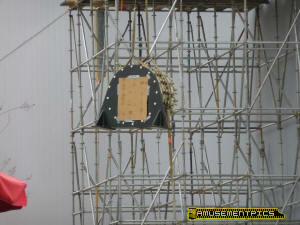 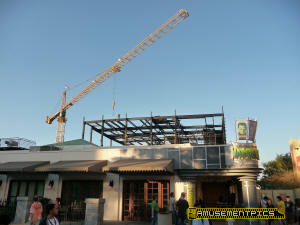 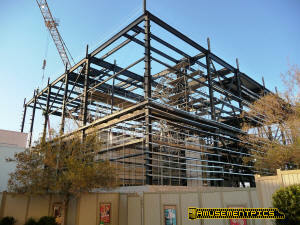 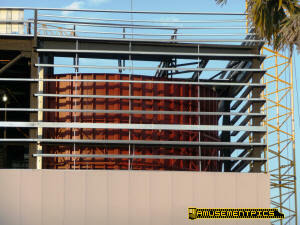 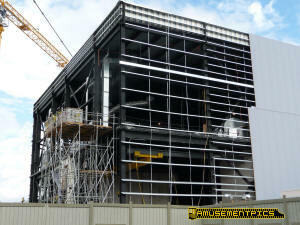 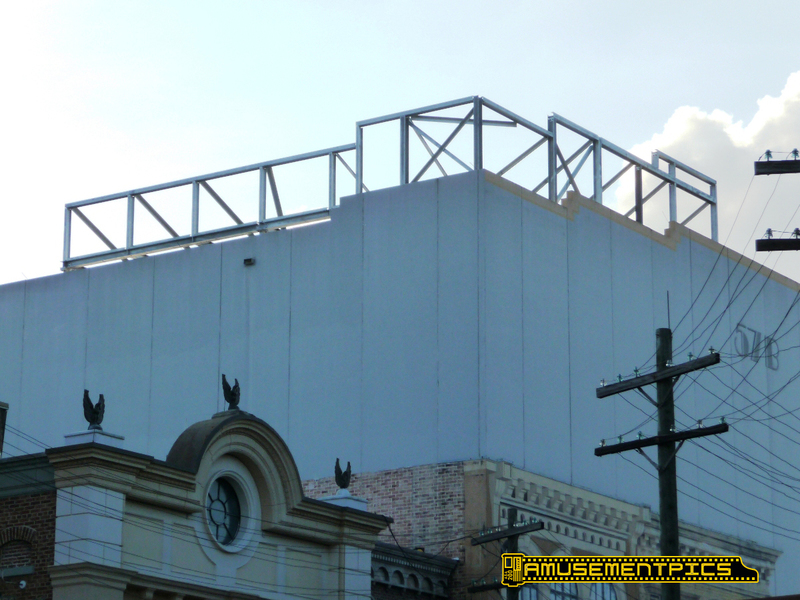 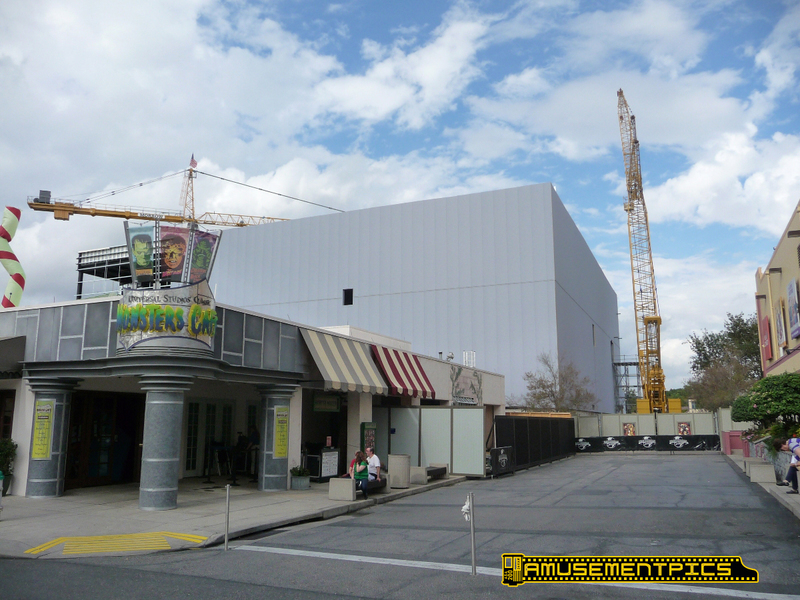 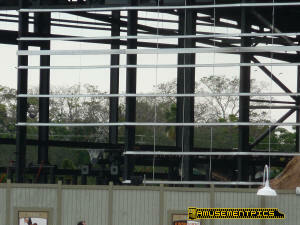 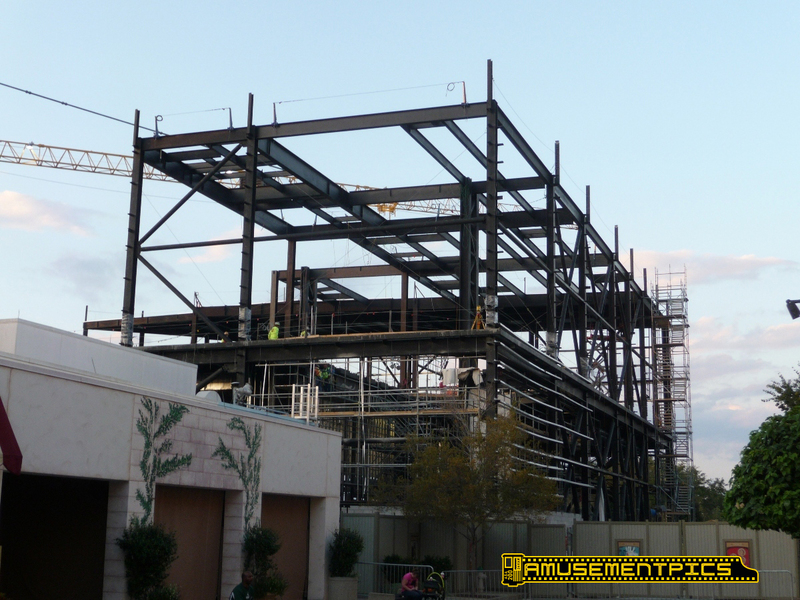 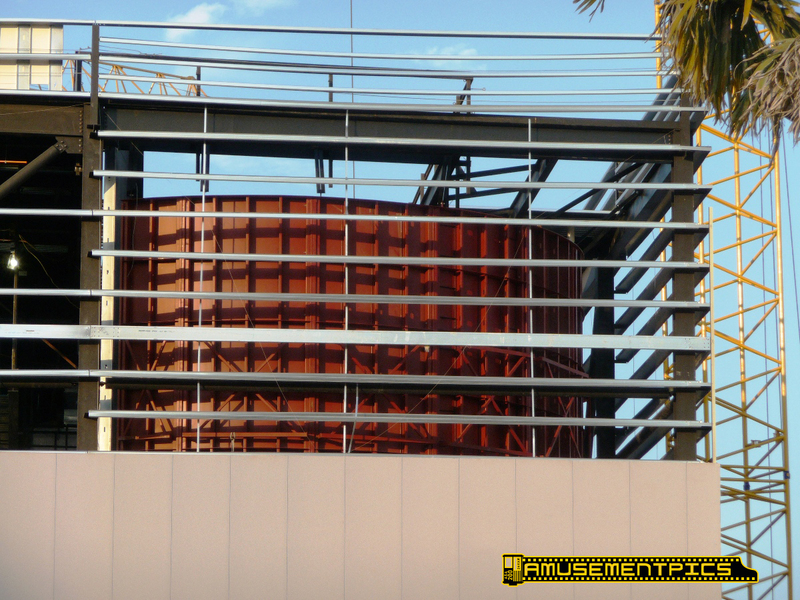 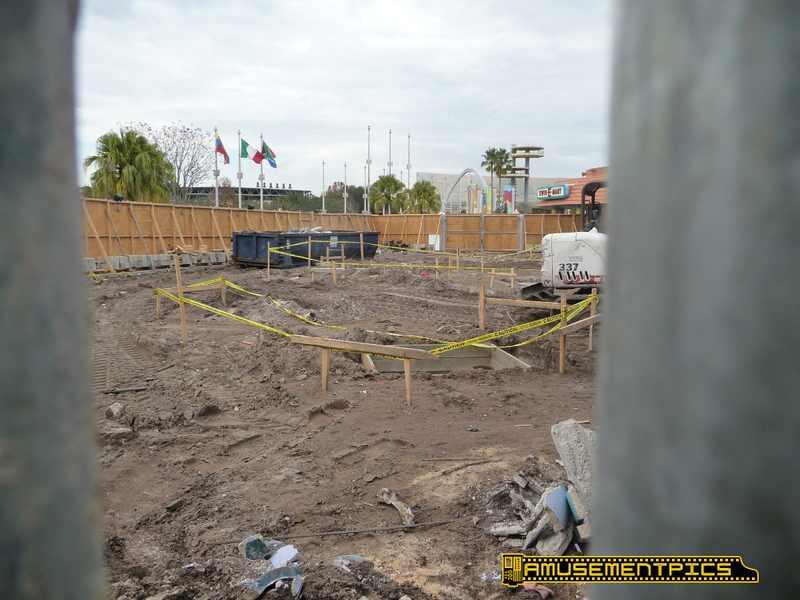 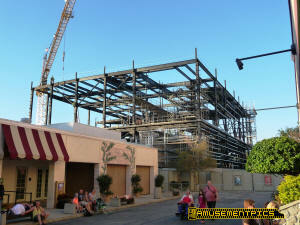 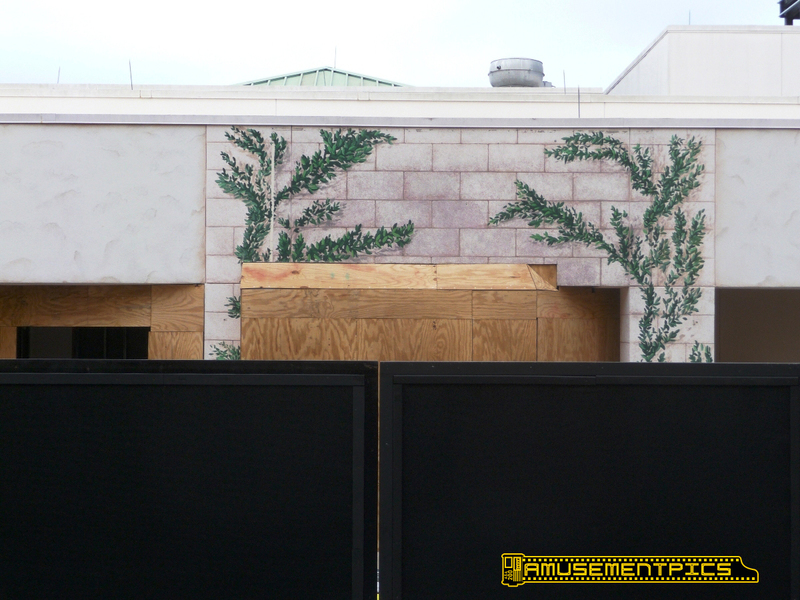 The new walls on top of the Mummy show building mirror the lines of the existing structure. 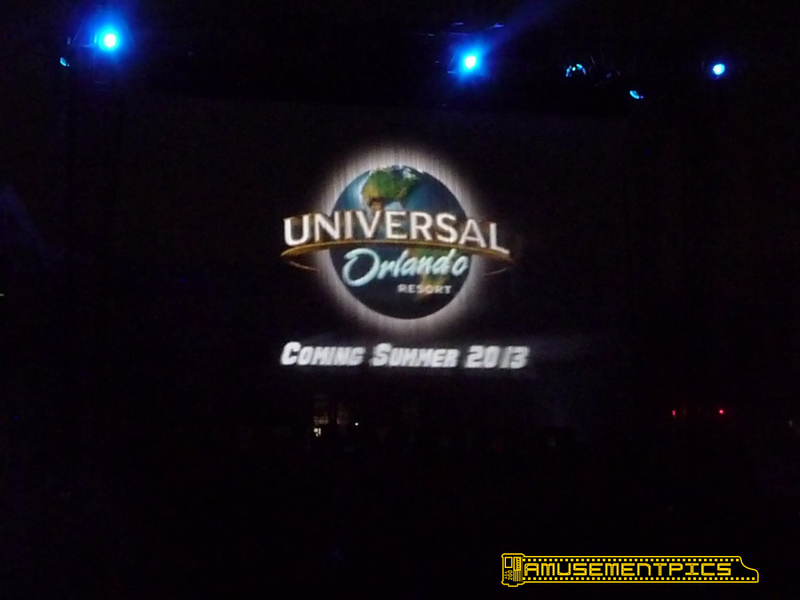 Still no word on why they were added. 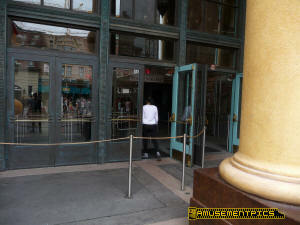 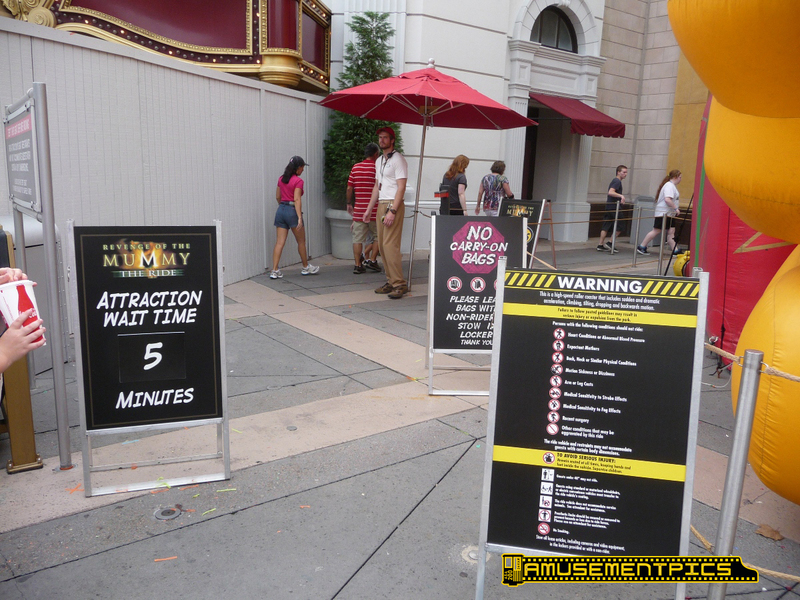 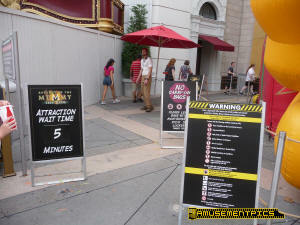 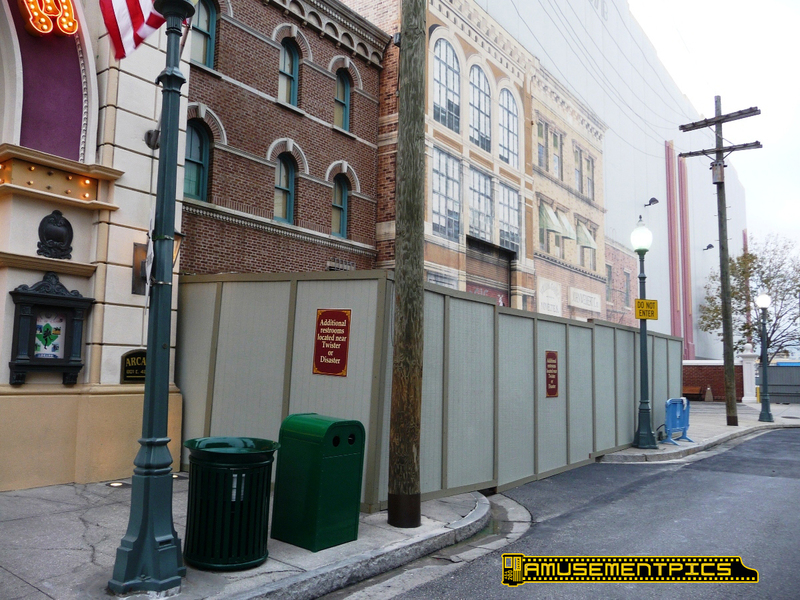 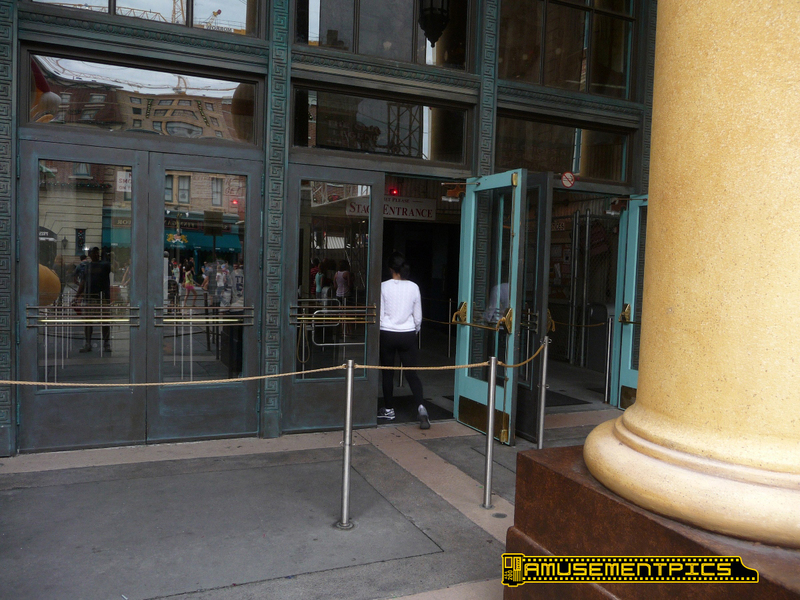 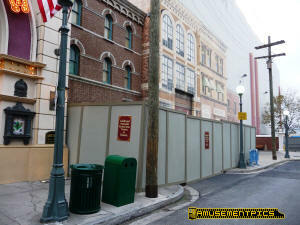 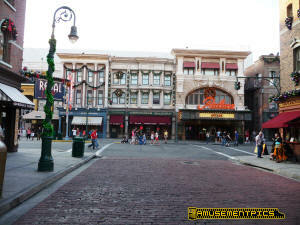 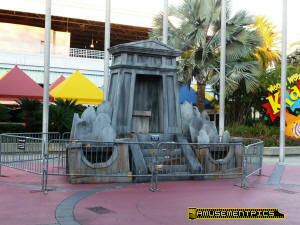 The Mummy entrance has been closed and moved around the corner. rebar frames for the columns that will form Charing Cross Station's interior. 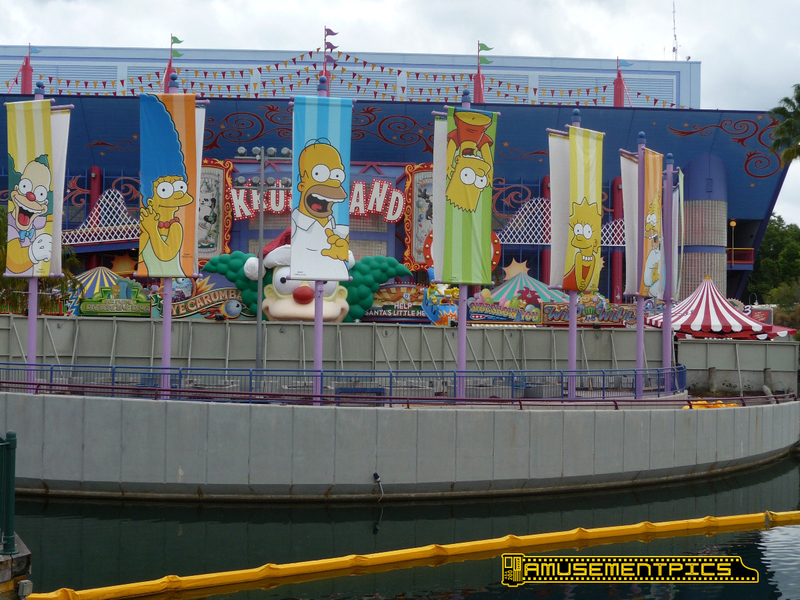 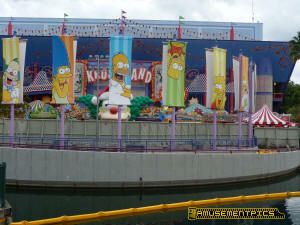 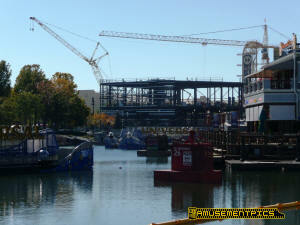 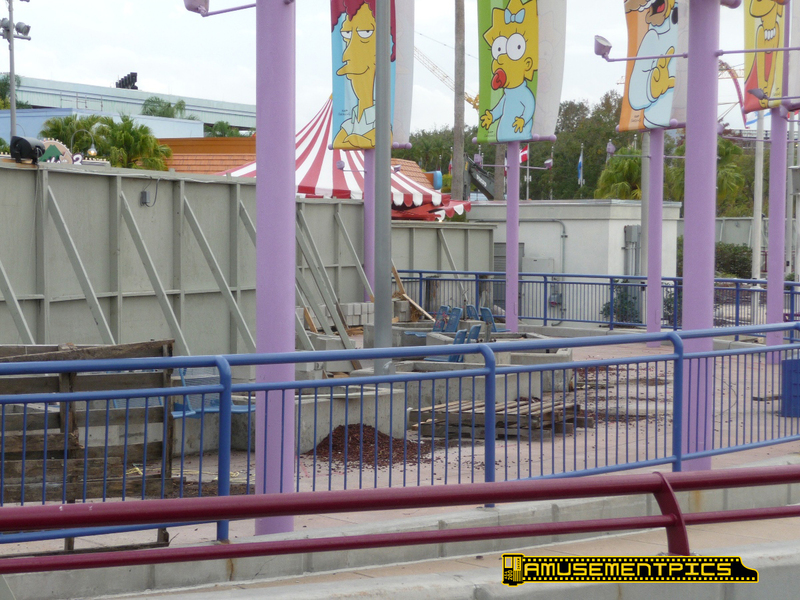 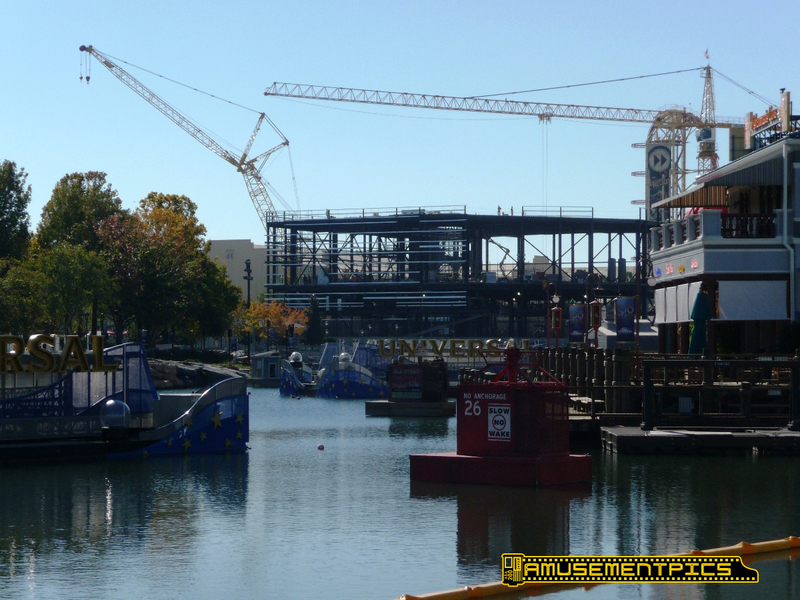 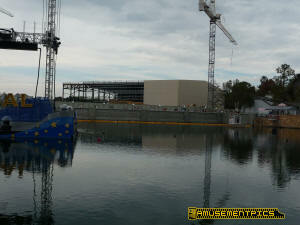 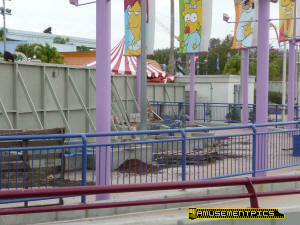 There's a lot of site prep work happening along the Simpsons waterfront. 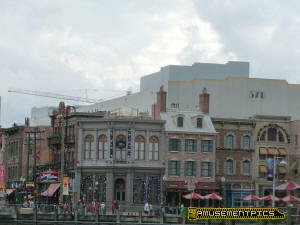 Still taking away the old stuff to build the new. 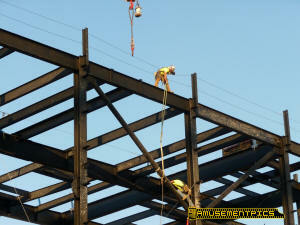 IFFF is down to the steel. 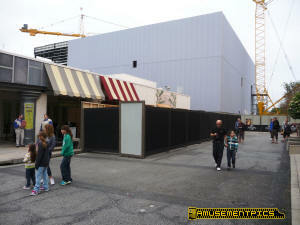 new elements of the new restaurant. The building is now an empty shell. 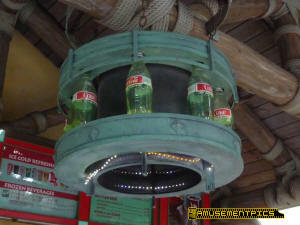 the Coke bottle stand. 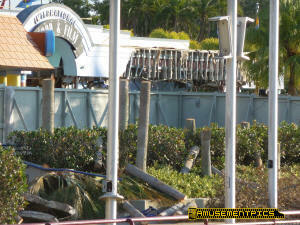 A couple of last minute rehab projects are happening in Islands. 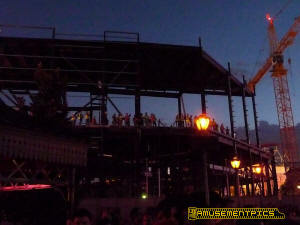 With the big crowds coming, I guess they'll be done soon. 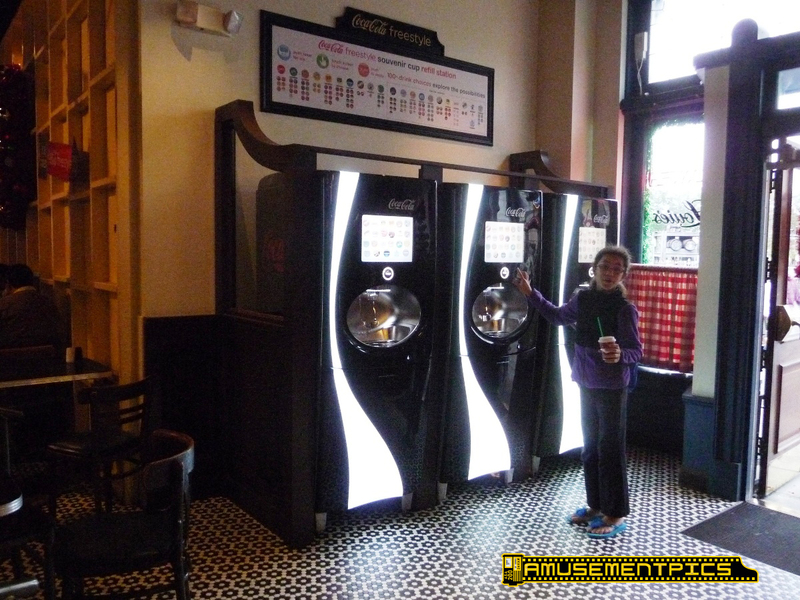 So, apparently all these new machines are ONLY for use with the all day refill cups. 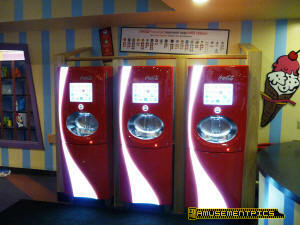 The cups seem to used RFID to activate the machine. Several guests were trying to fill non-Freestyle All Day cups and the machine doesn't let them do it. 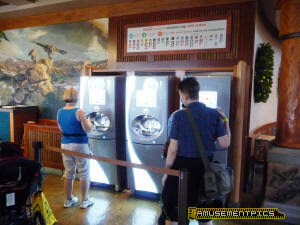 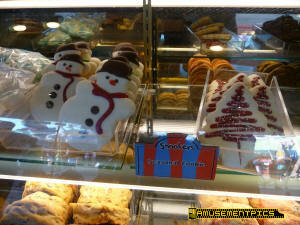 The existing Freestyle machines in Richters and Lost Continent seem to still do single serve. 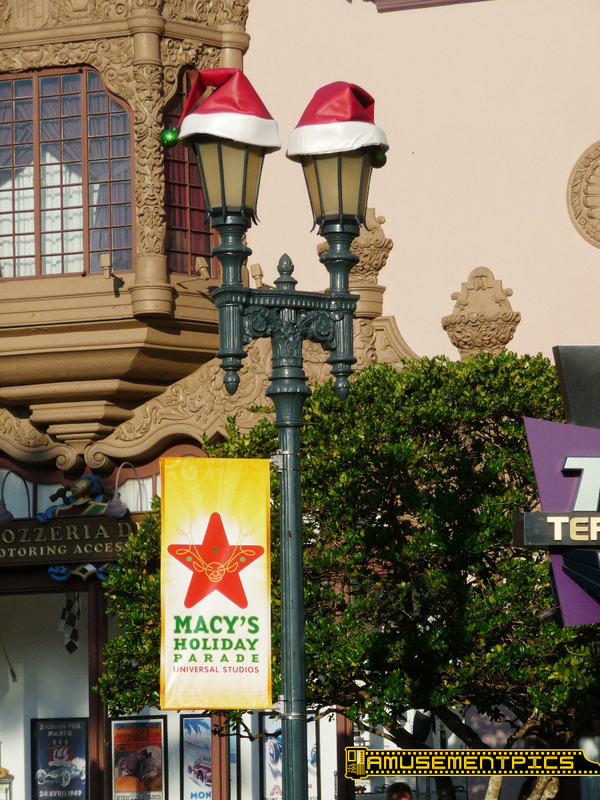 hats today. Good for them! 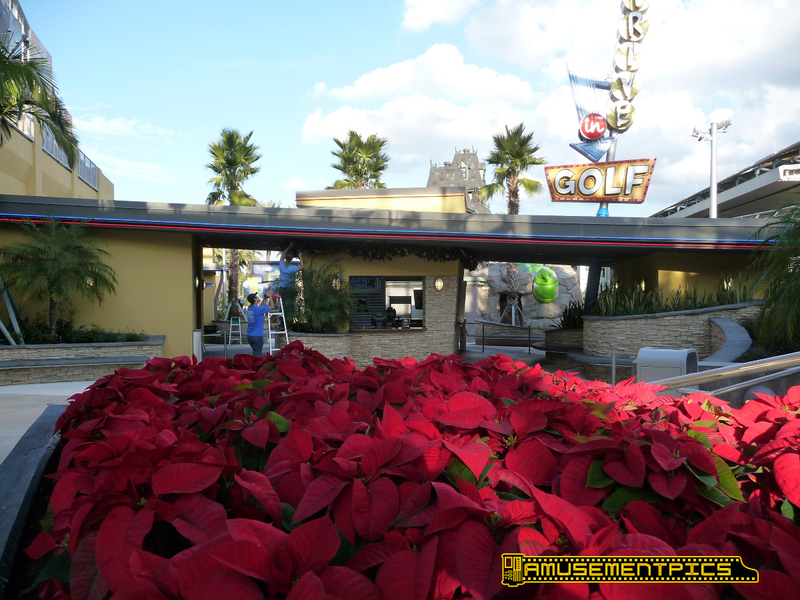 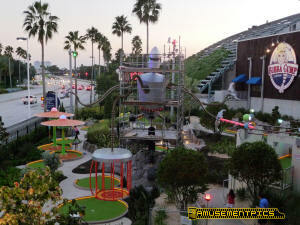 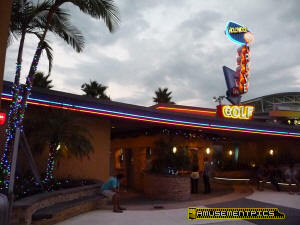 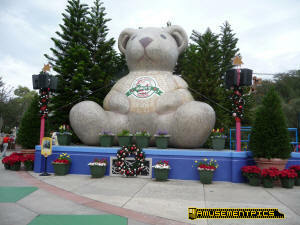 The mini golf course is getting decked out for Christmas. 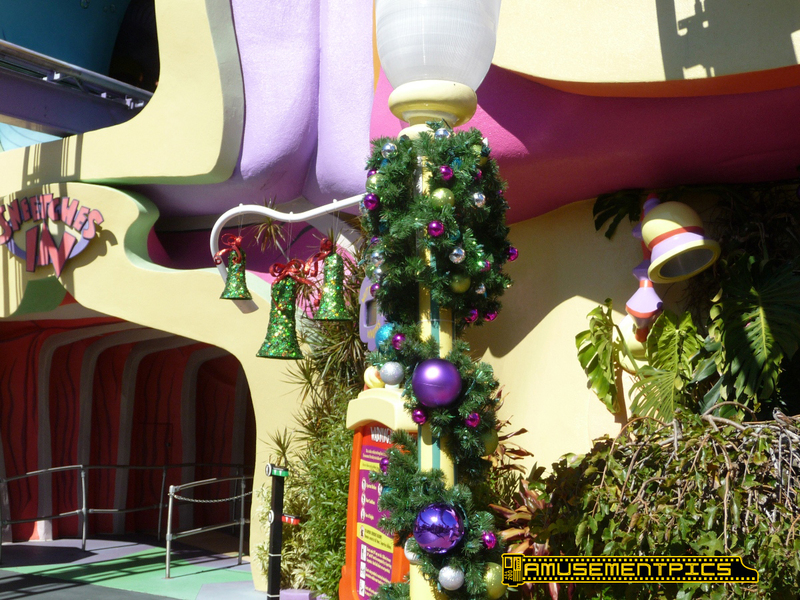 Lights are going up on a lot of the trees and bushes. 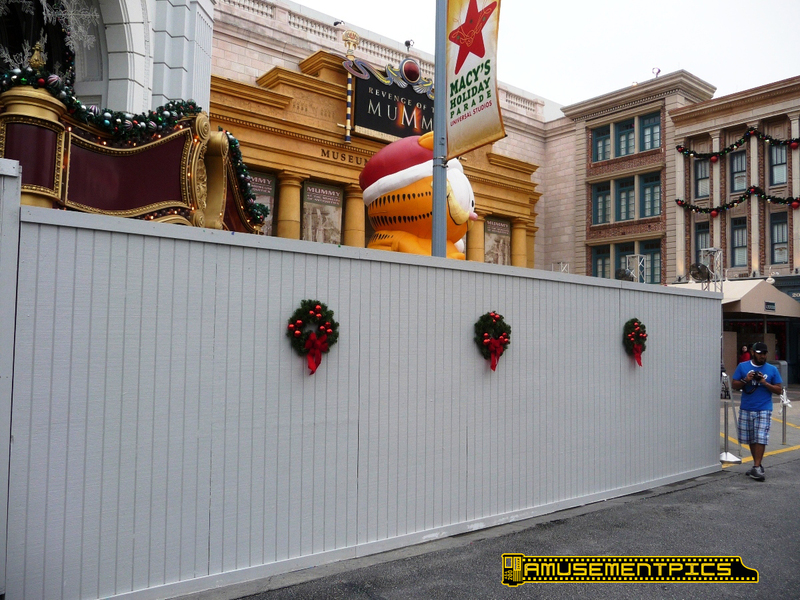 It looks like they're not finished decorating yet. 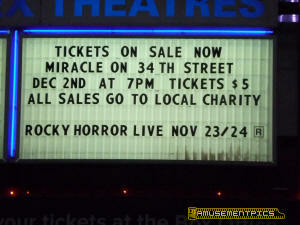 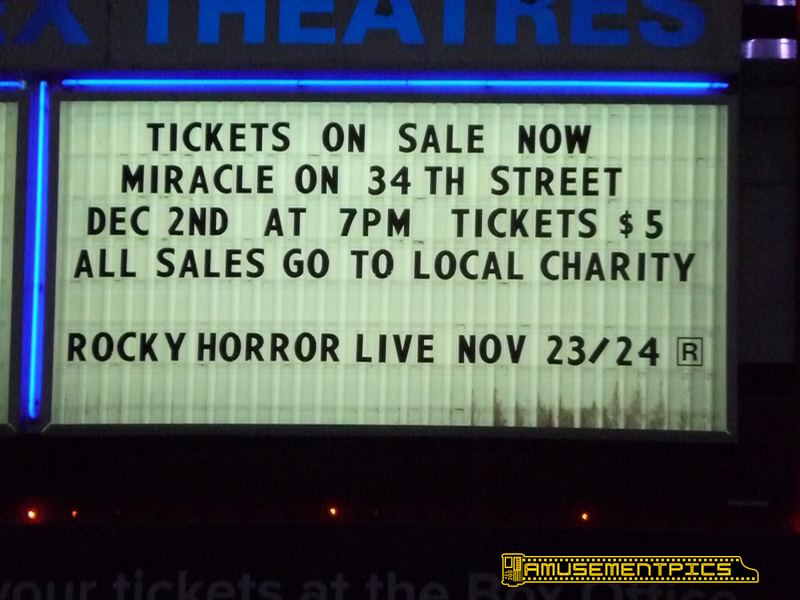 Another great old movie being screened at the theater, this one a charity benefit. 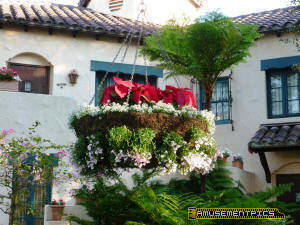 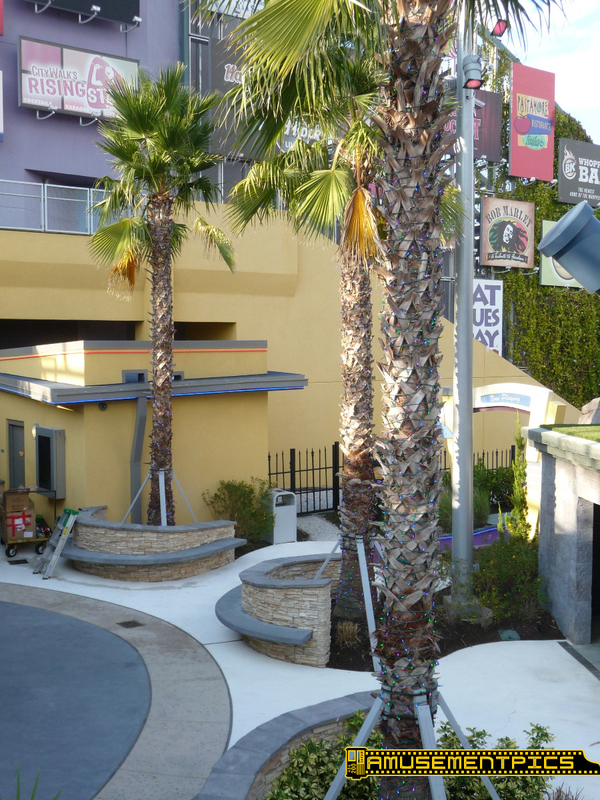 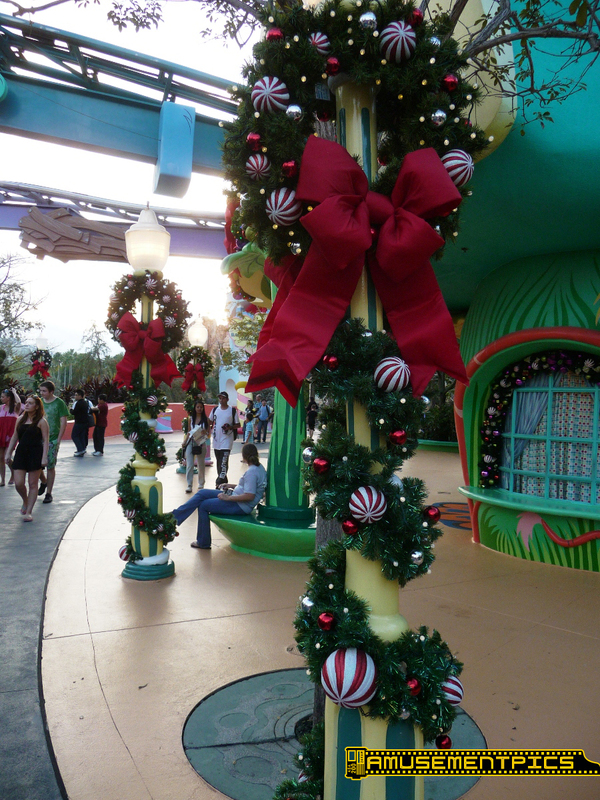 Garlands are up all around City Walk. 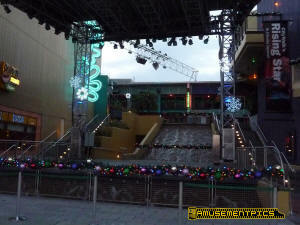 The snowflakes around the walkways are really cool. 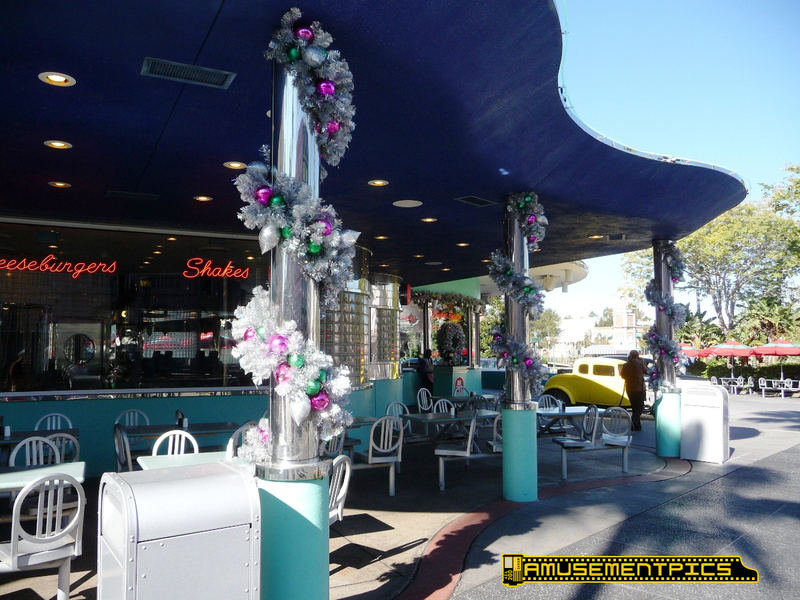 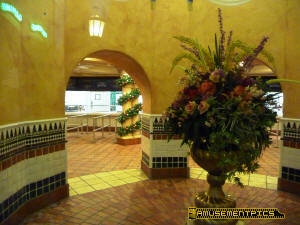 More lights and garlands along all of the restaurants. 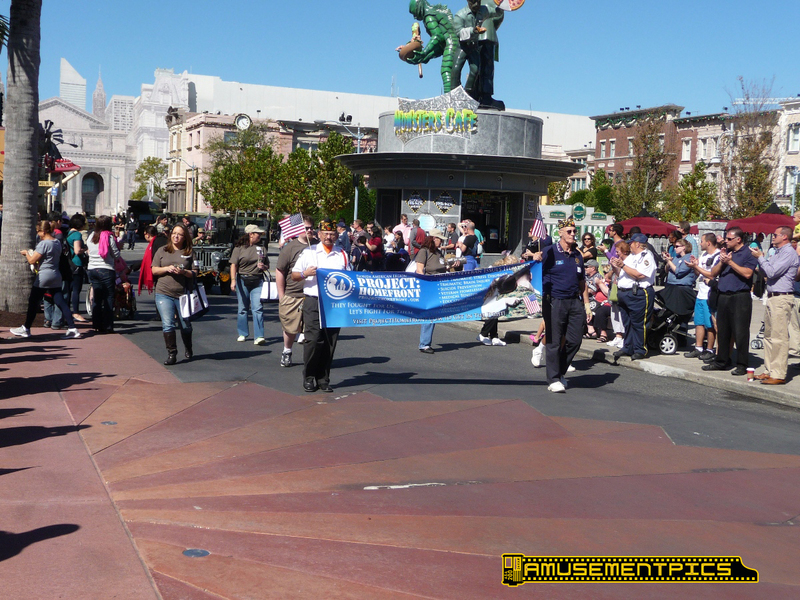 the Studio Store The parade route is lined with banners. 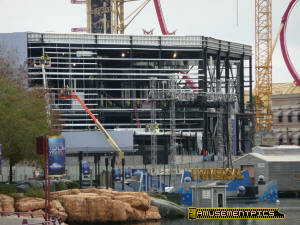 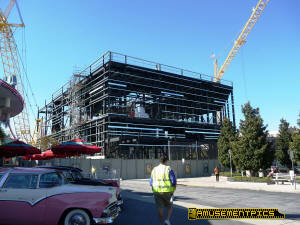 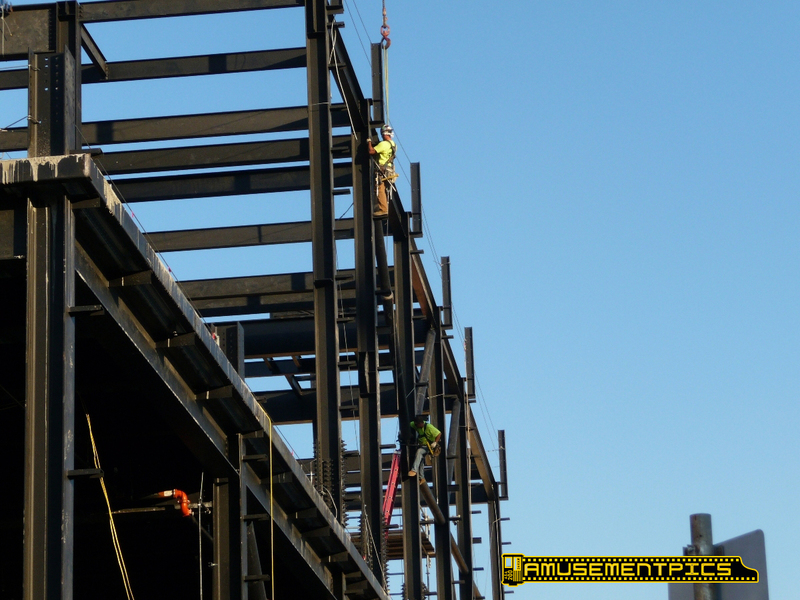 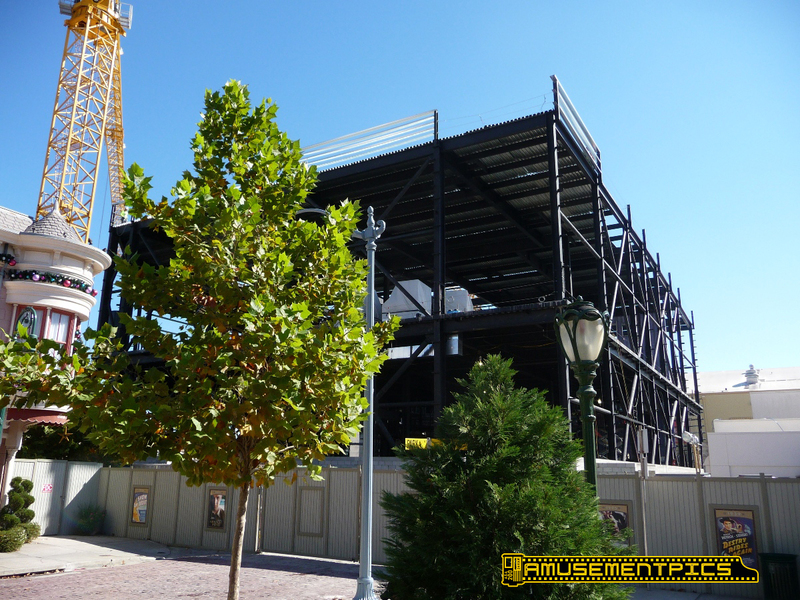 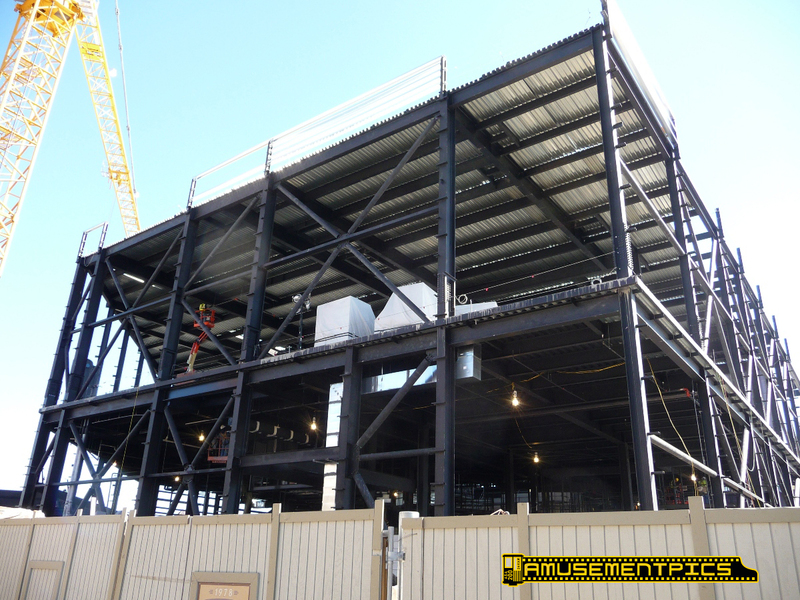 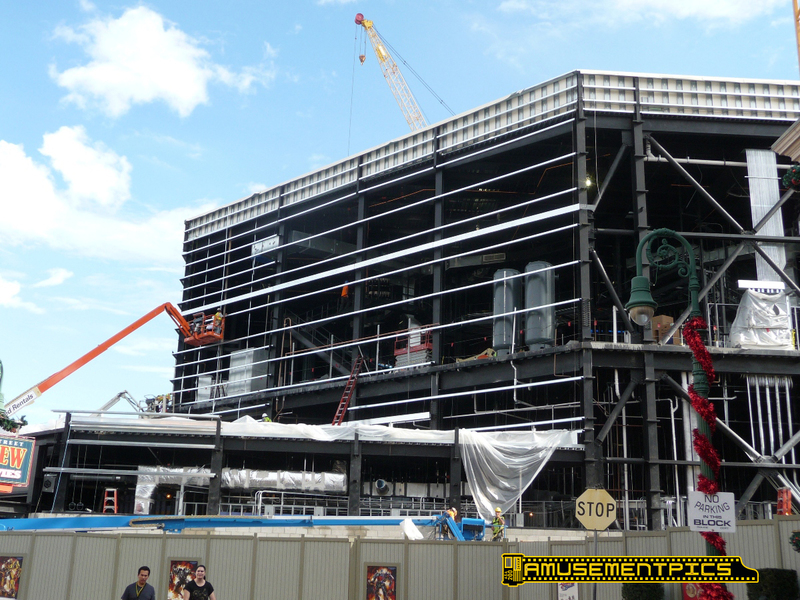 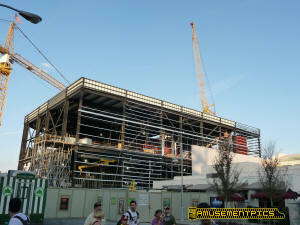 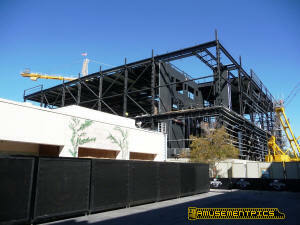 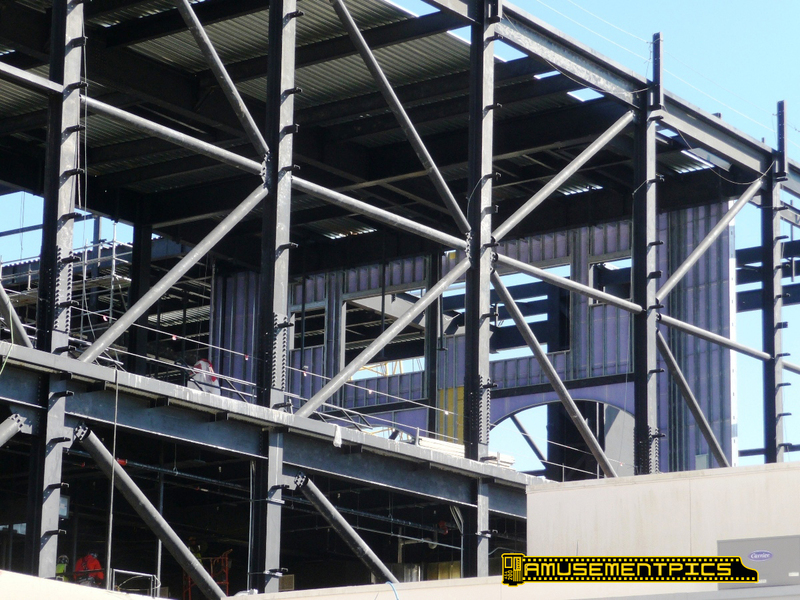 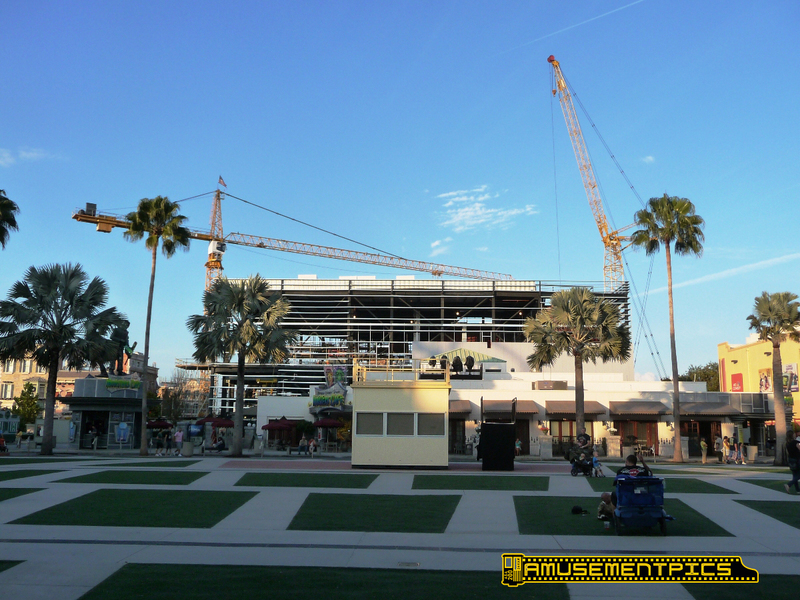 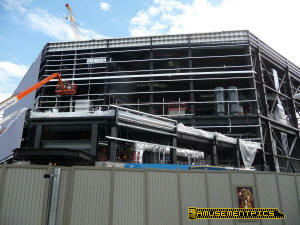 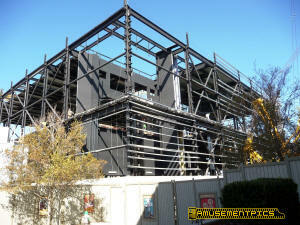 Exterior walls are going up very quickly on the Transformers building. 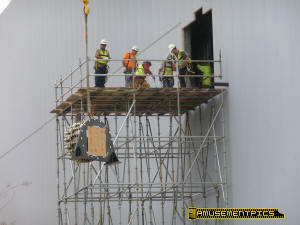 Teams are hard at work all over the inside and the outside of the building. 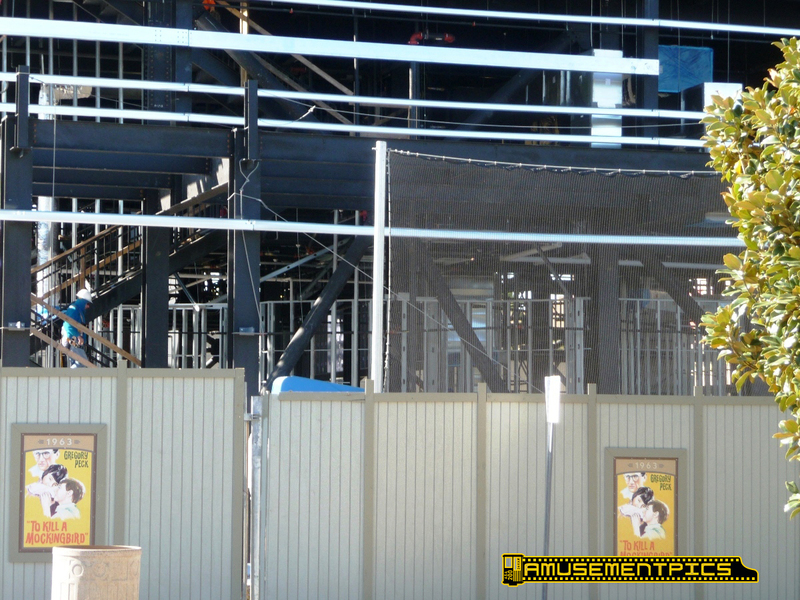 There are a couple of these curved walls visible inside the building. 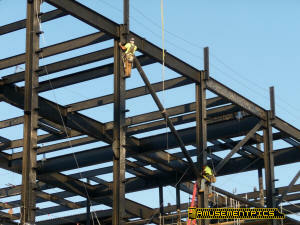 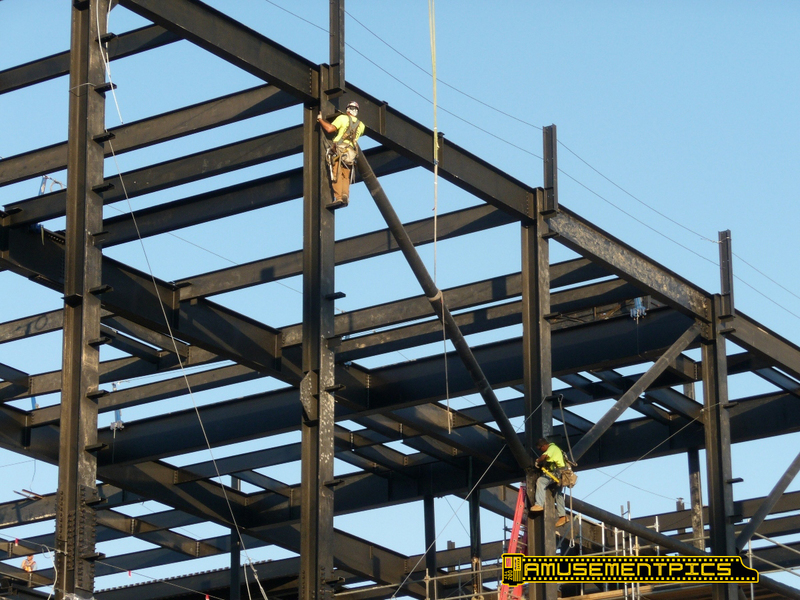 Lots of mechanical work and wiring going into the building. 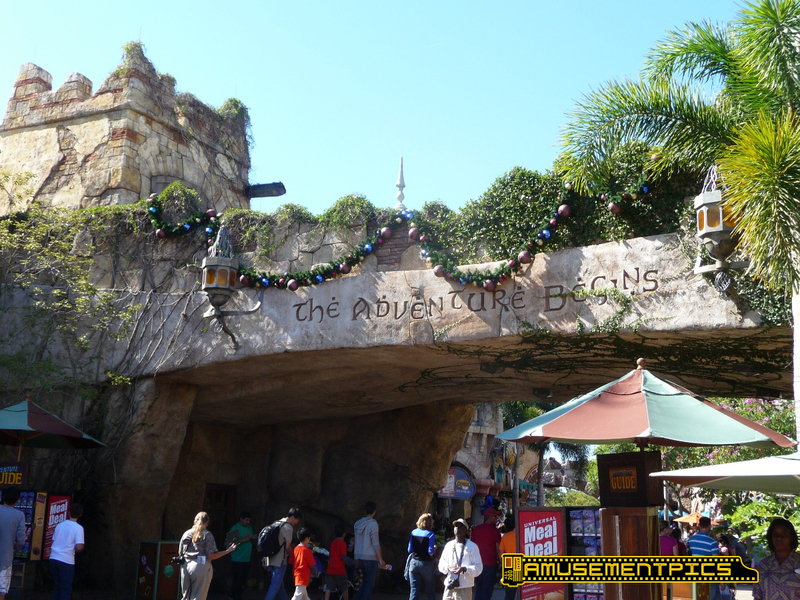 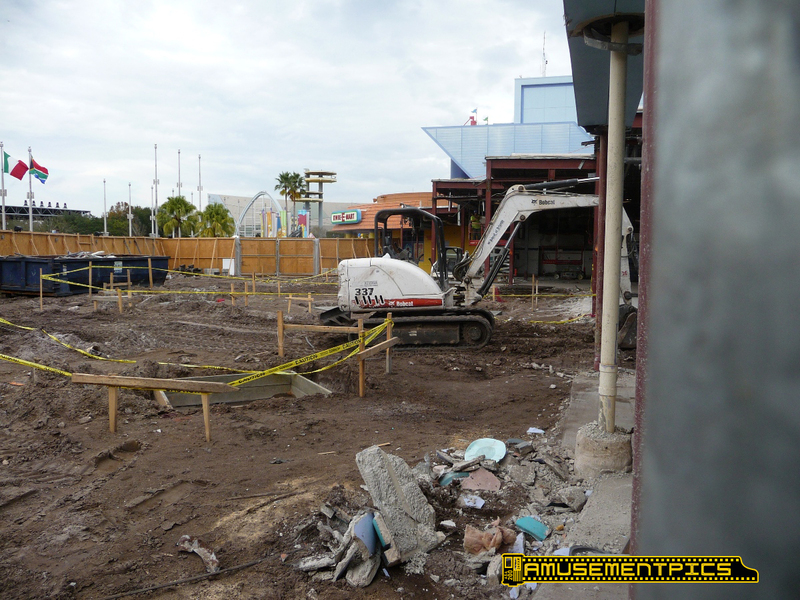 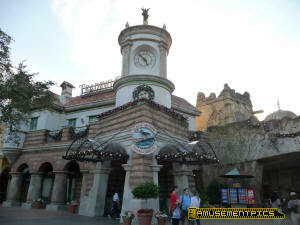 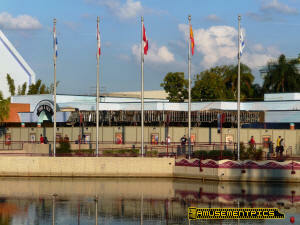 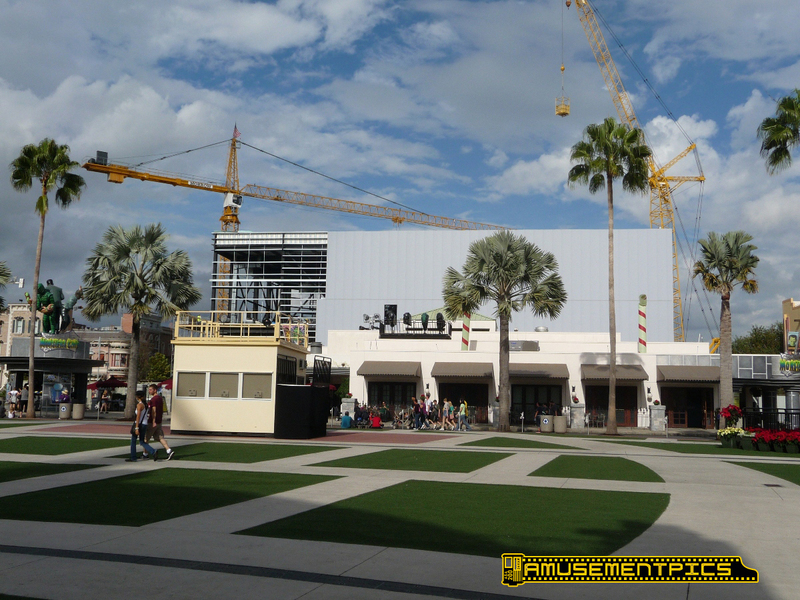 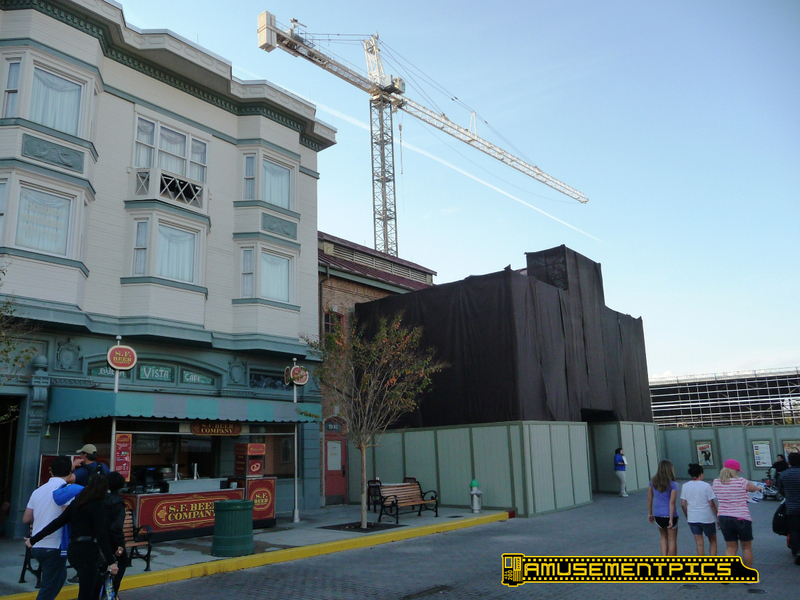 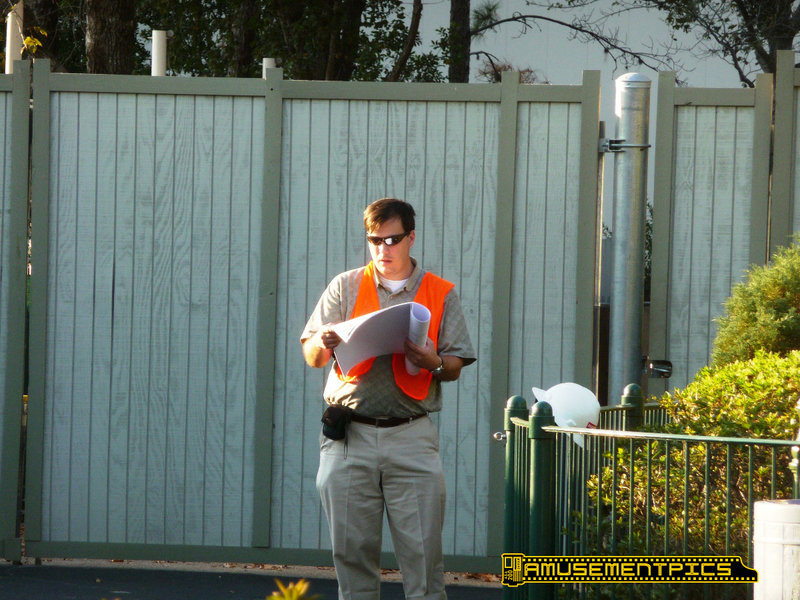 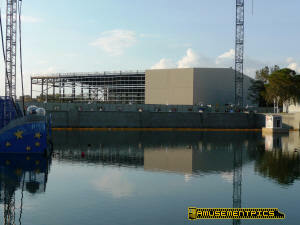 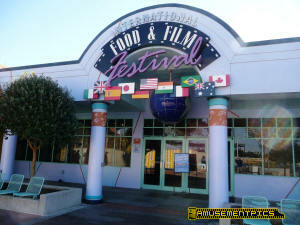 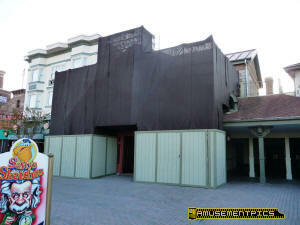 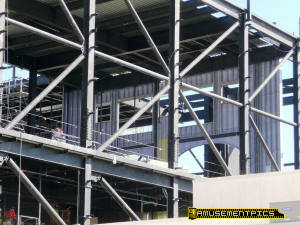 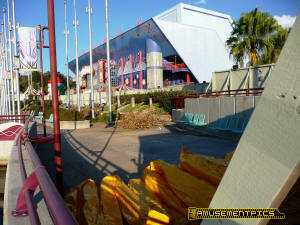 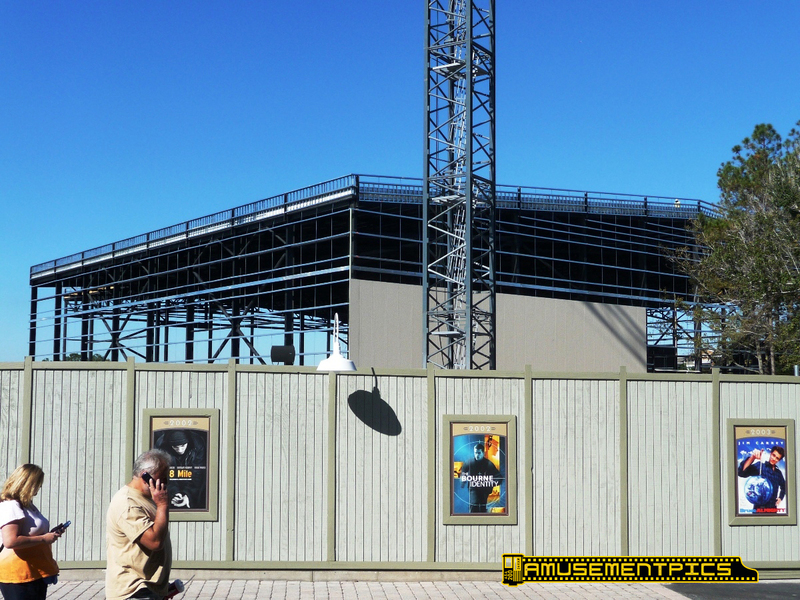 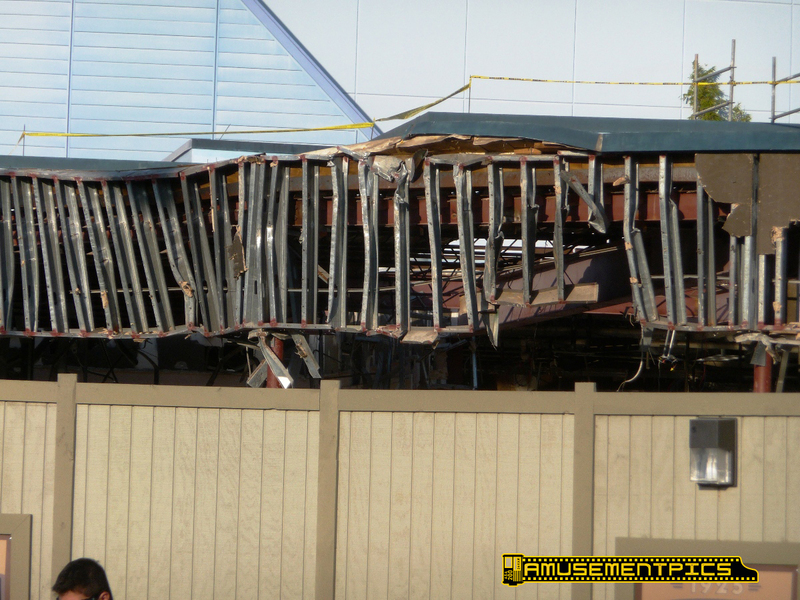 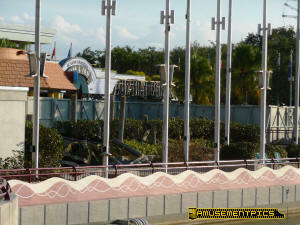 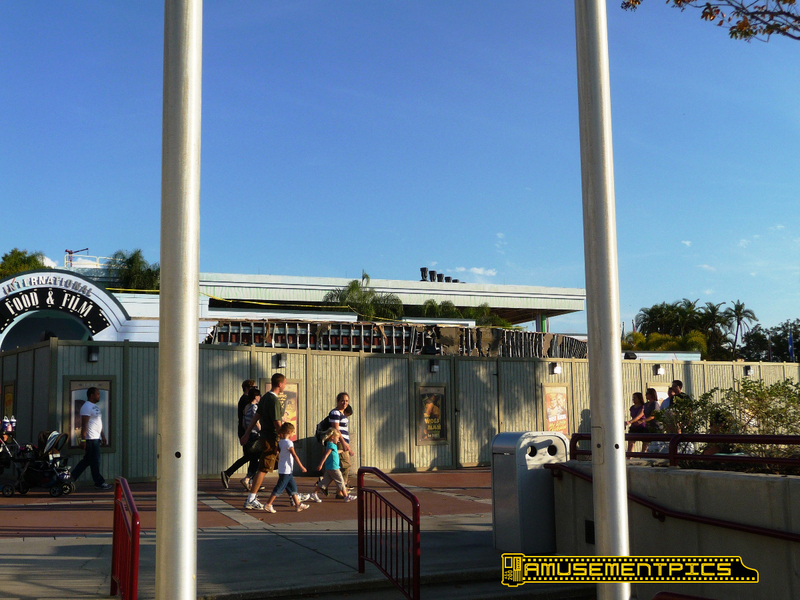 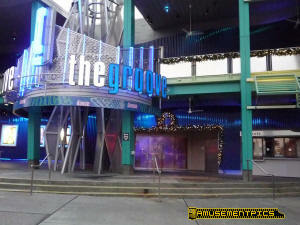 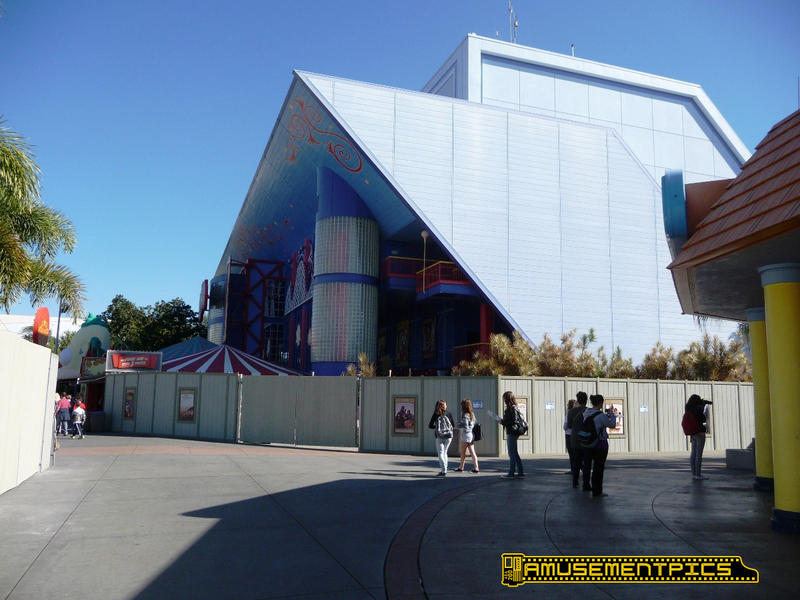 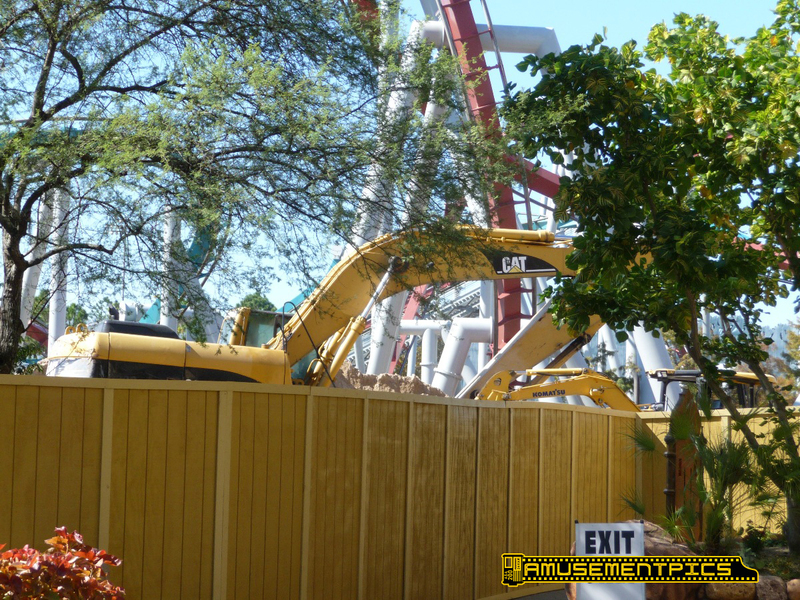 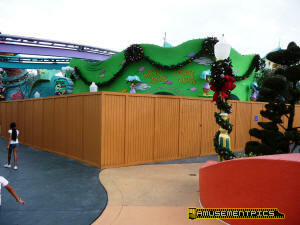 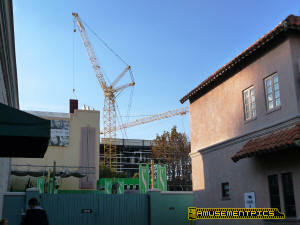 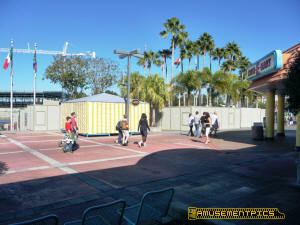 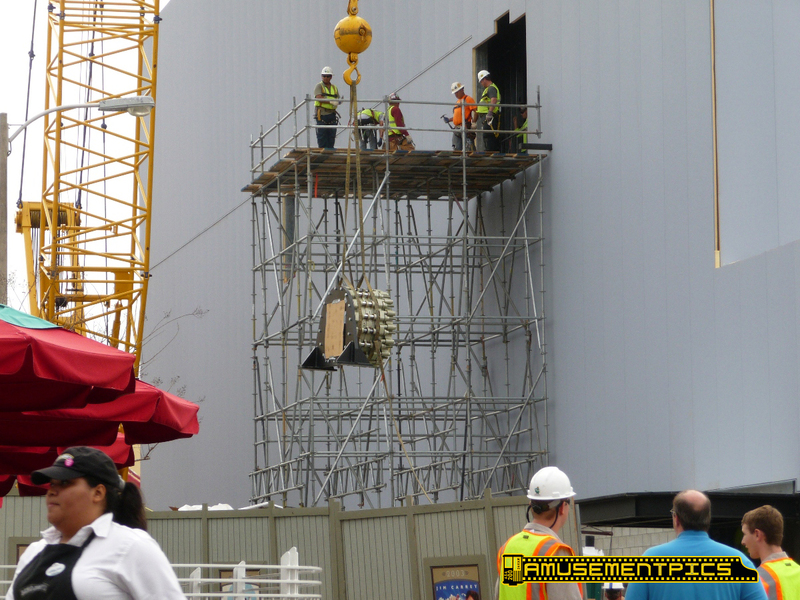 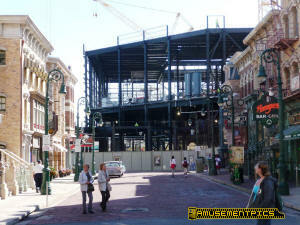 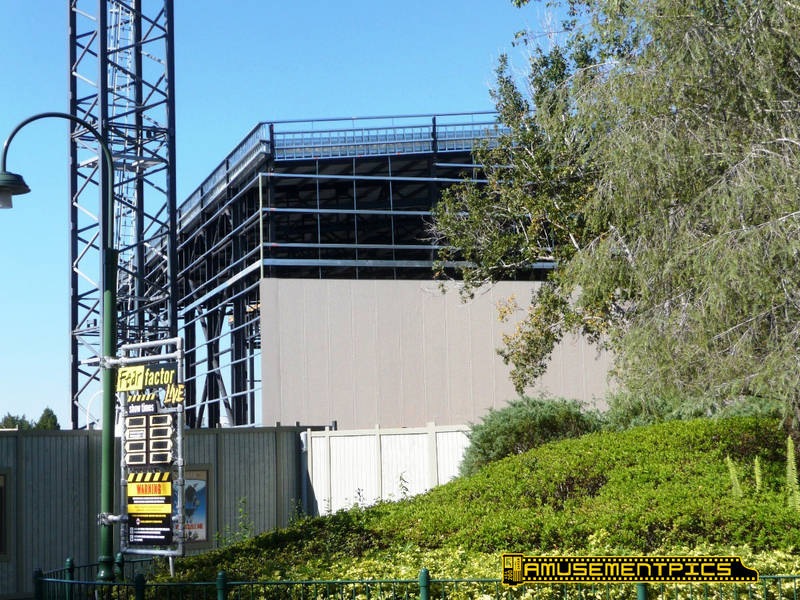 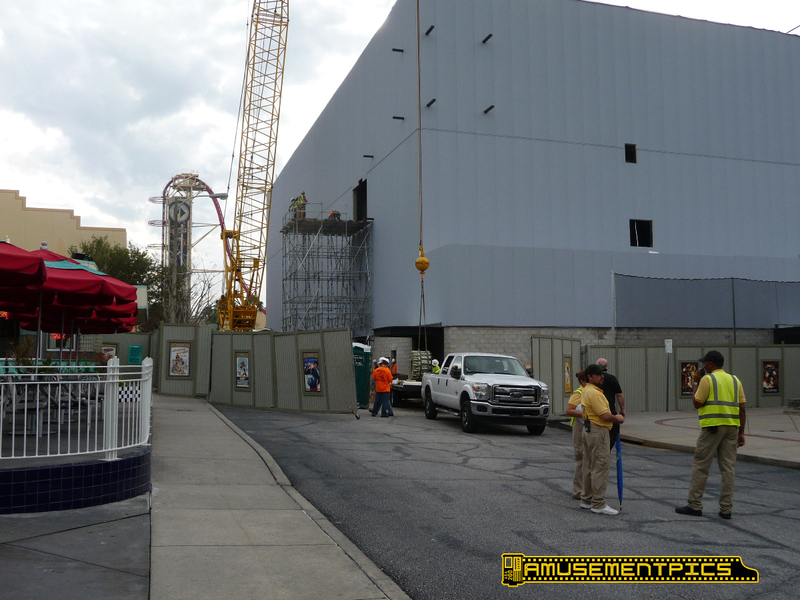 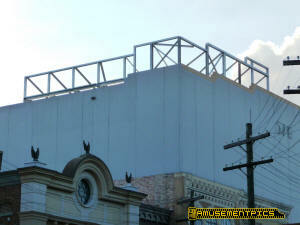 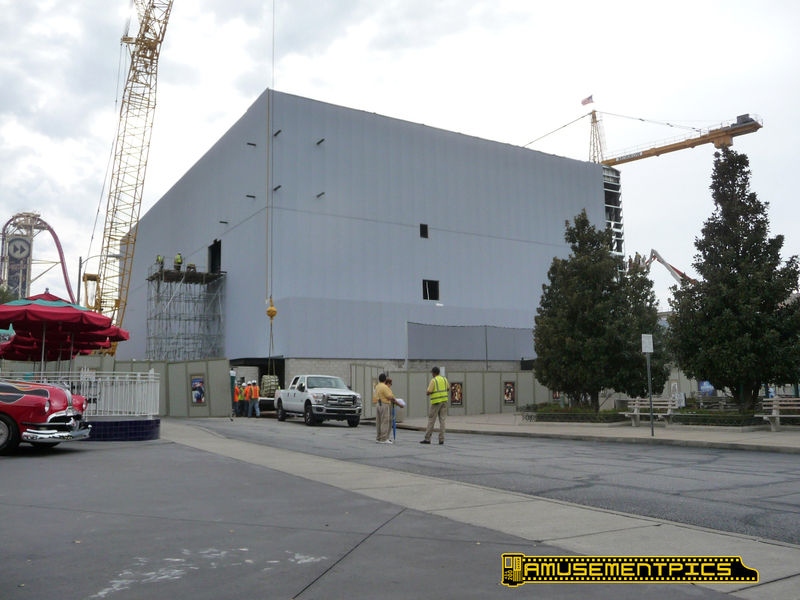 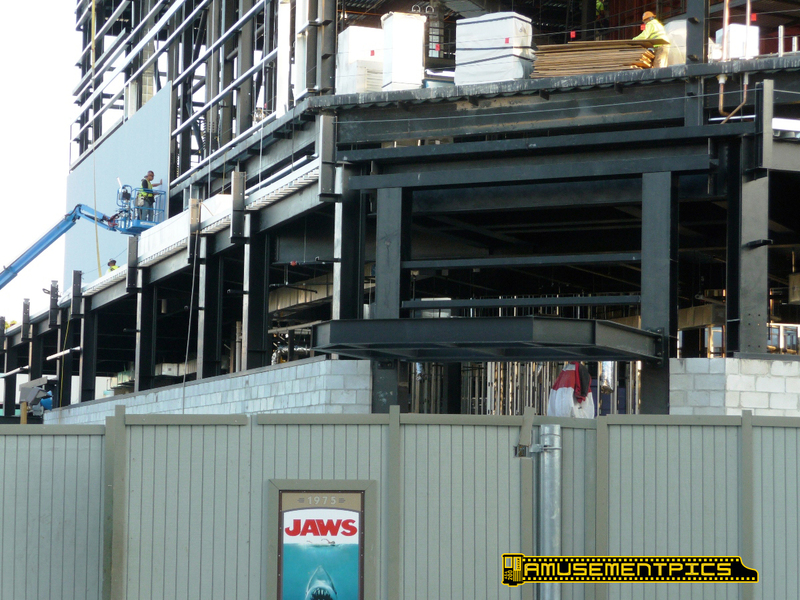 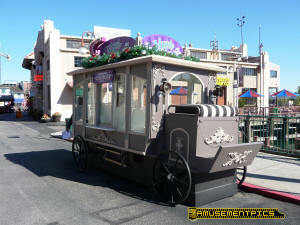 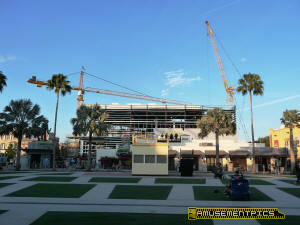 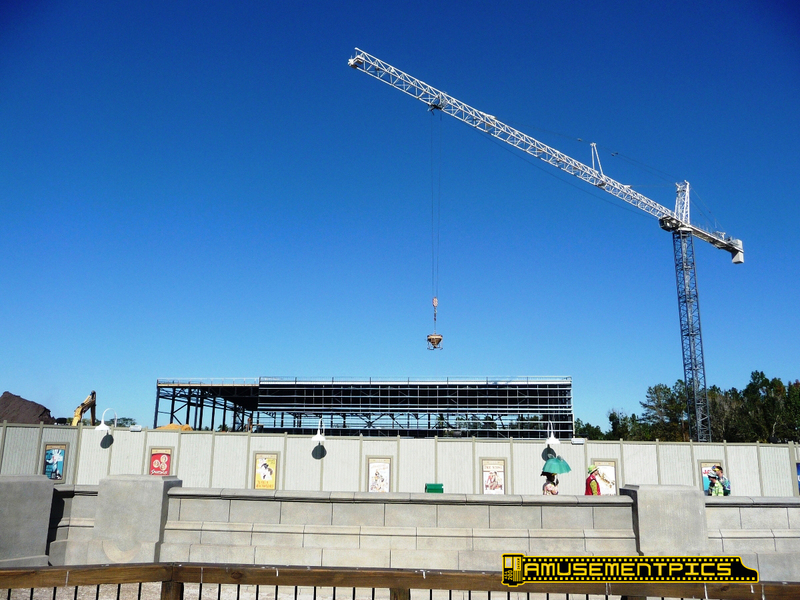 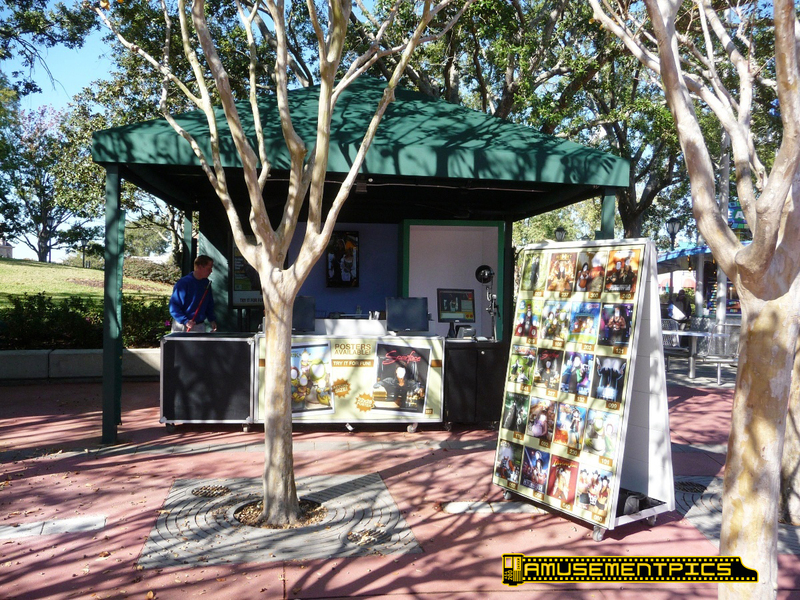 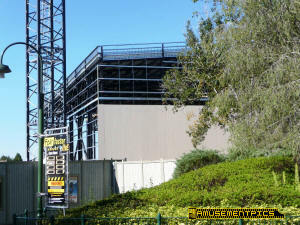 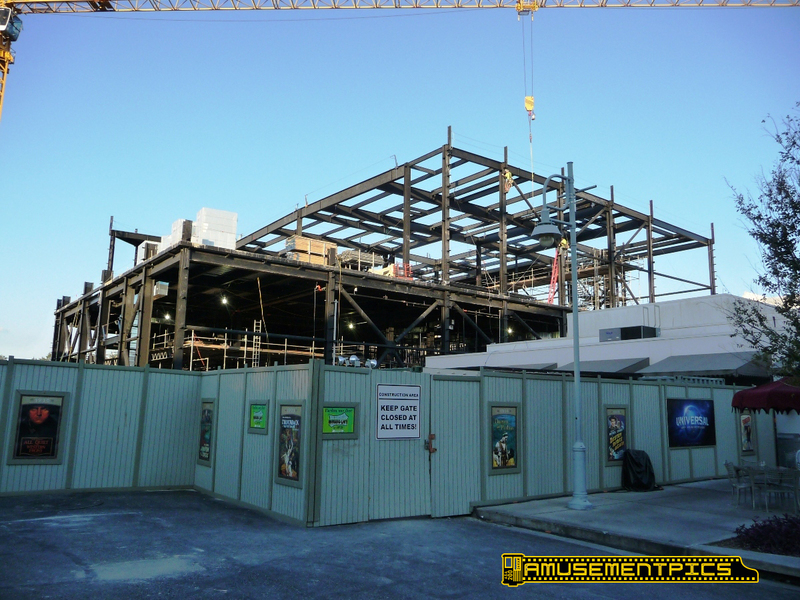 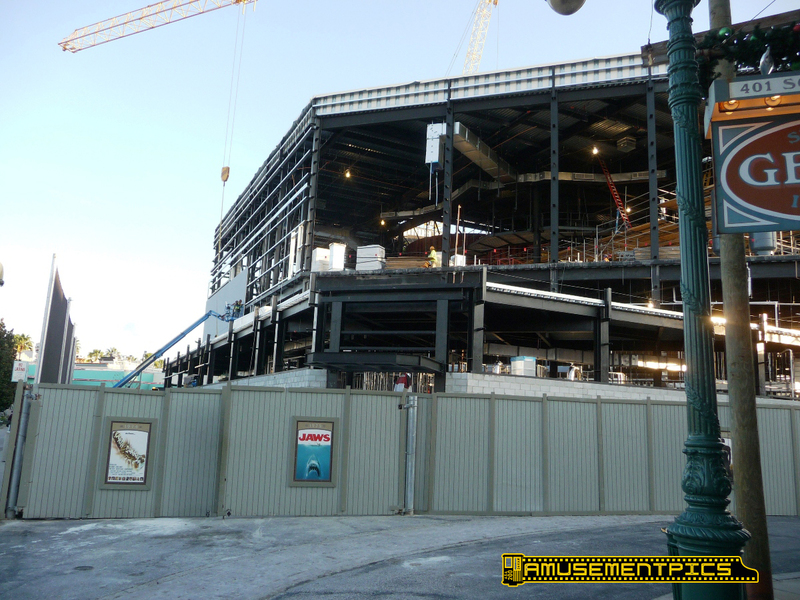 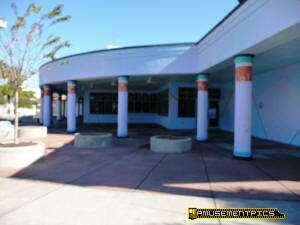 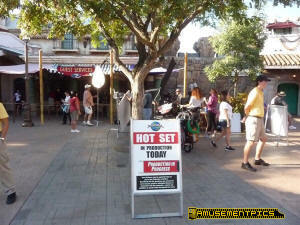 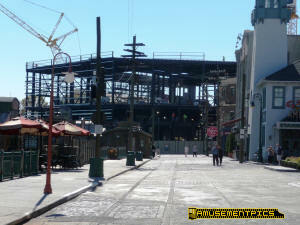 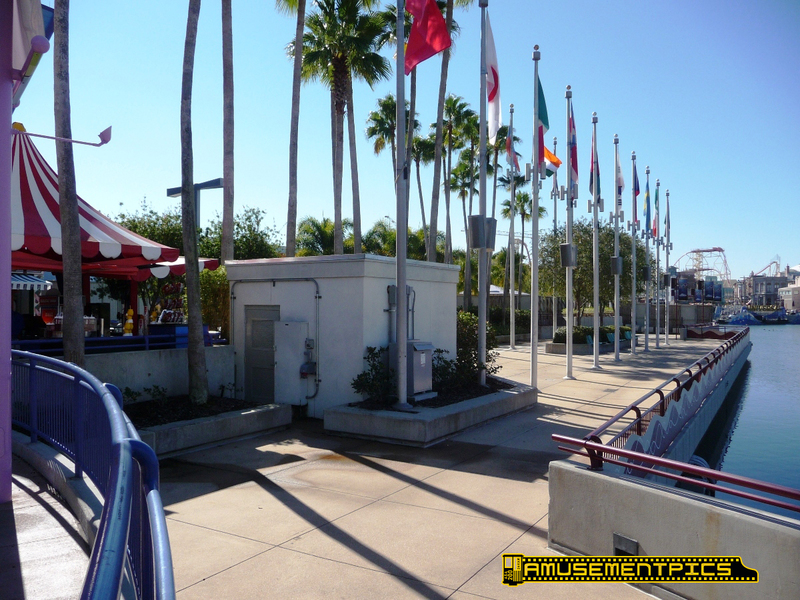 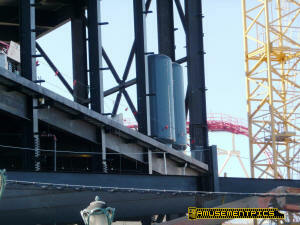 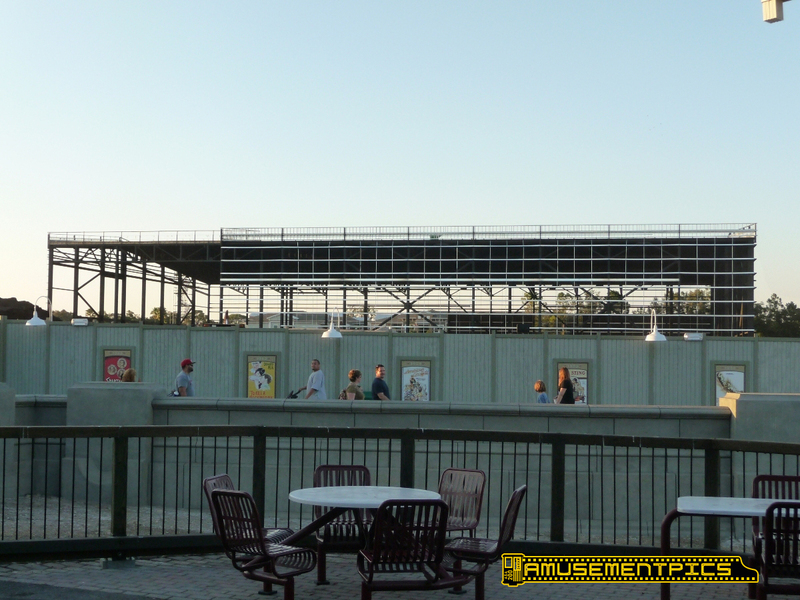 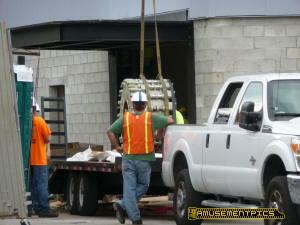 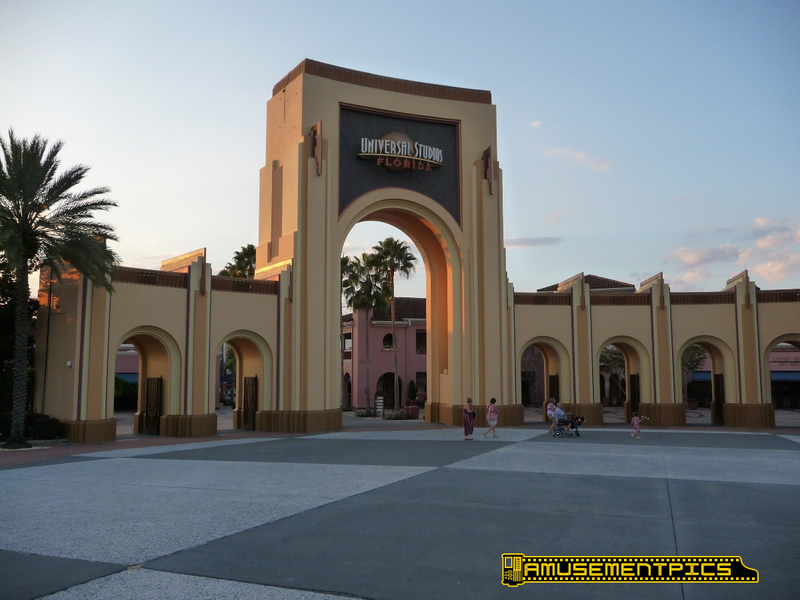 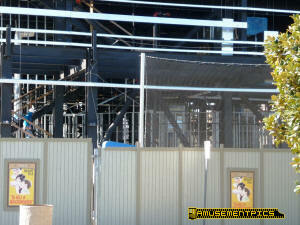 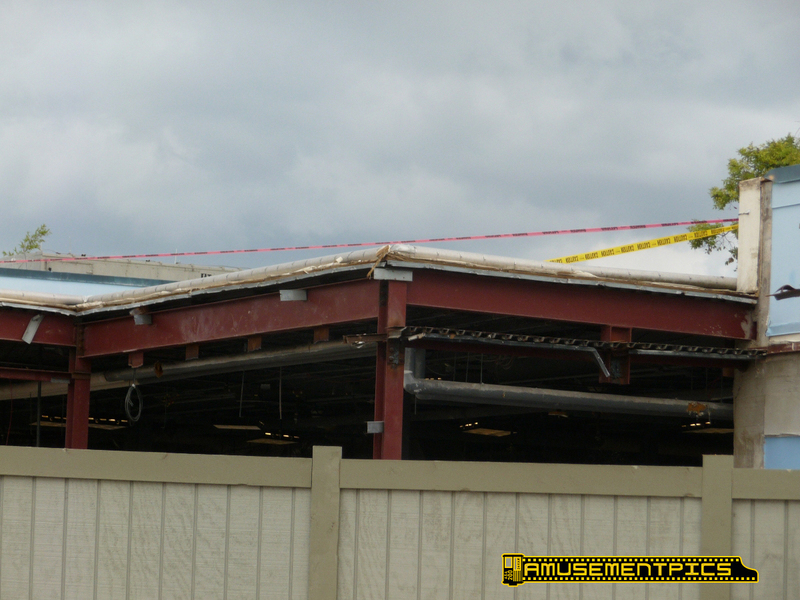 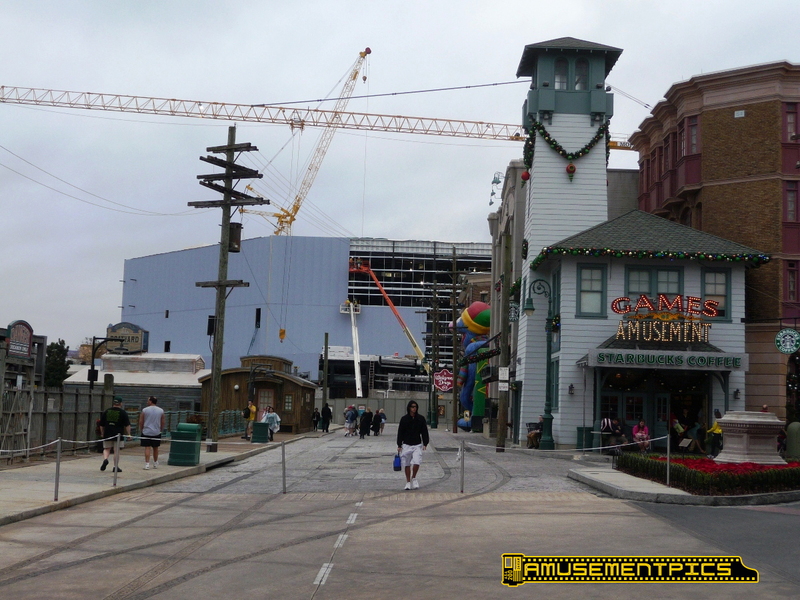 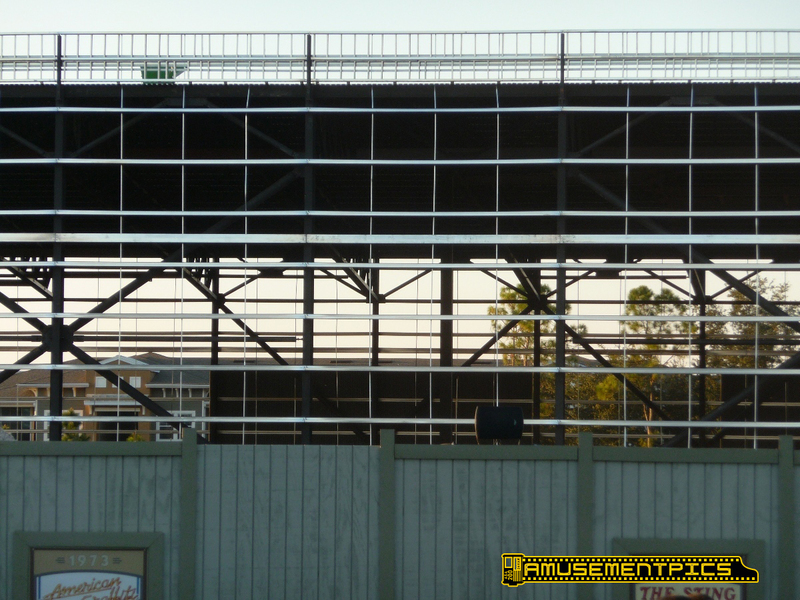 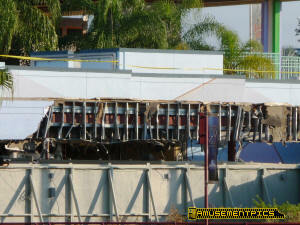 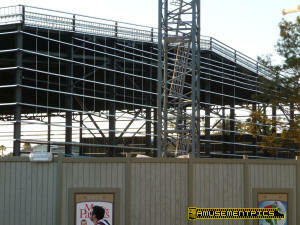 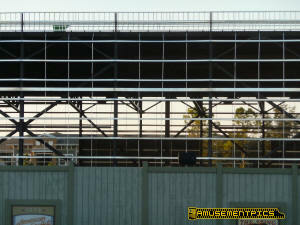 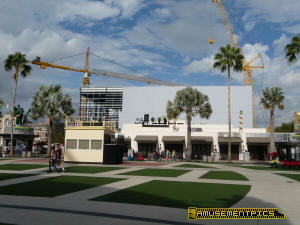 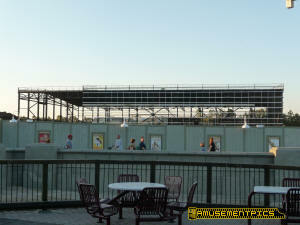 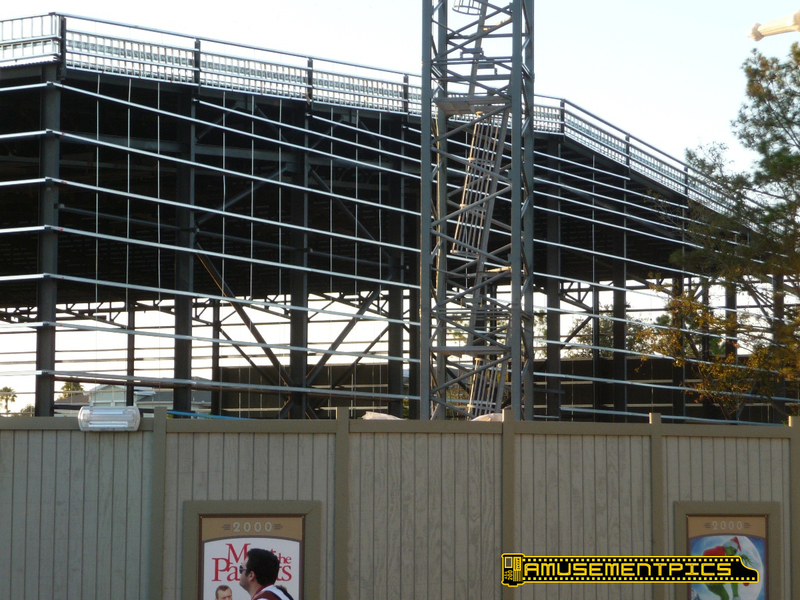 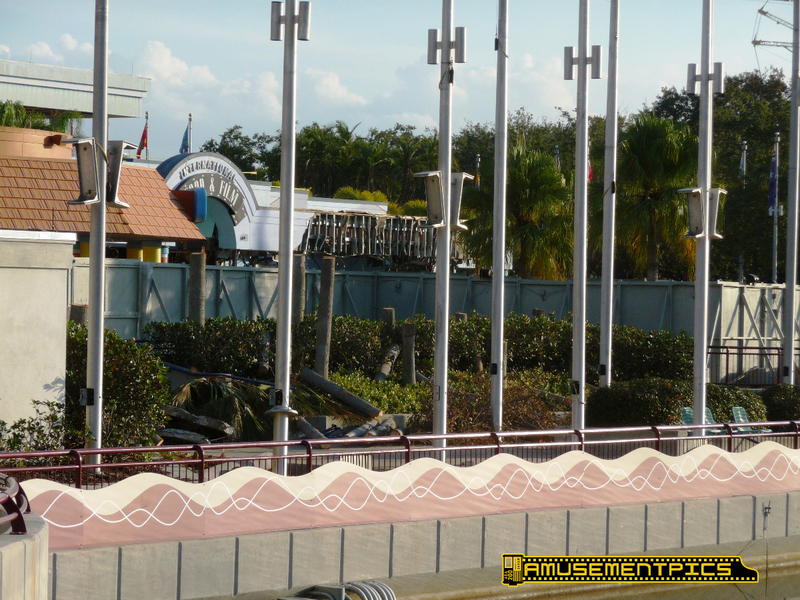 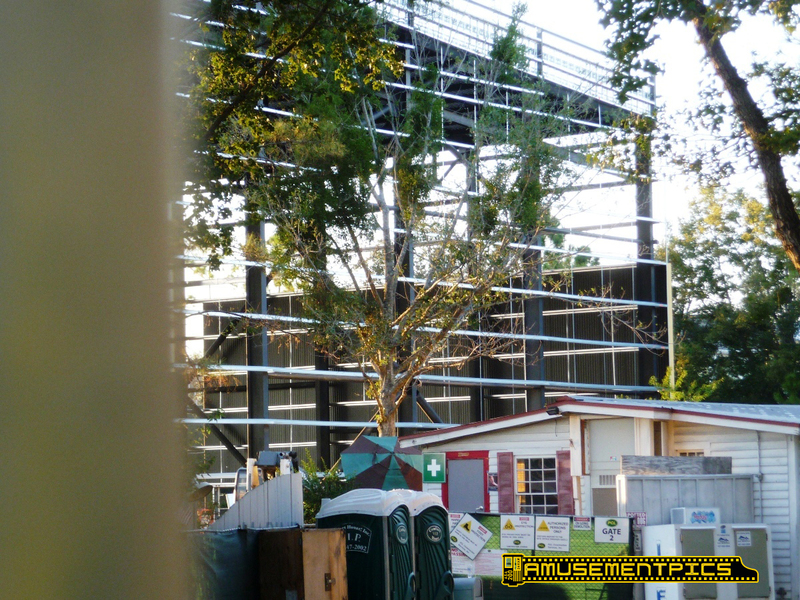 As I had suspected the angled wall will be the ride entrance, with a canopy being framed over the door now. 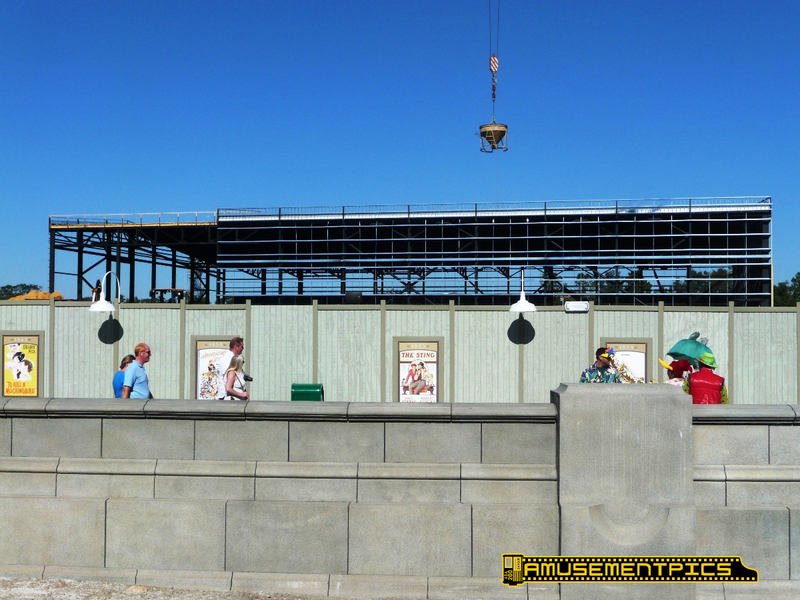 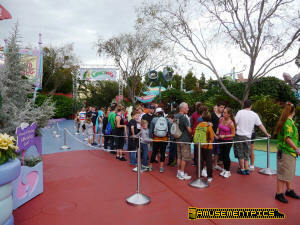 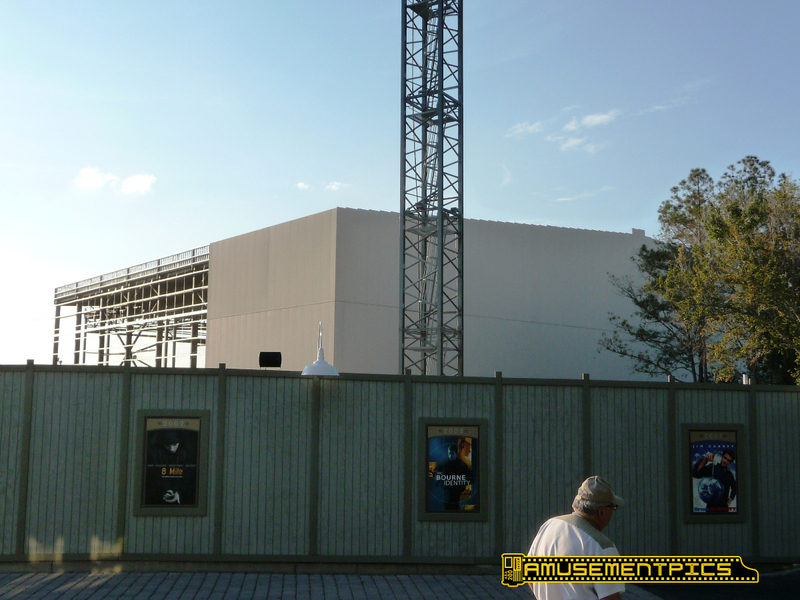 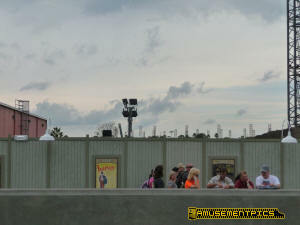 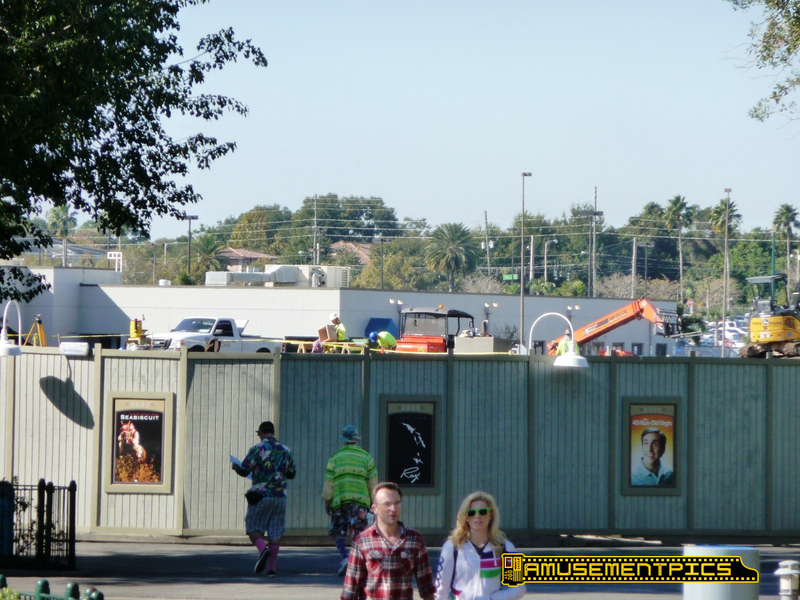 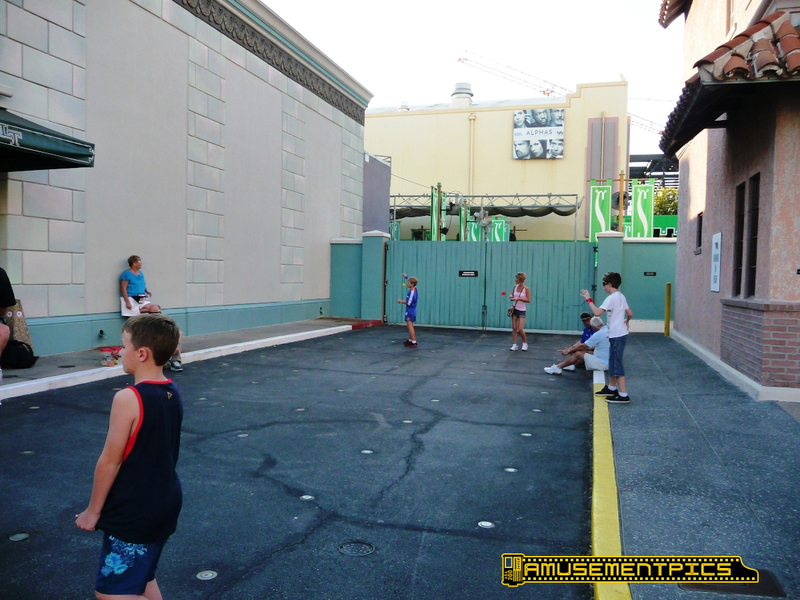 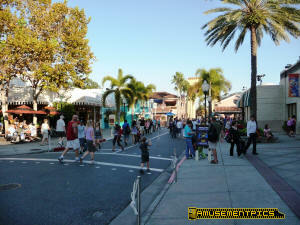 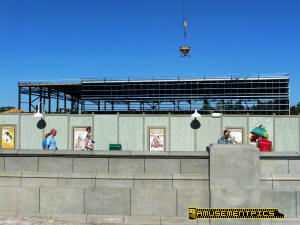 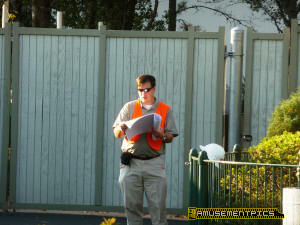 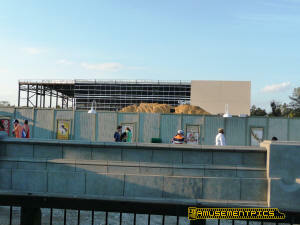 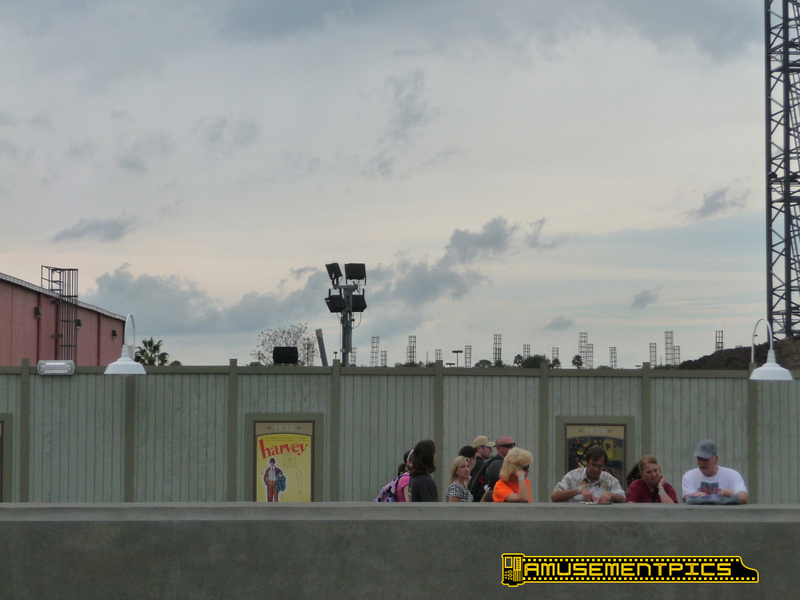 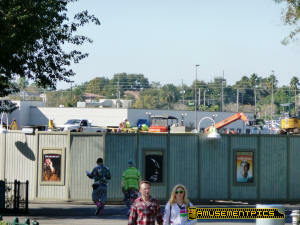 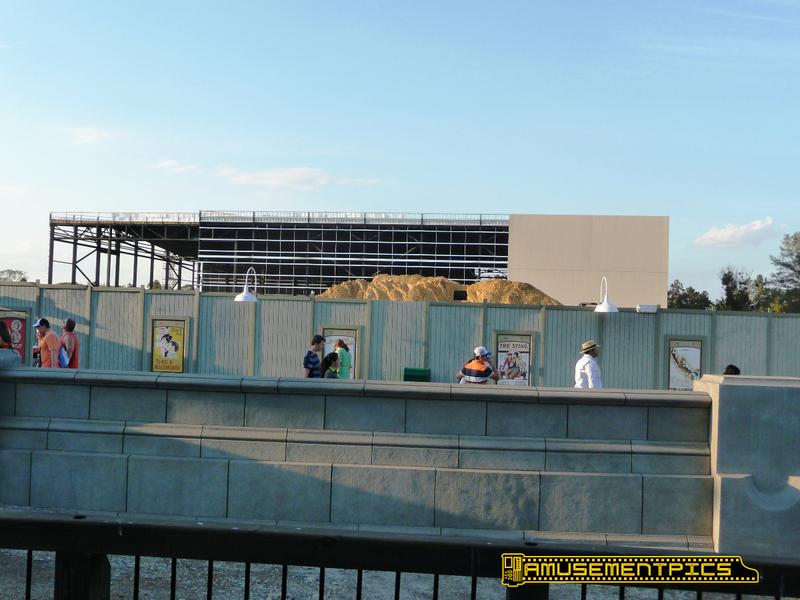 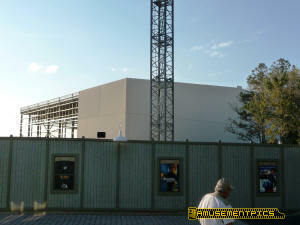 Concrete block walls are going up abound the queue area. The Transformers building is going to be really BIG! 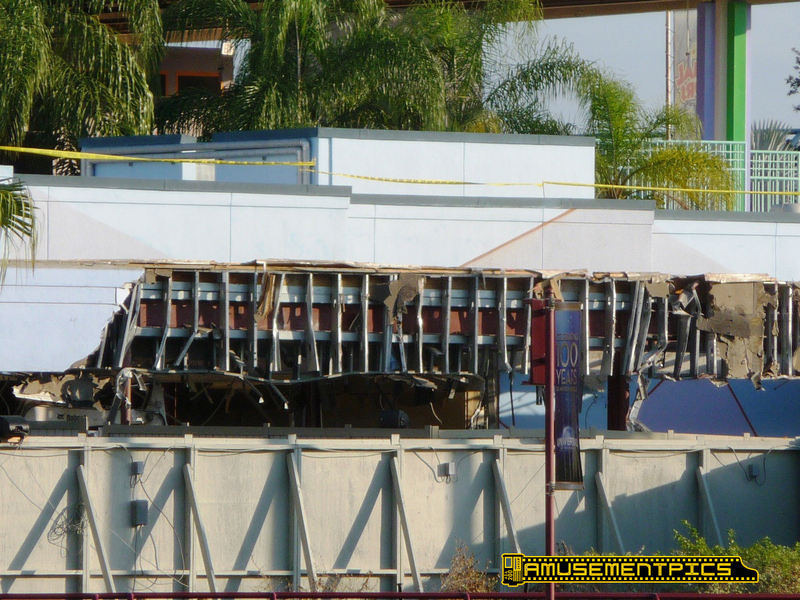 There's another curved wall. 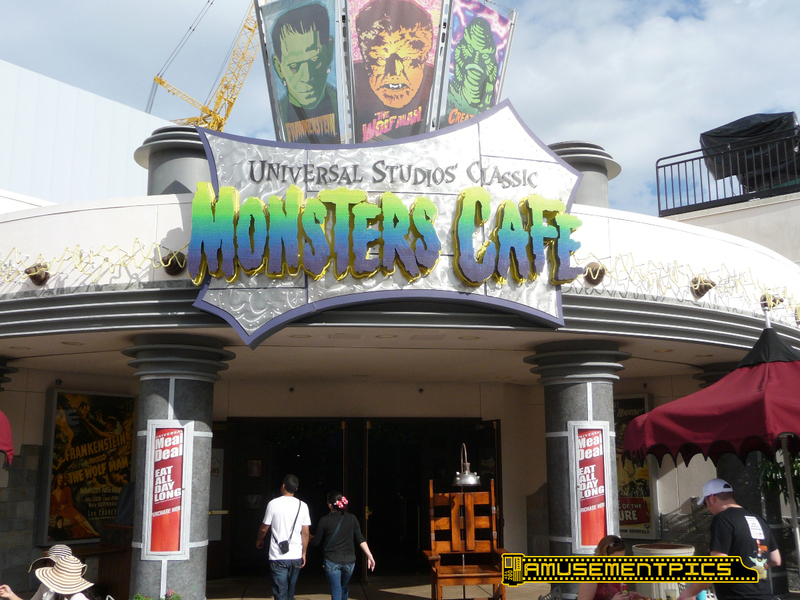 Monster Cafe looks tiny in comparison to Transformers. 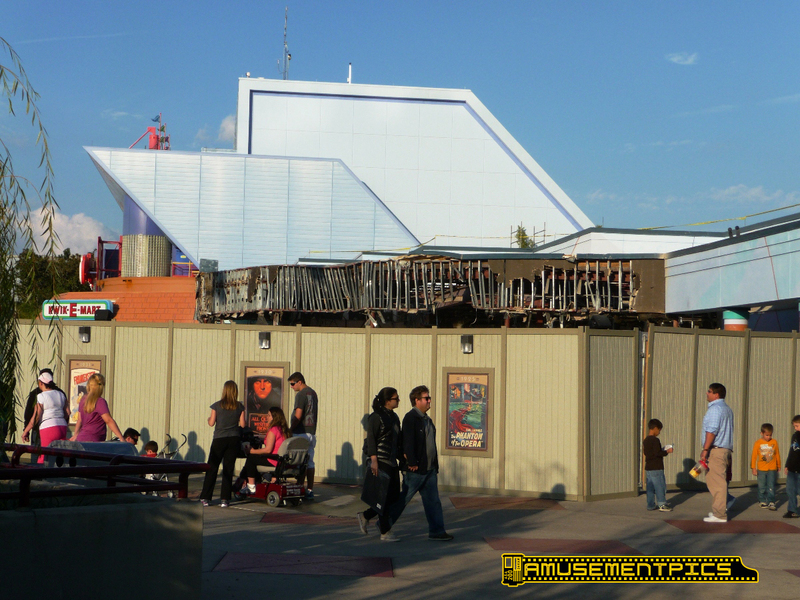 Work continues on IFFF, and it looks like the patio roof is being removed. 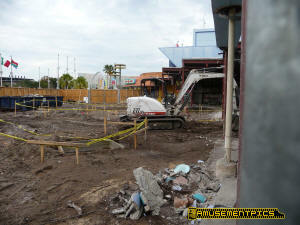 only the patio being demolished. 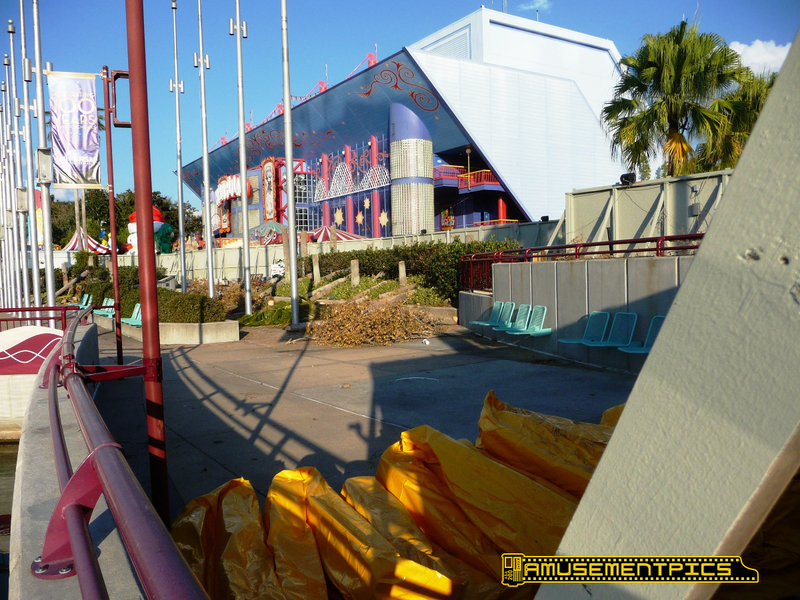 On the other side, trees are coming down. 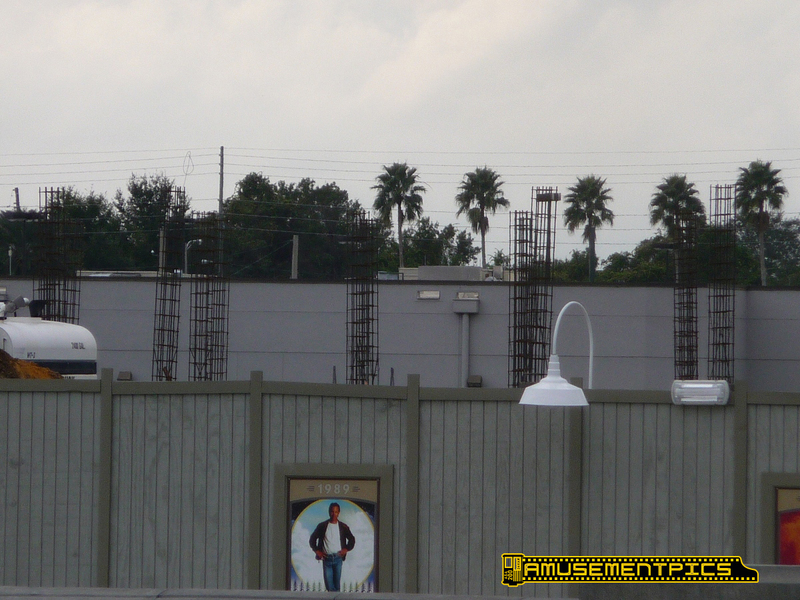 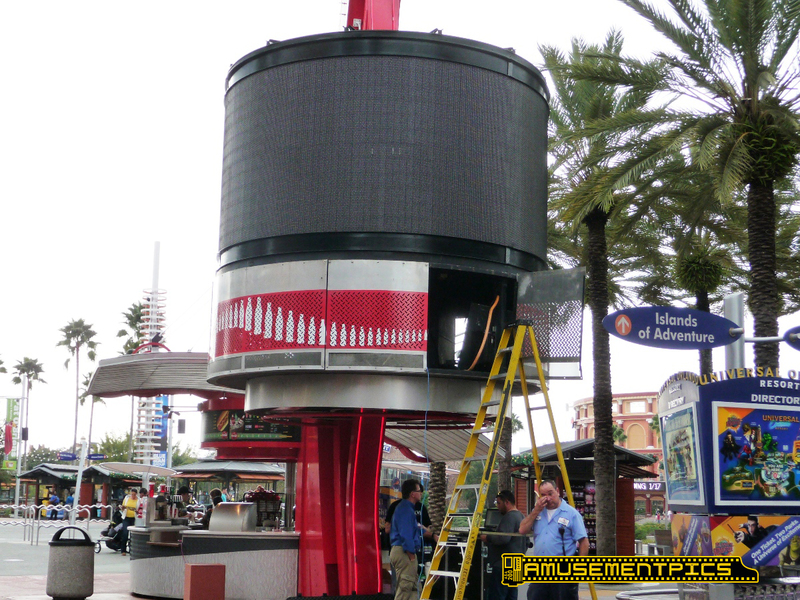 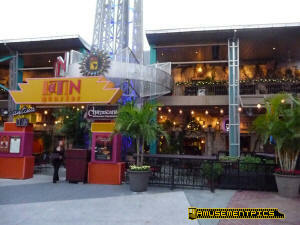 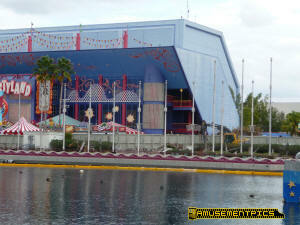 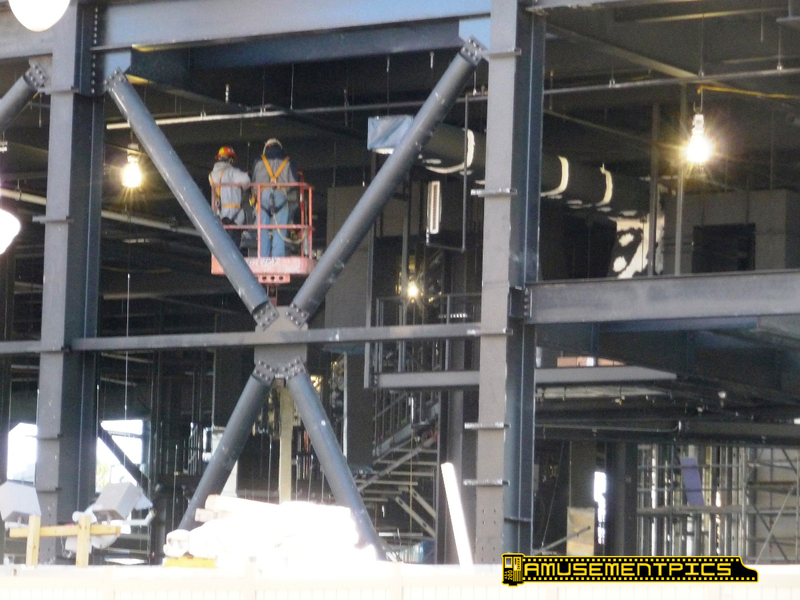 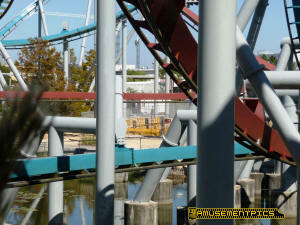 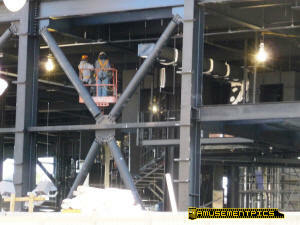 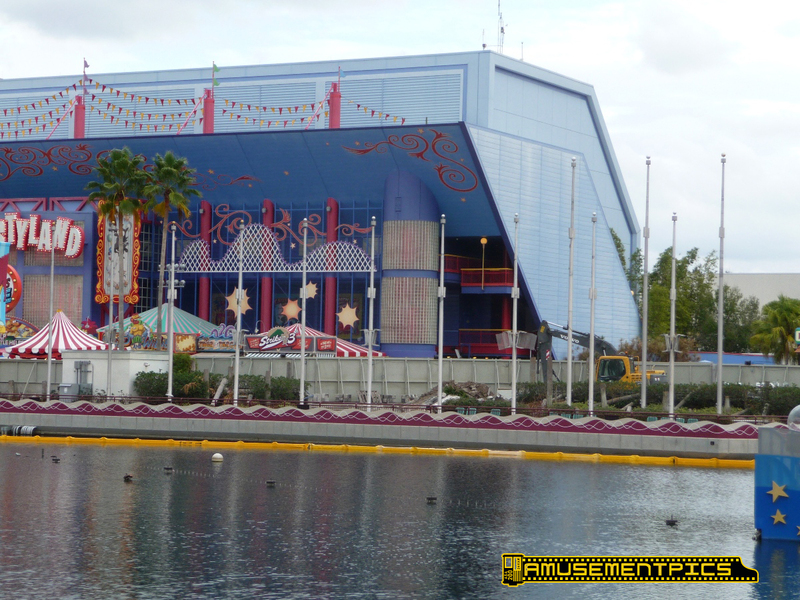 Depending on the rumor you hear this could either be a spinning flat ride coming in or a ferris wheel. 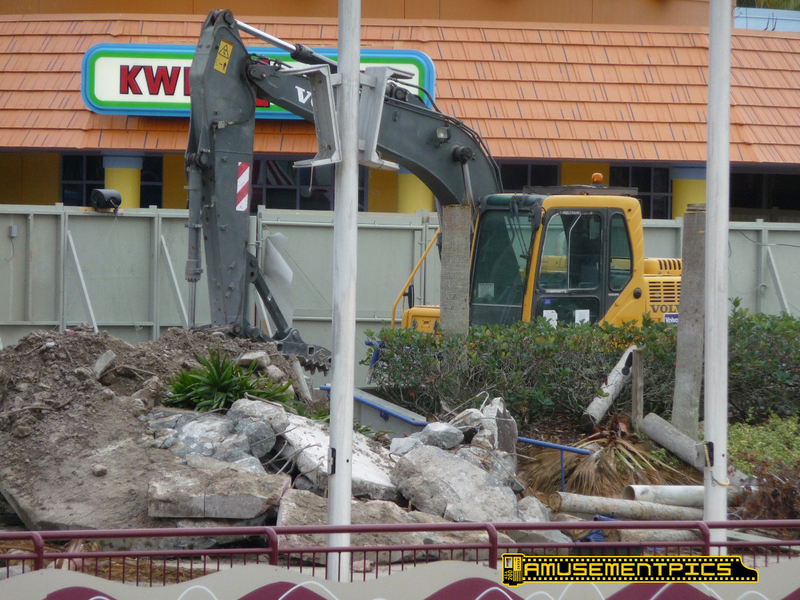 Lots of earth moving happening on the other side of the wall. The Disaster brick maintenance is now underway. Ready for the big lighting this Saturday! 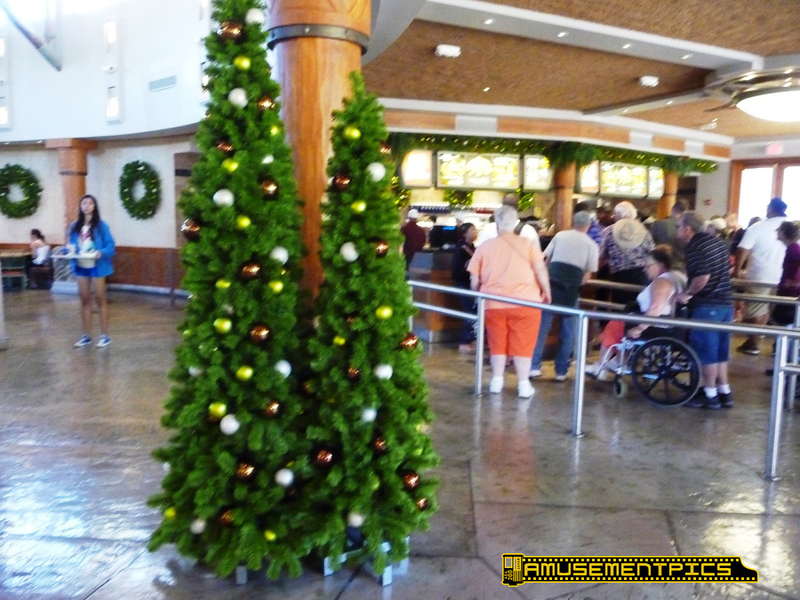 Islands has switched over to Christmas background music. 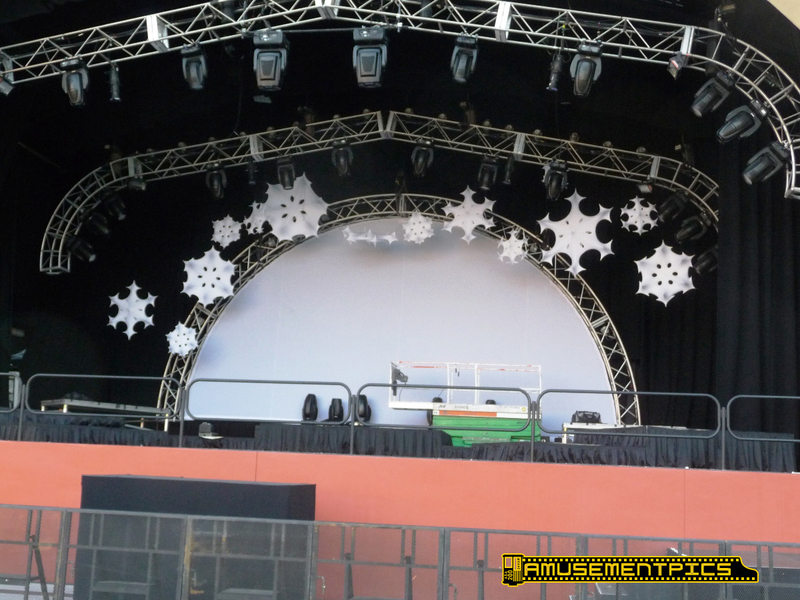 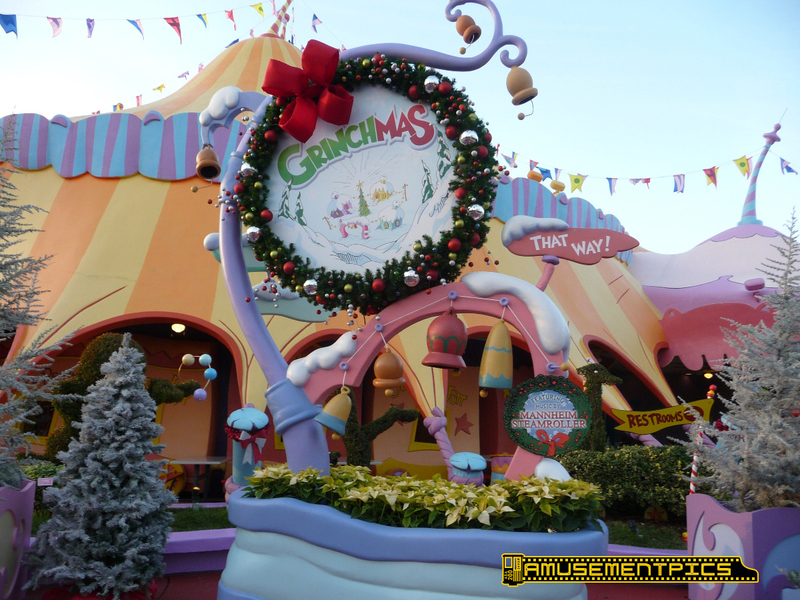 All set for Grinchmas to start on Saturday. 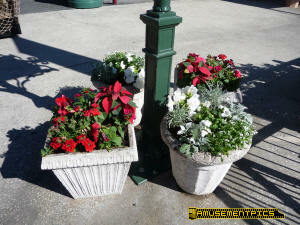 for the Trolley Ride! I think this sign is new too. 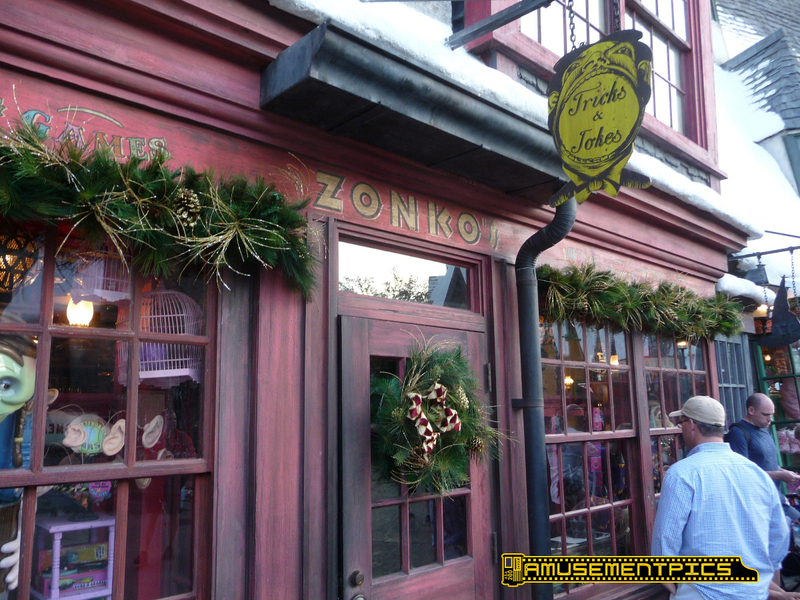 are on Zonko's and Honeydukes. 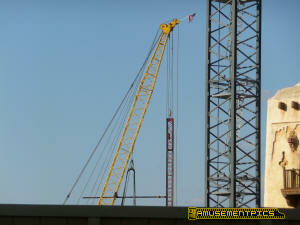 There's a second crane on site now. Lots of work going on with interior walls going up! 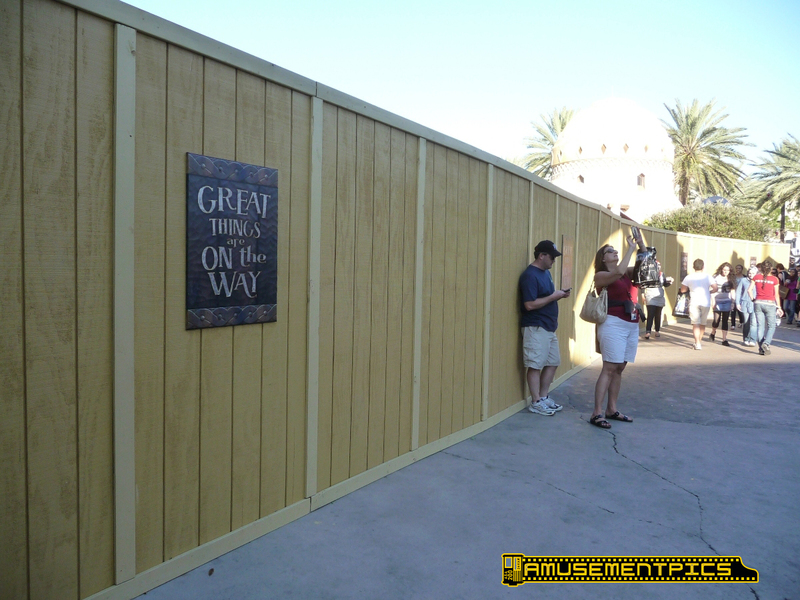 They've started working on the Shrek & Donkey photo area. 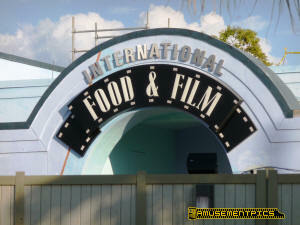 IFFF is now closed for renovations/demolition to start. 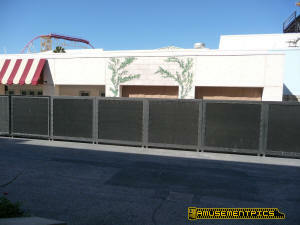 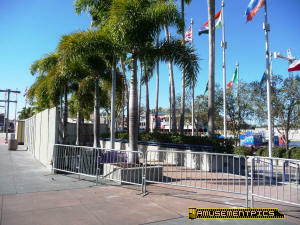 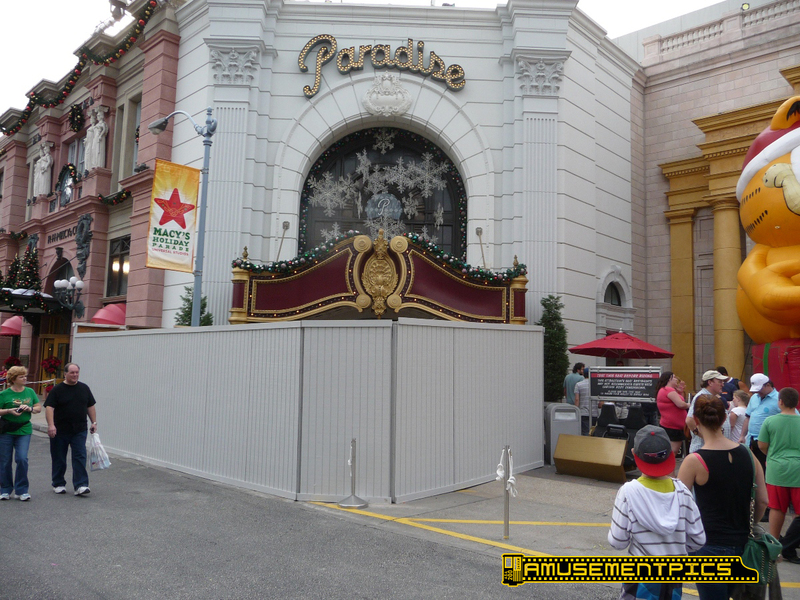 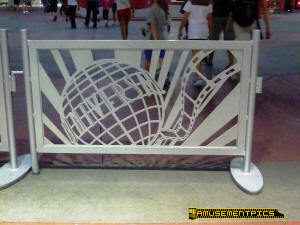 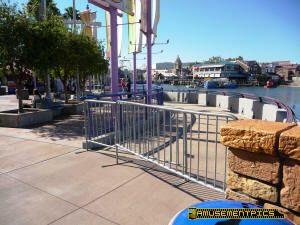 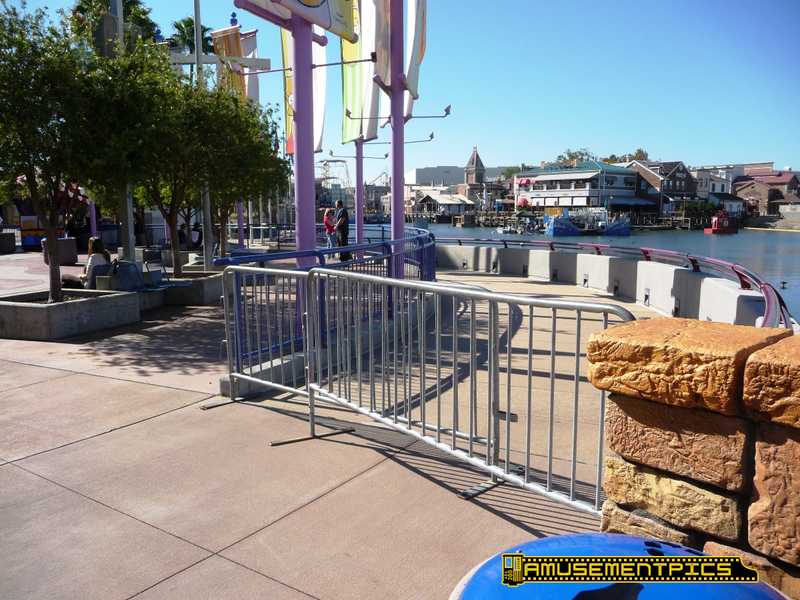 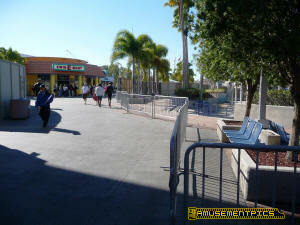 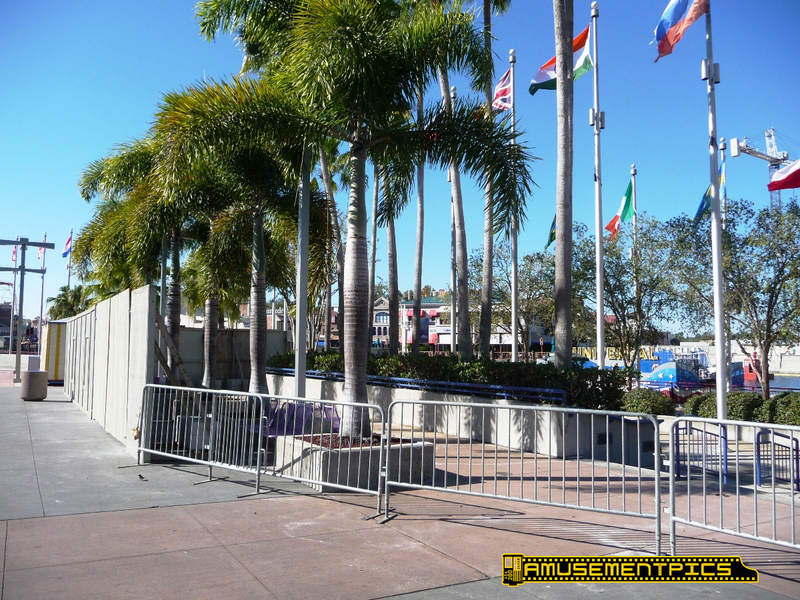 Looks like they ran out of time overnight, and just put up temporary barriers until they can finish the fence tonight. Future home of a ferris wheel? are going up really fast. 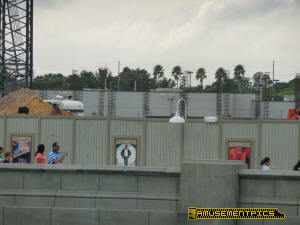 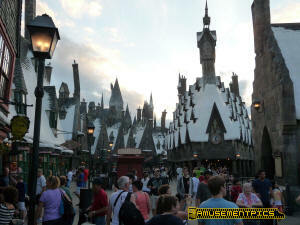 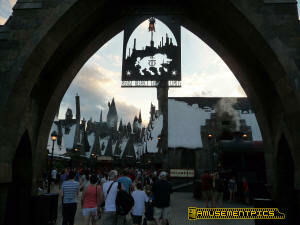 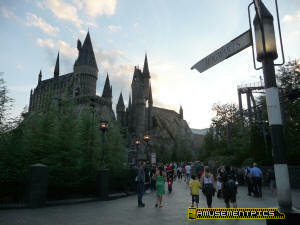 The Hogsmeade side is making progress as well. It appears all the work on the Hogsmeade side happens overnight so they don't interfere with the operation of Dragon's Challenge. 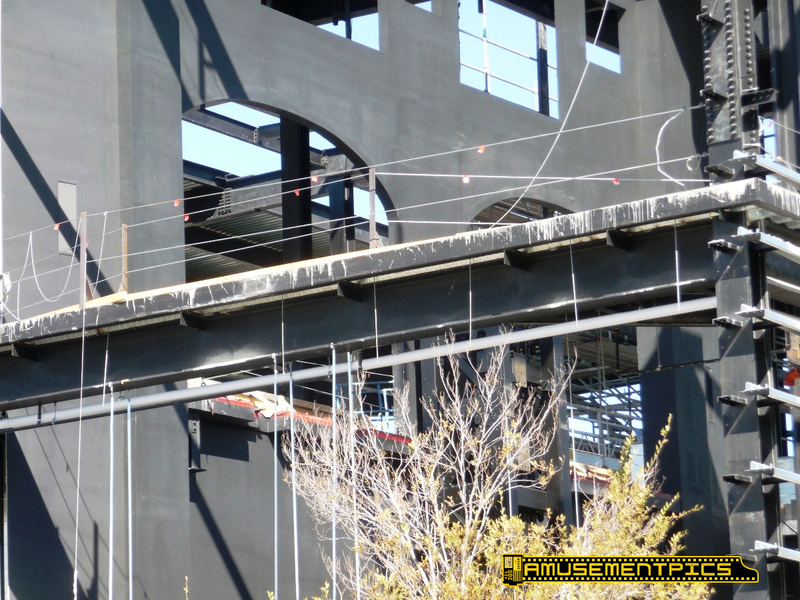 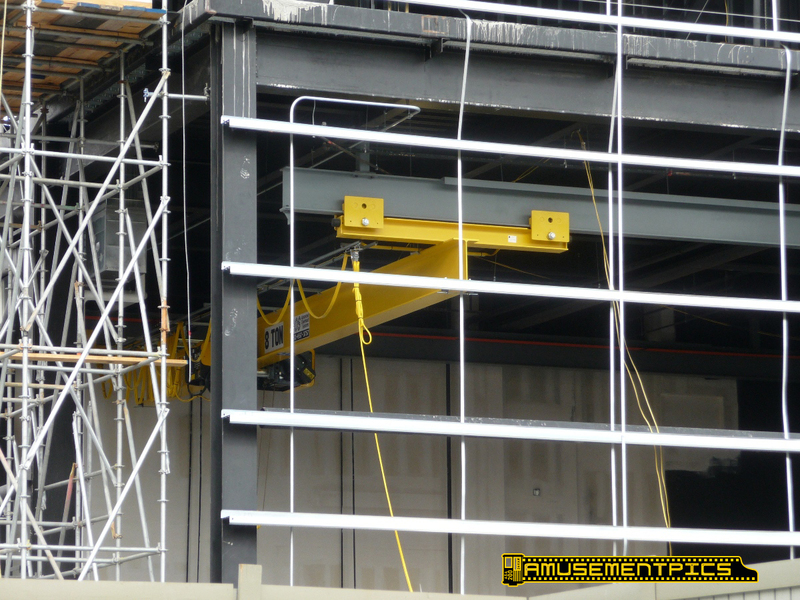 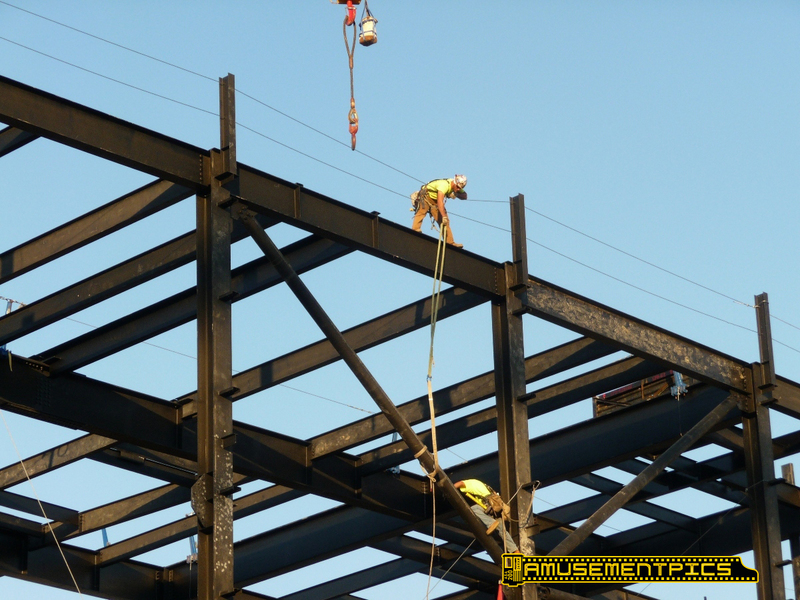 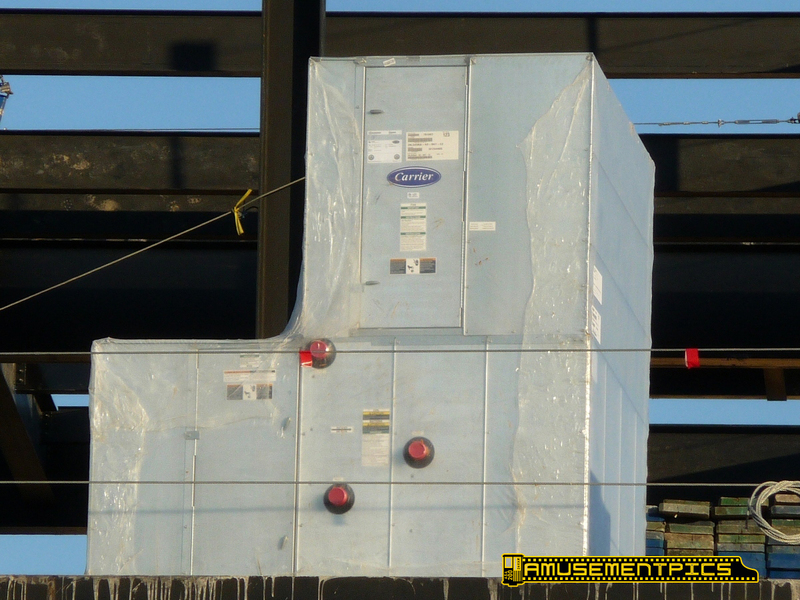 I hear from Universal employees that the supports for the viaduct that will carry the Hogwarts Express have gone vertical in some places already. 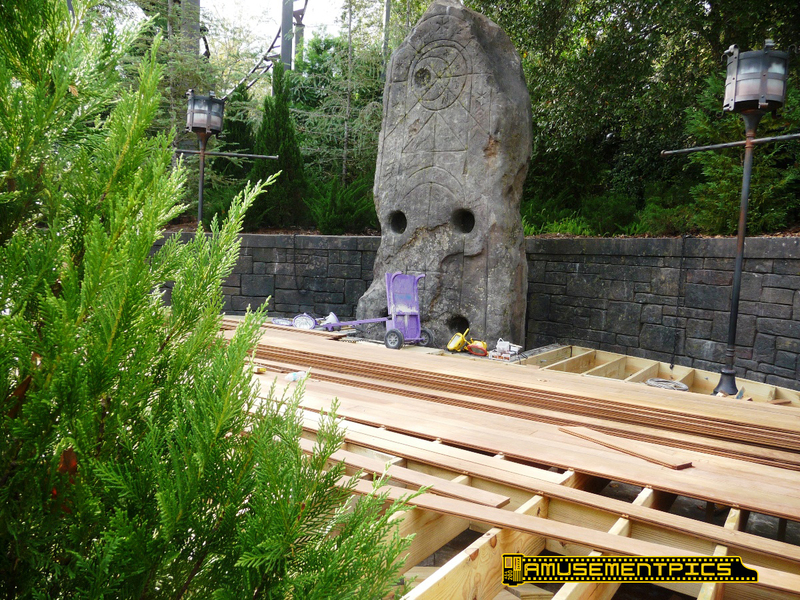 Under the Dragon's Challenge it appears foundation work has begun. 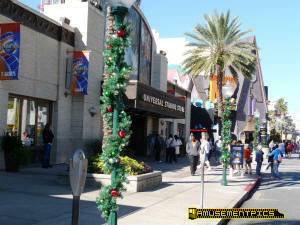 on Hollywood Blvd. 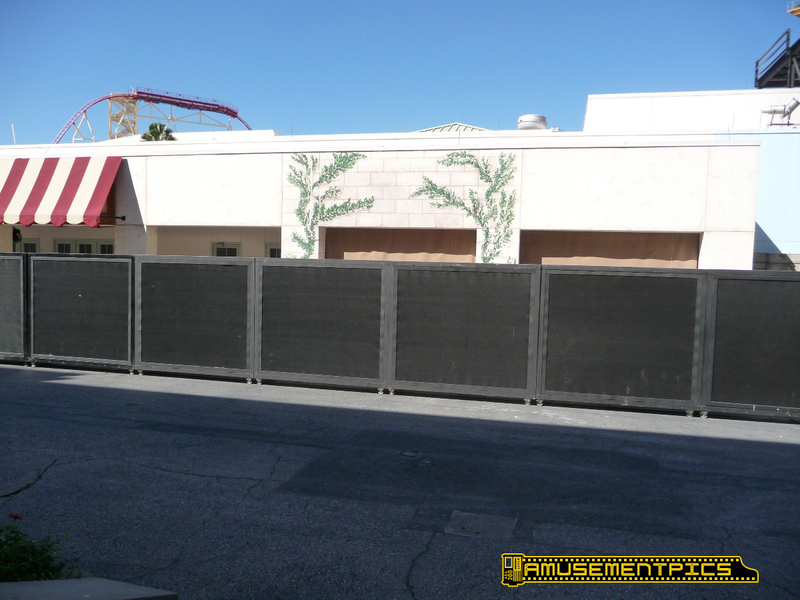 The games that had been in the plaza are stored just behind the fence. 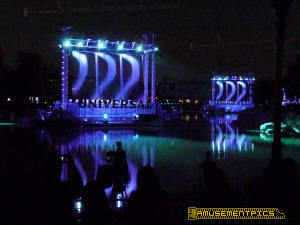 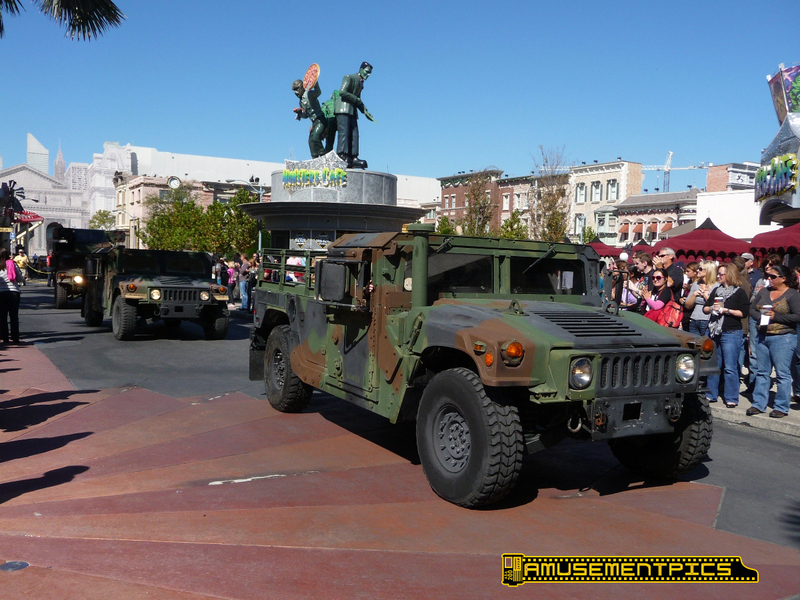 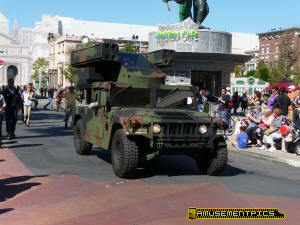 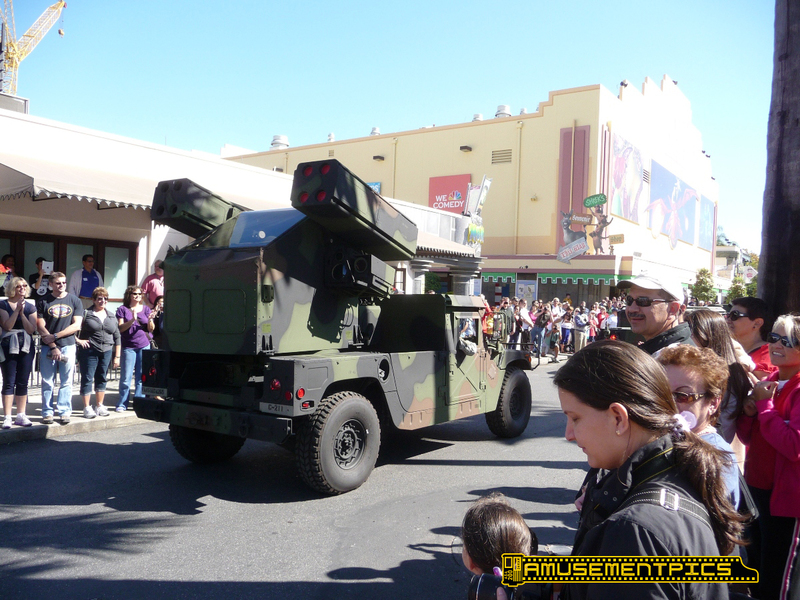 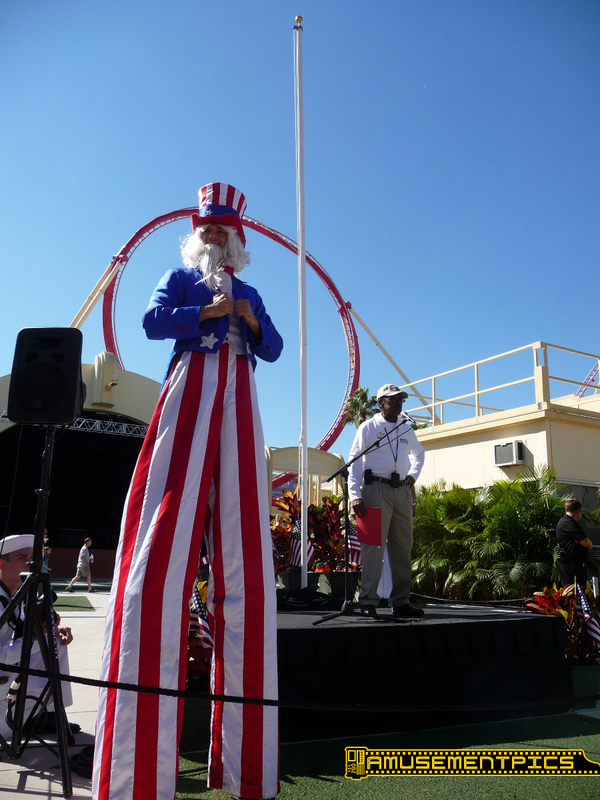 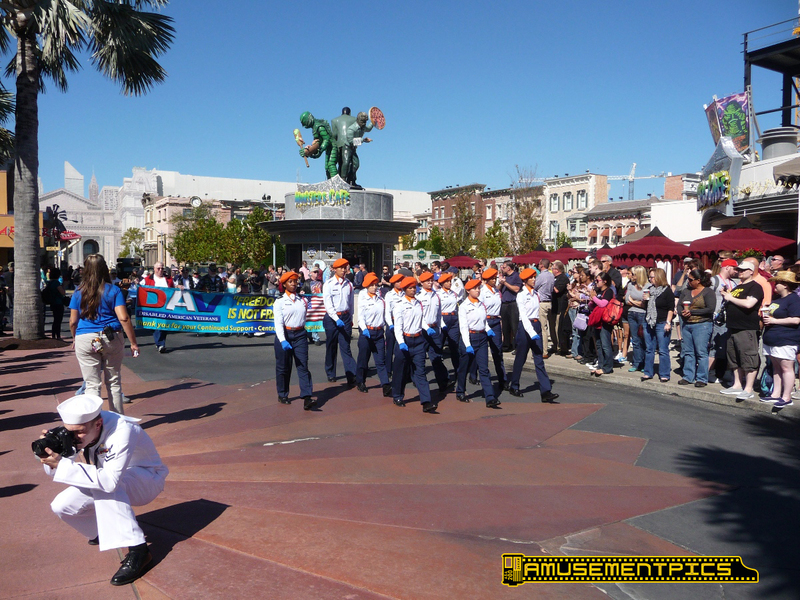 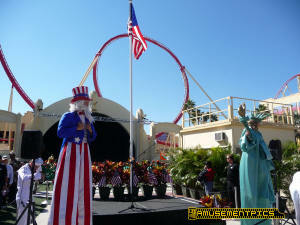 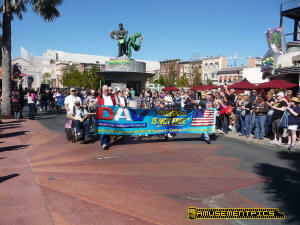 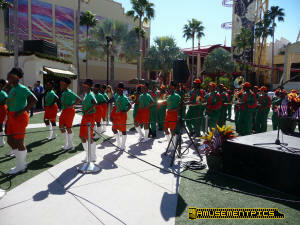 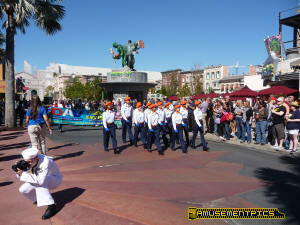 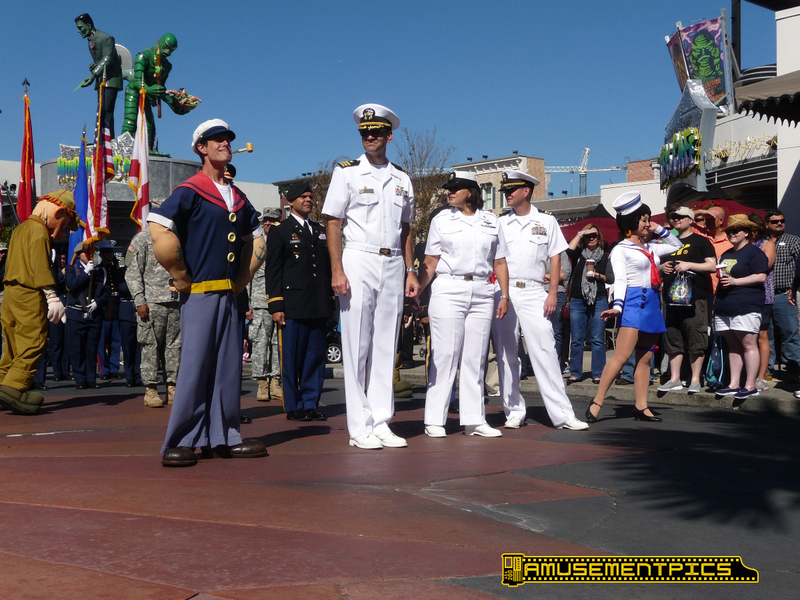 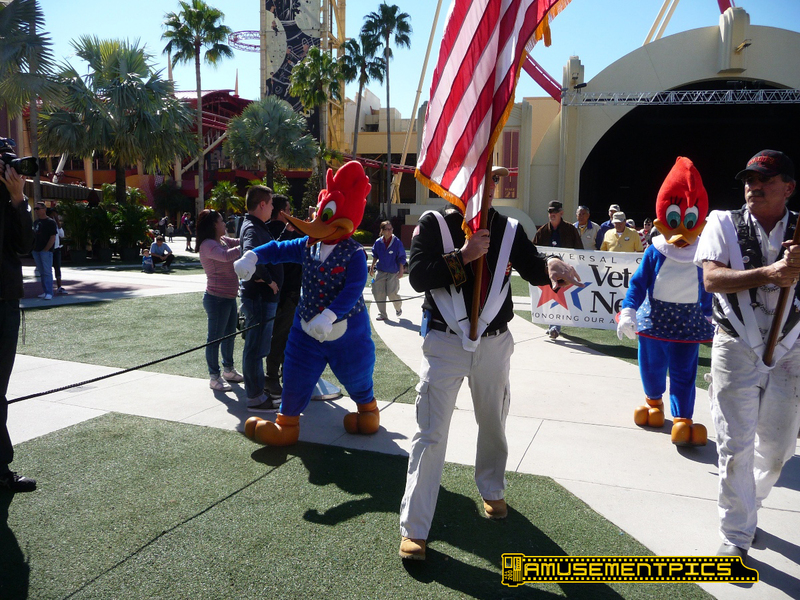 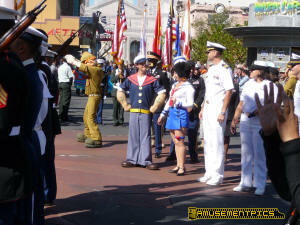 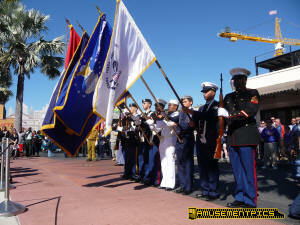 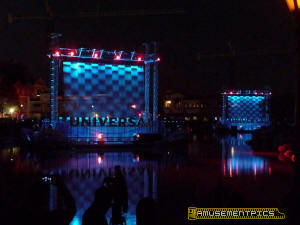 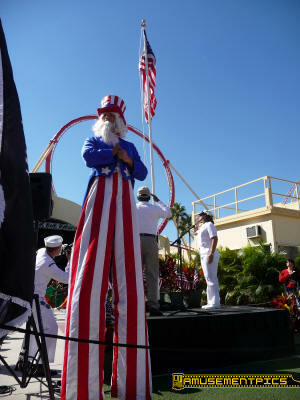 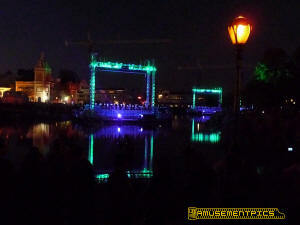 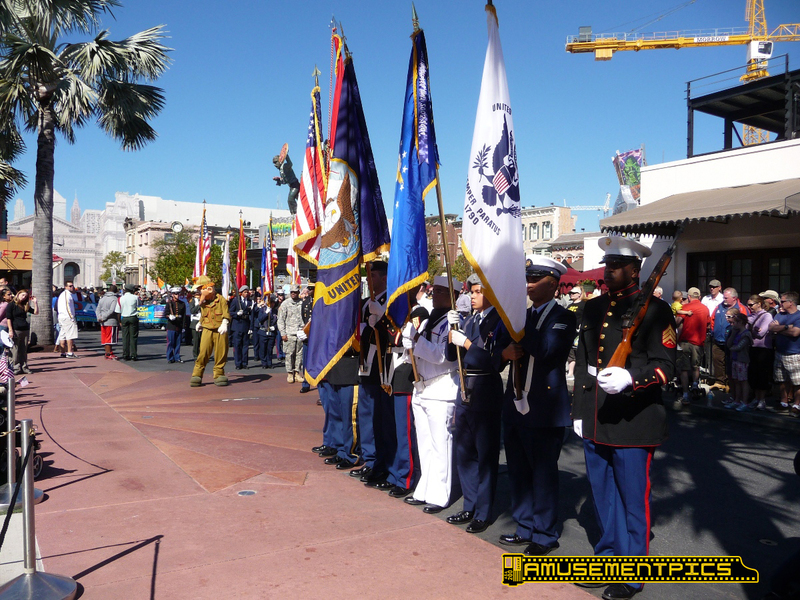 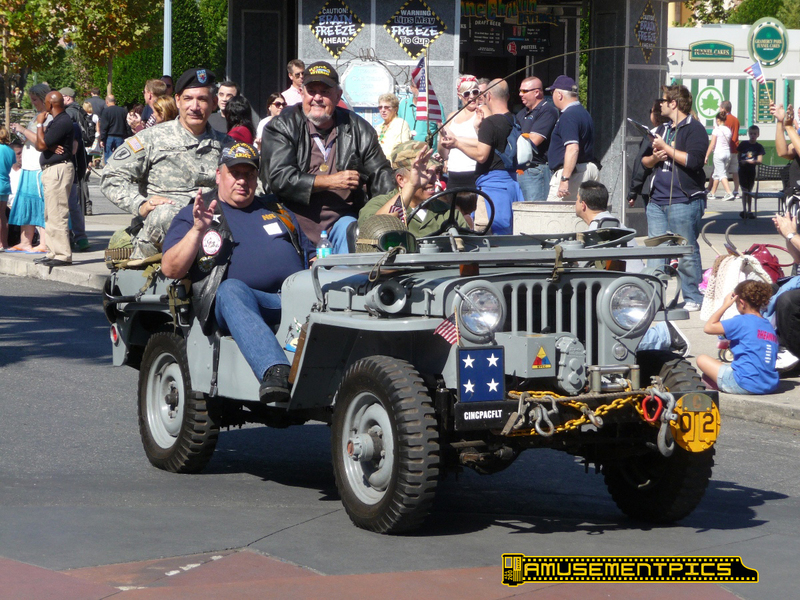 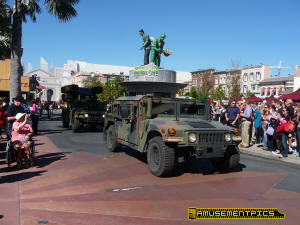 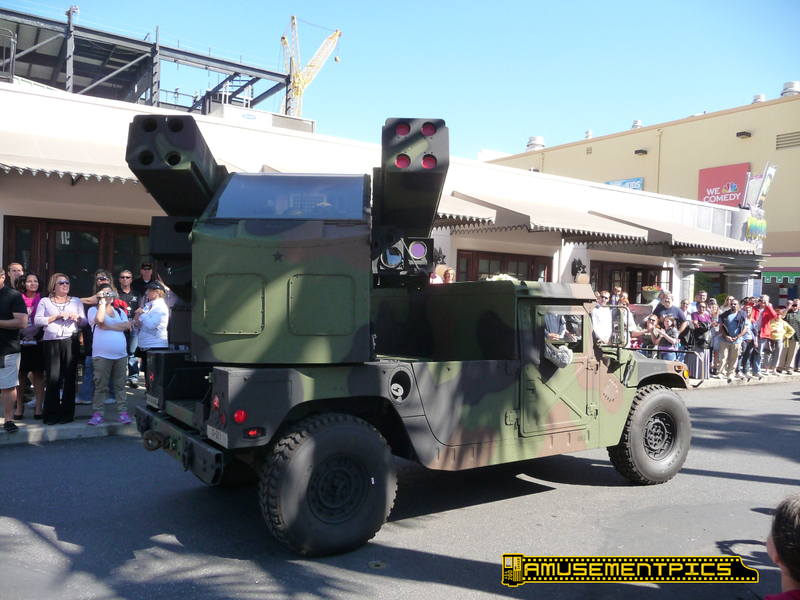 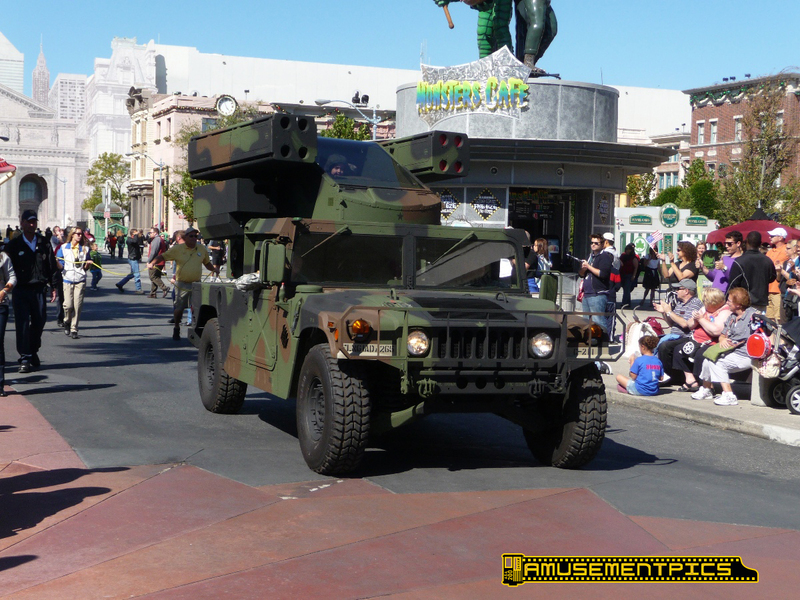 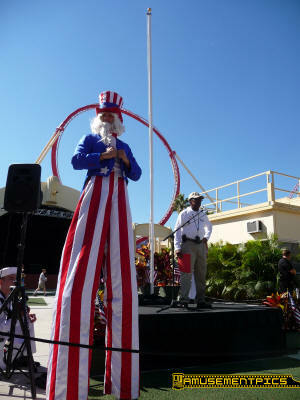 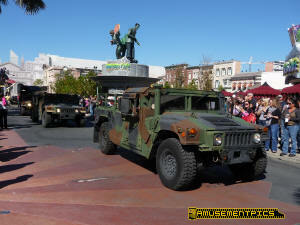 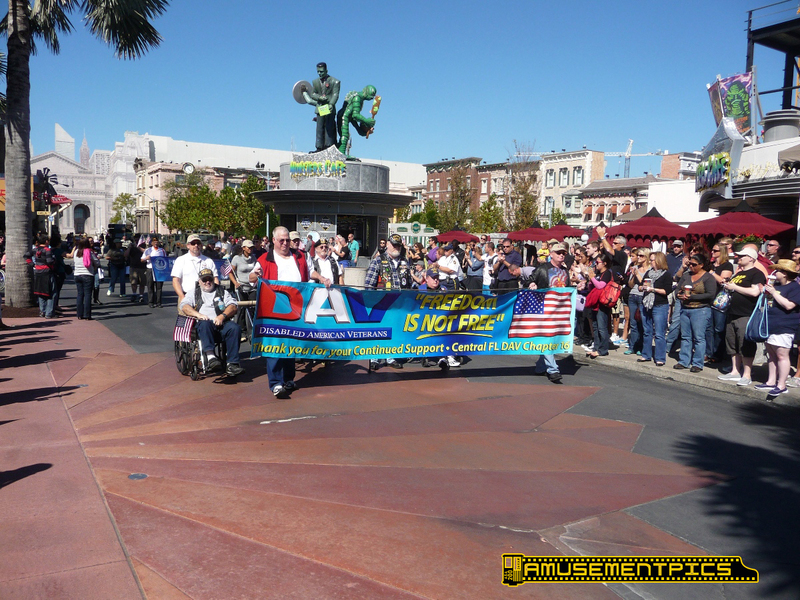 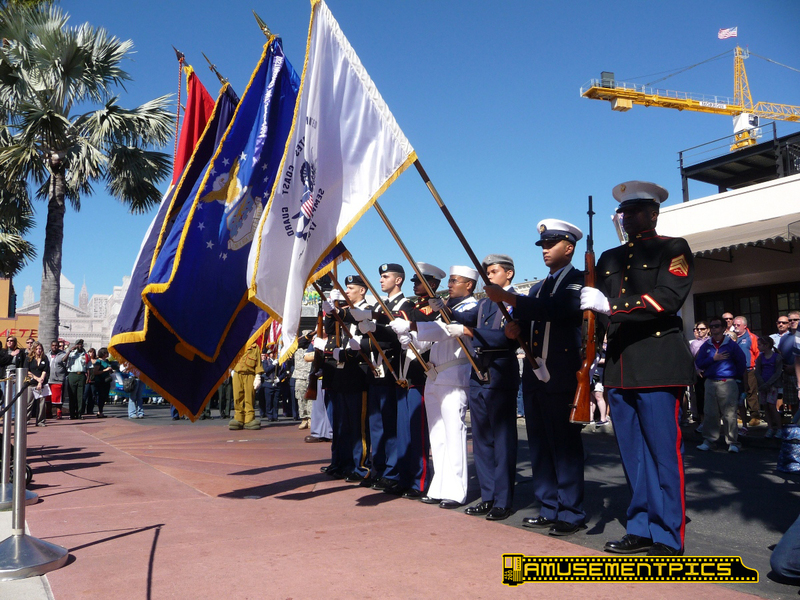 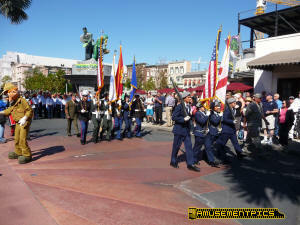 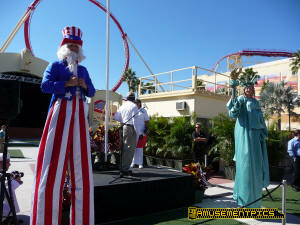 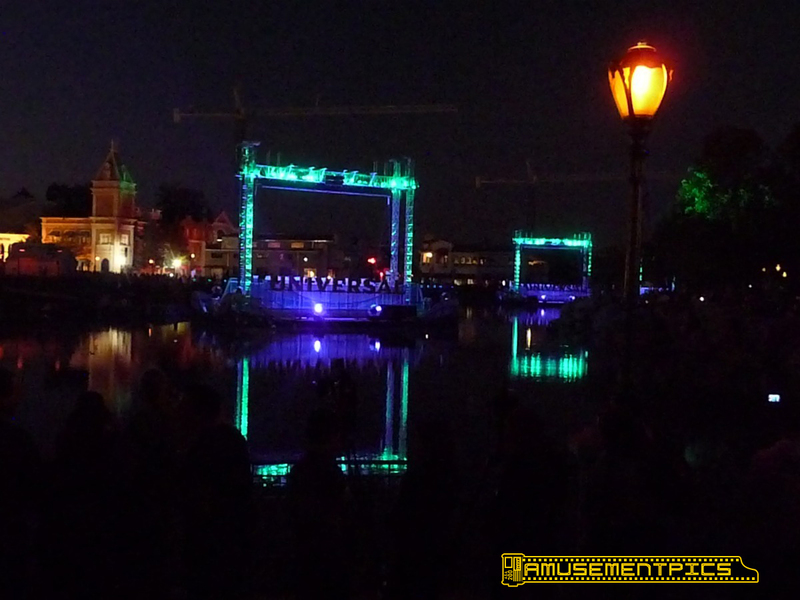 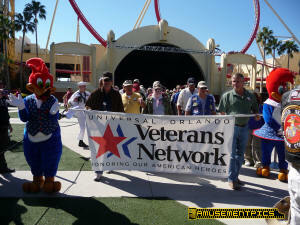 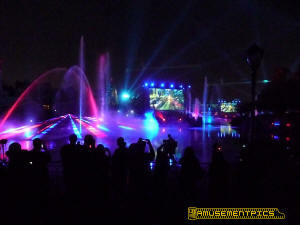 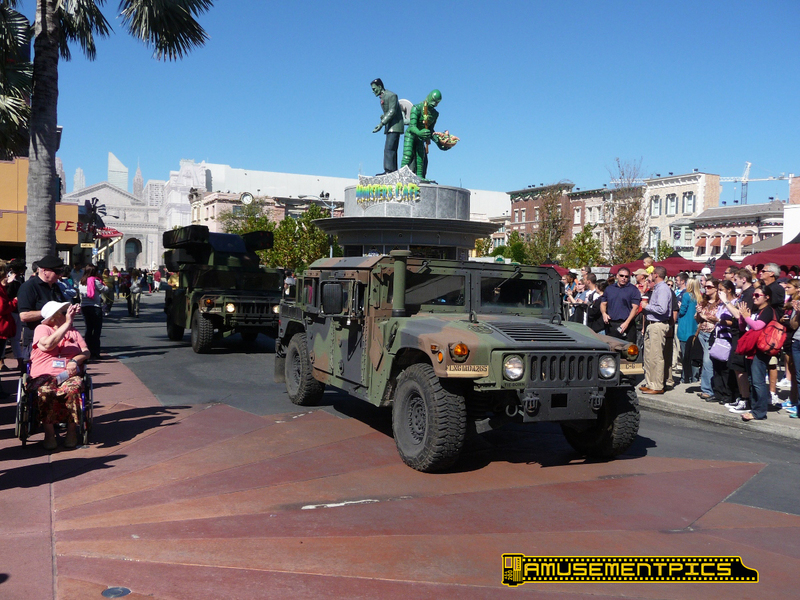 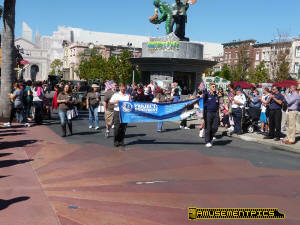 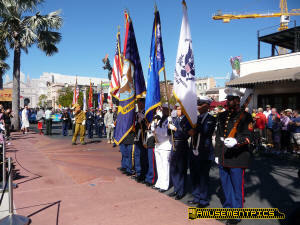 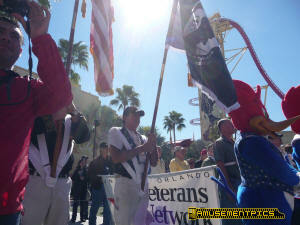 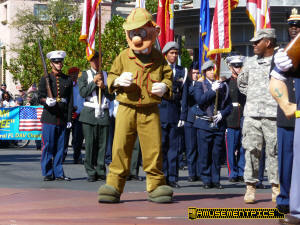 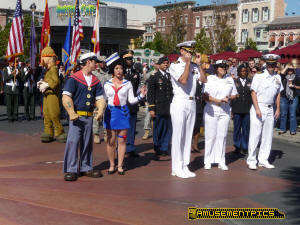 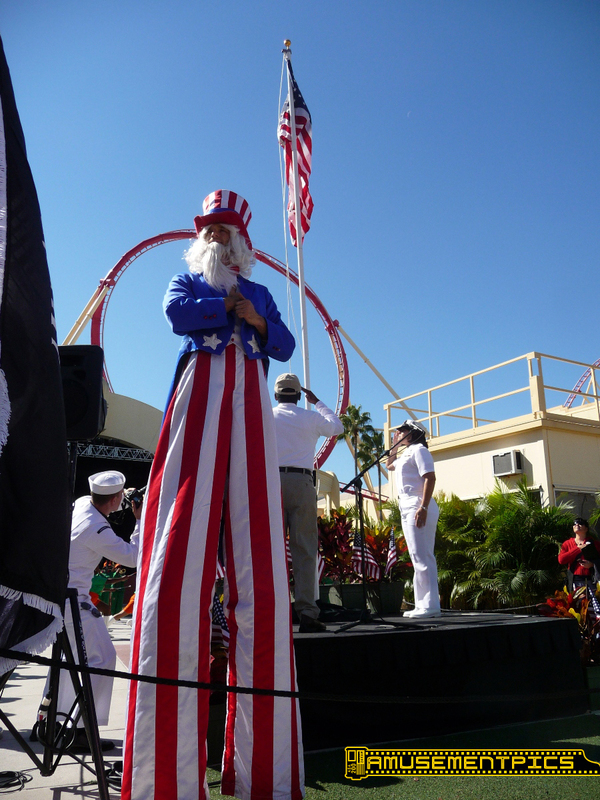 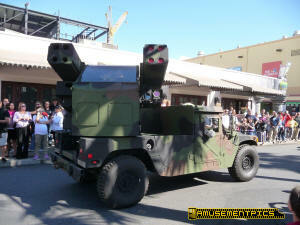 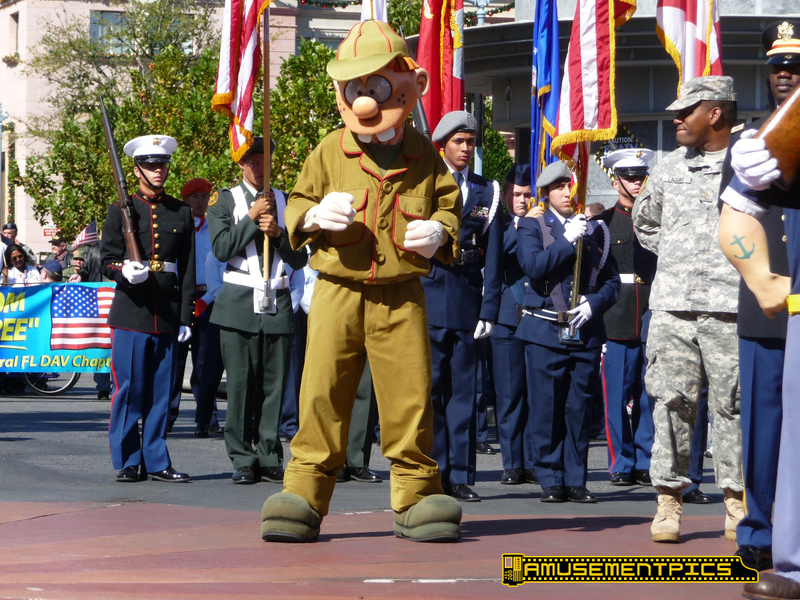 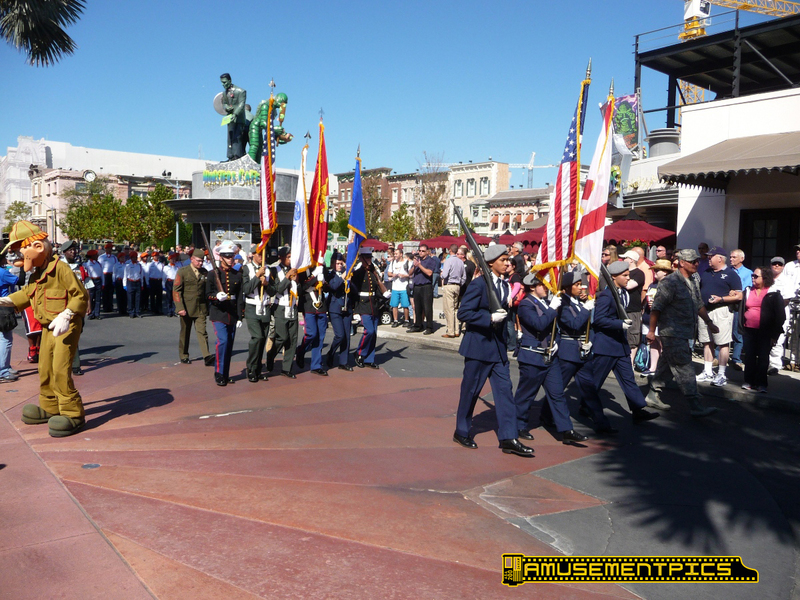 This was a really nice, low-key salute to veterans and honoring those vets who work for Universal Orlando. 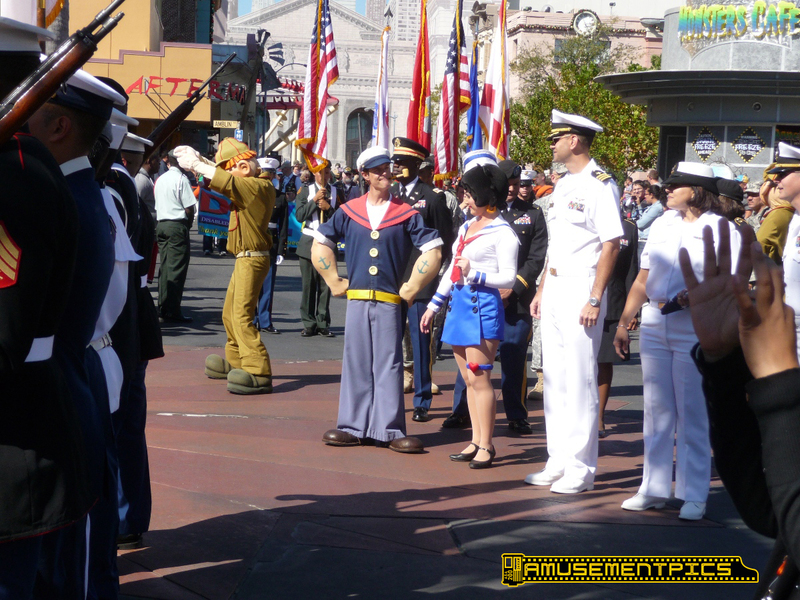 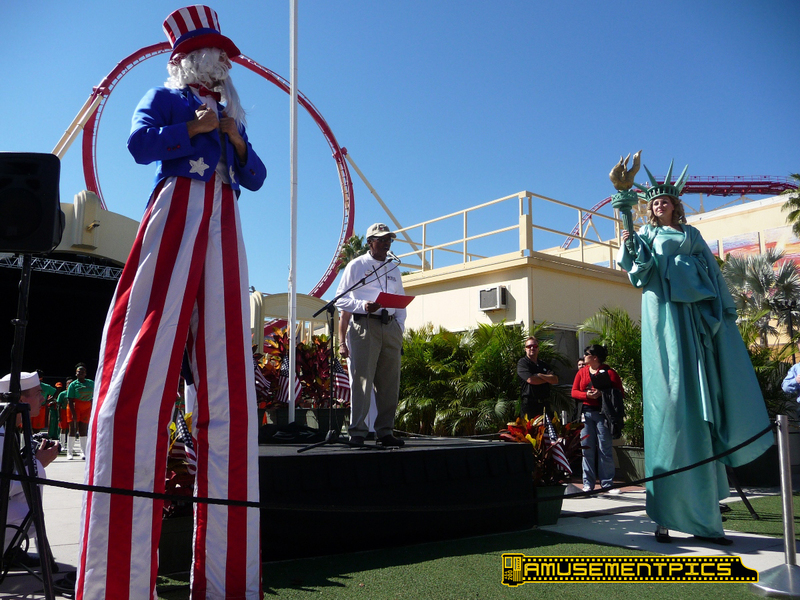 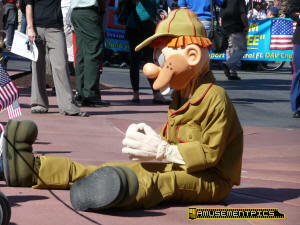 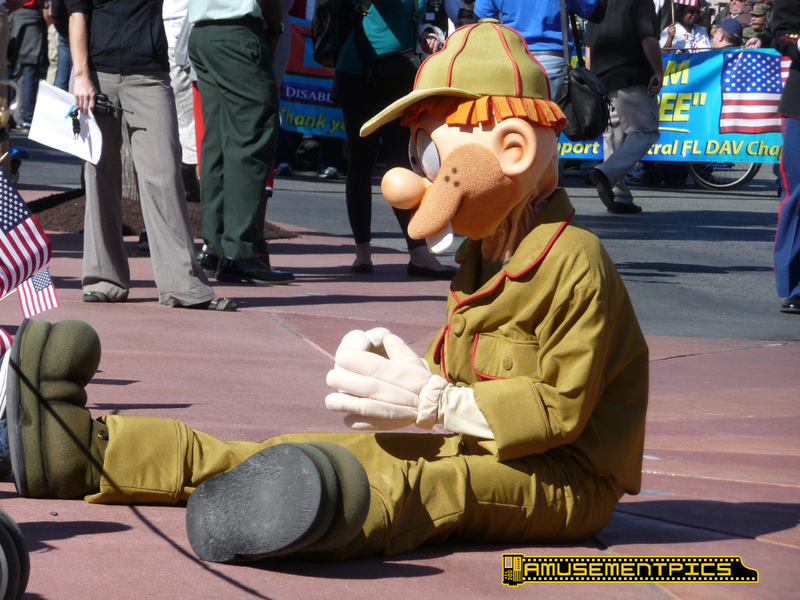 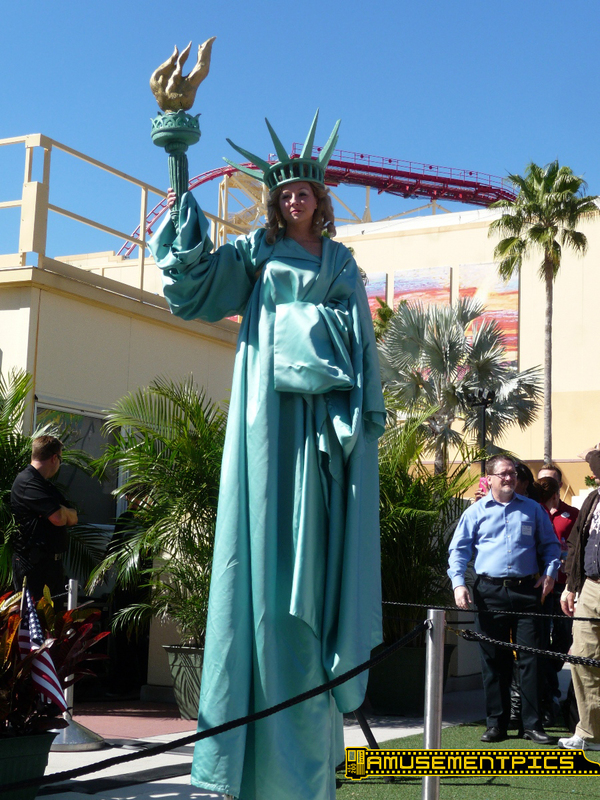 The park's characters were part of the tribute as well. 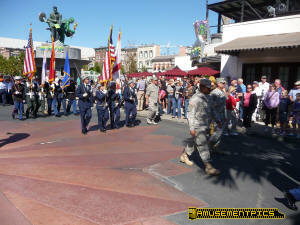 It was a really nice parade and ceremony. 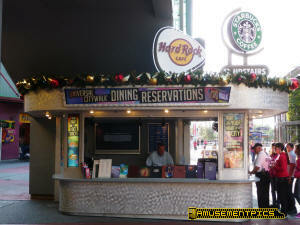 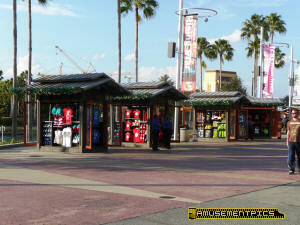 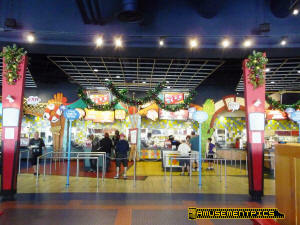 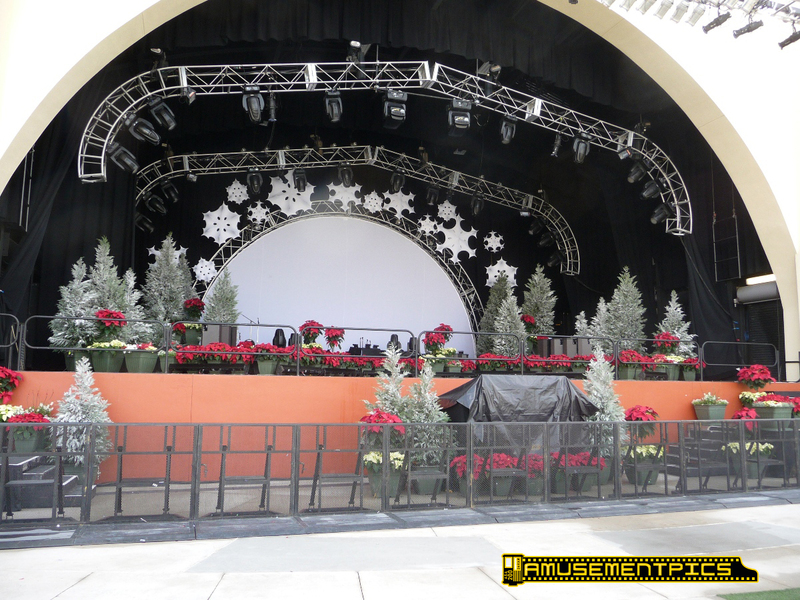 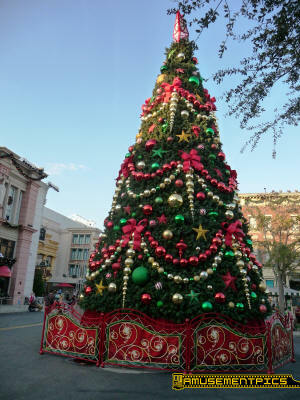 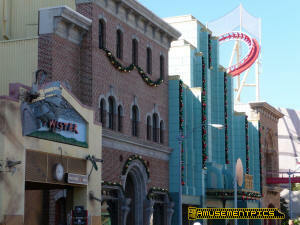 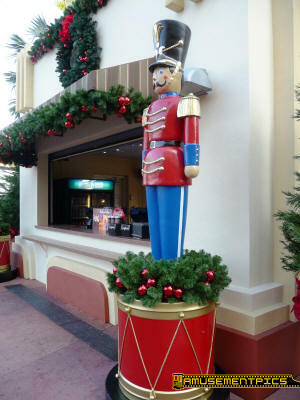 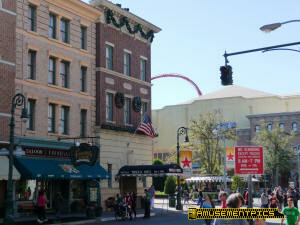 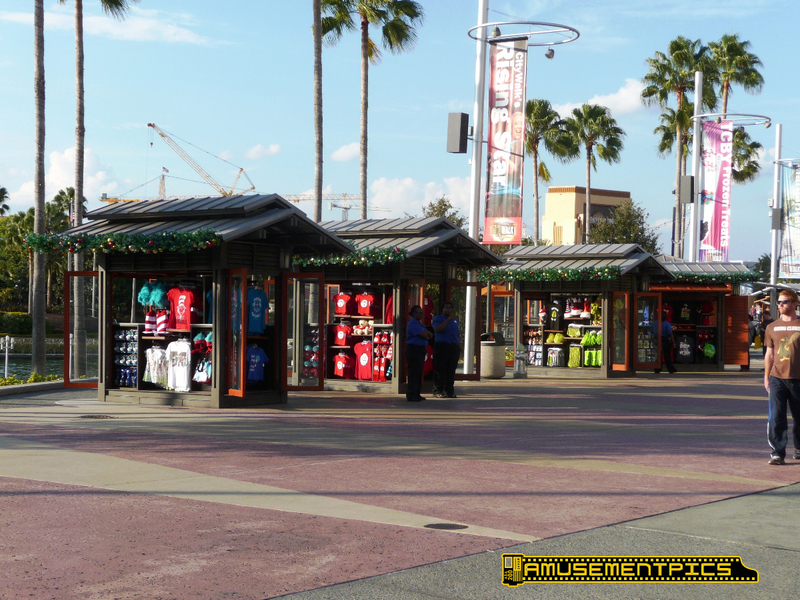 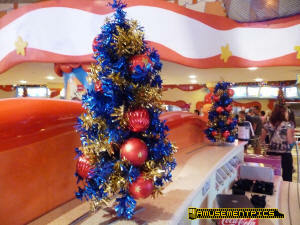 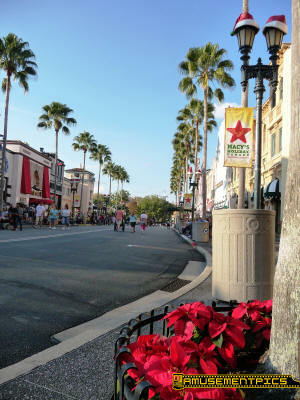 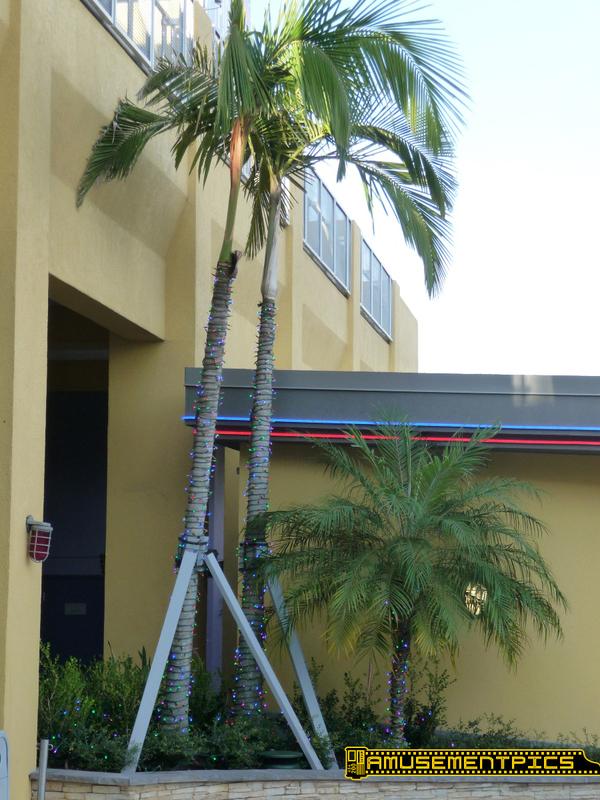 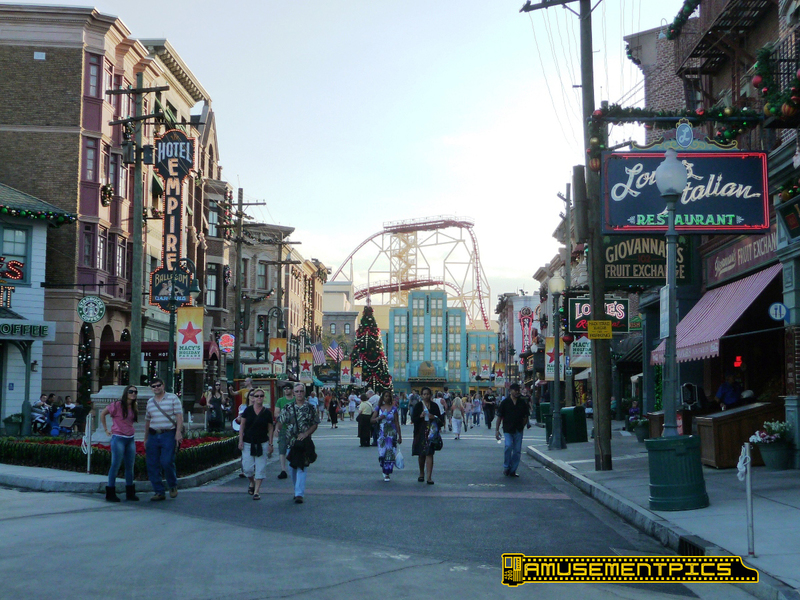 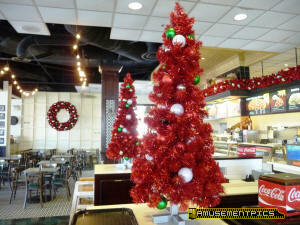 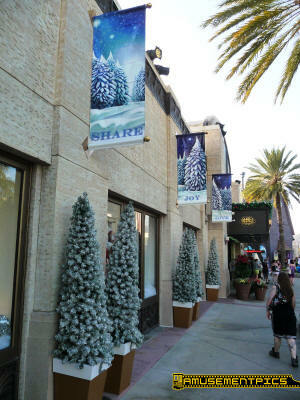 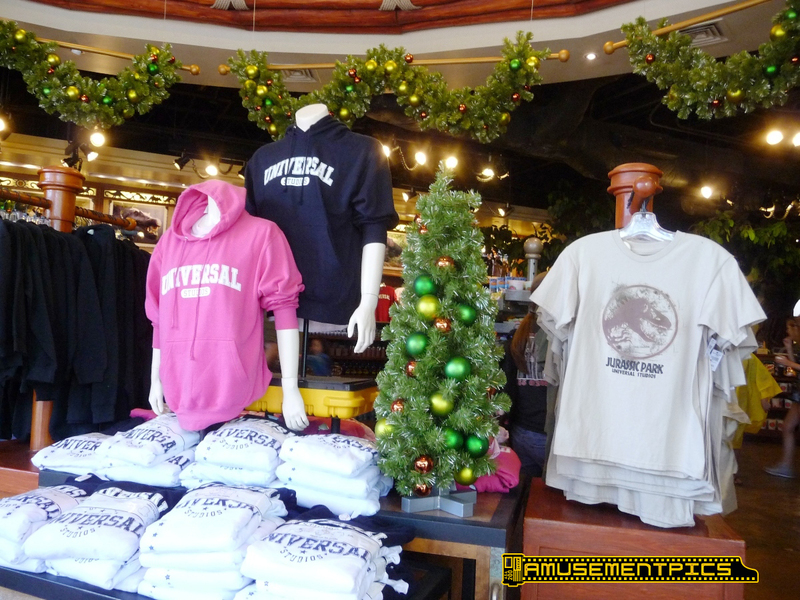 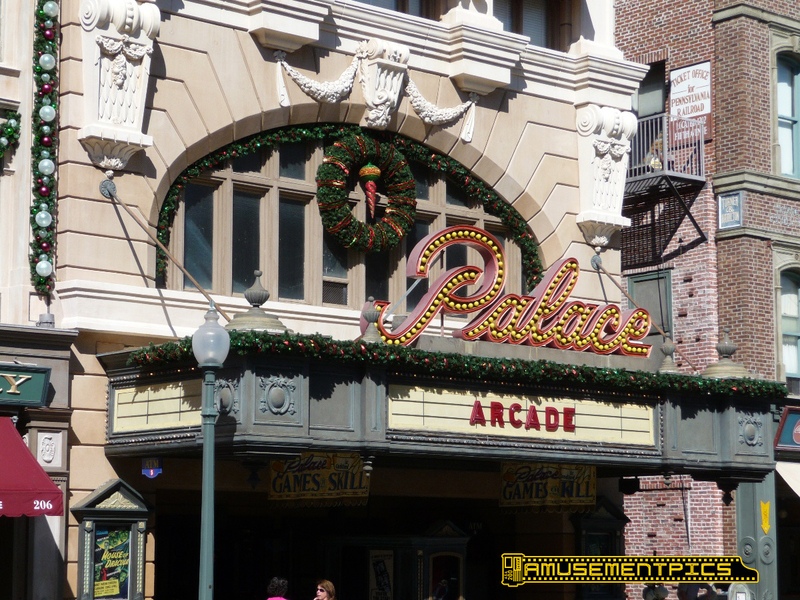 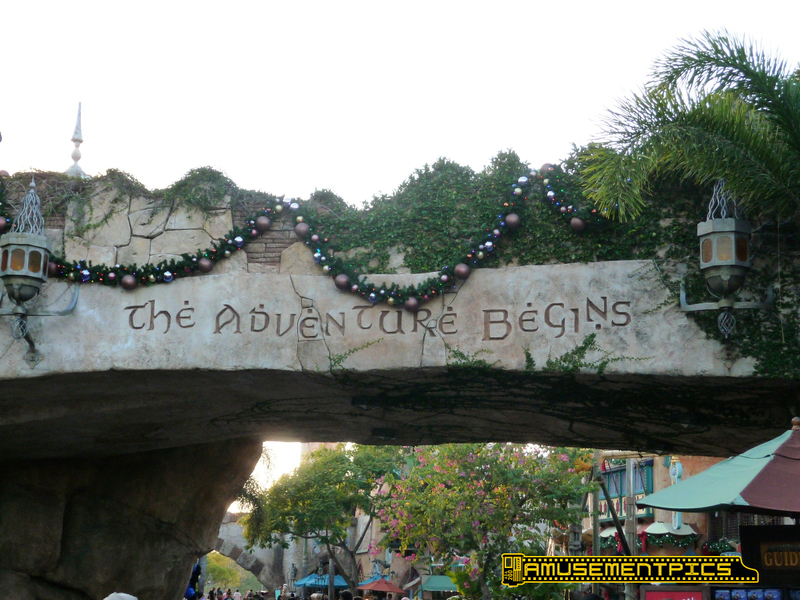 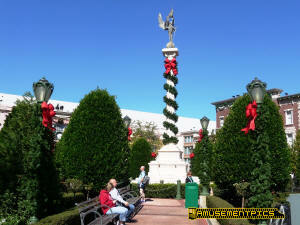 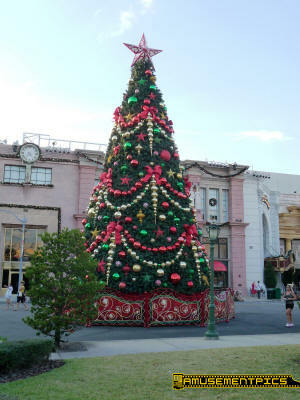 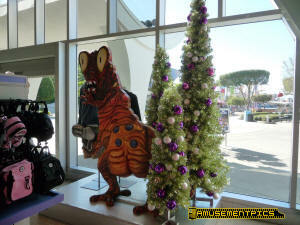 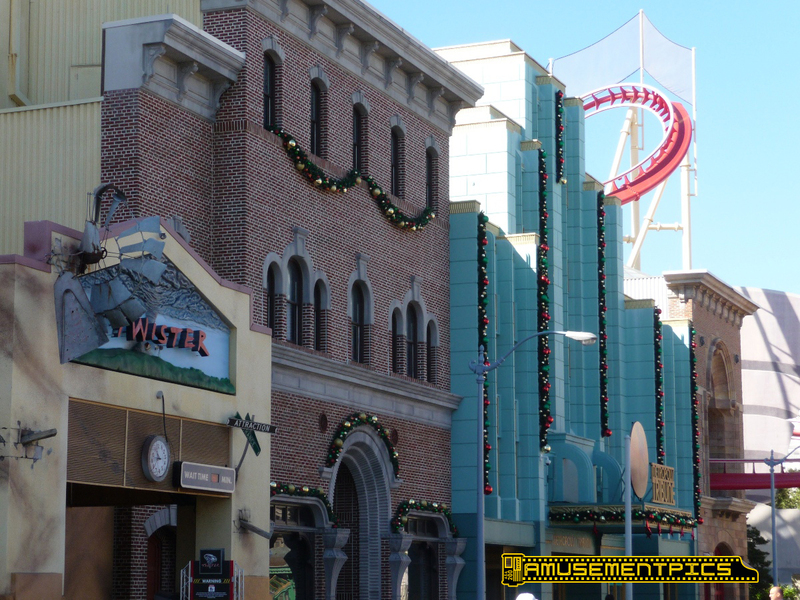 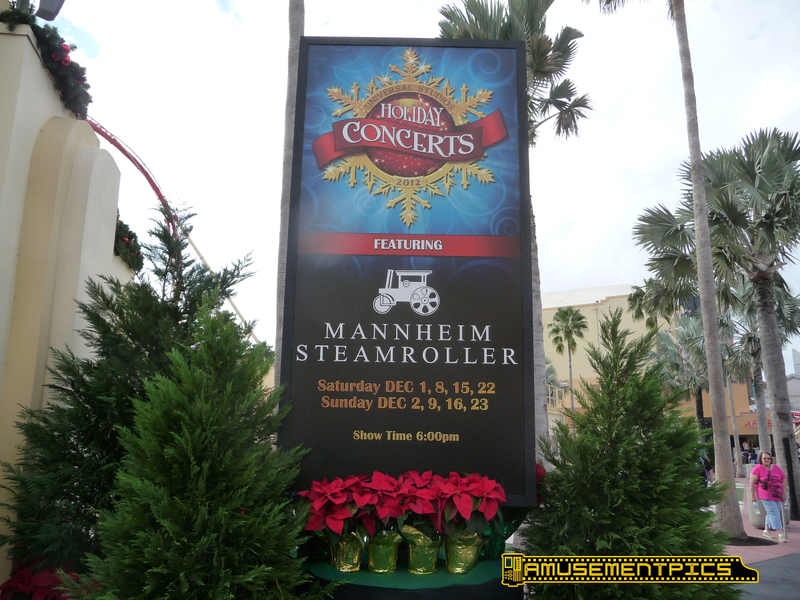 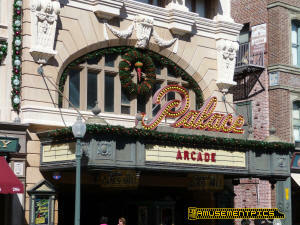 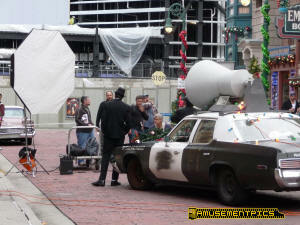 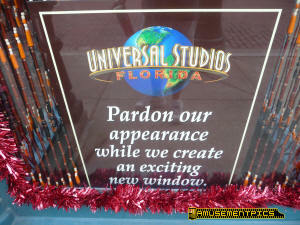 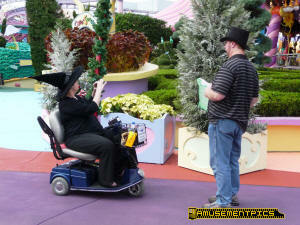 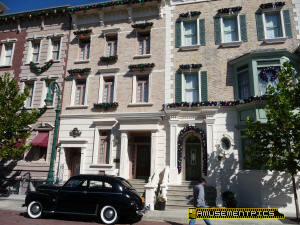 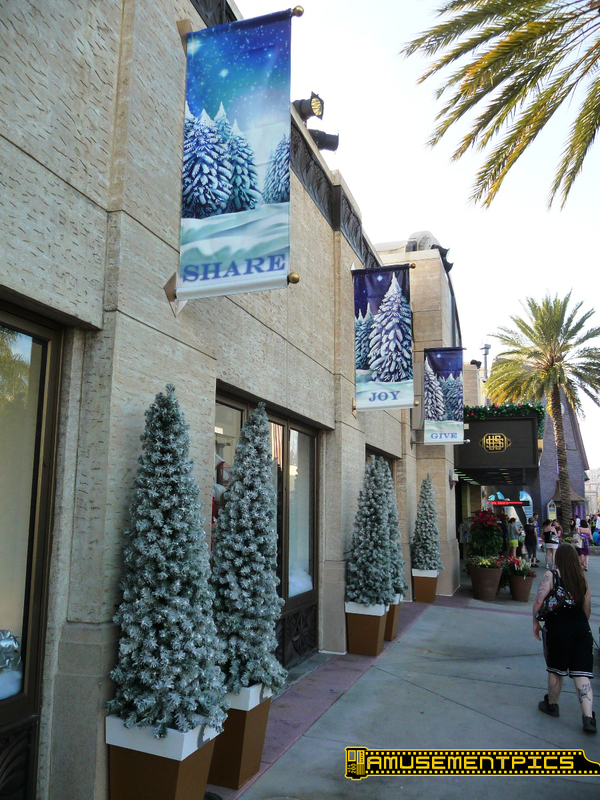 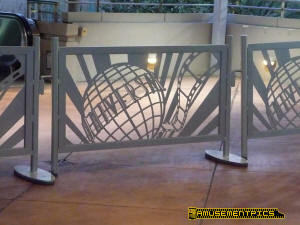 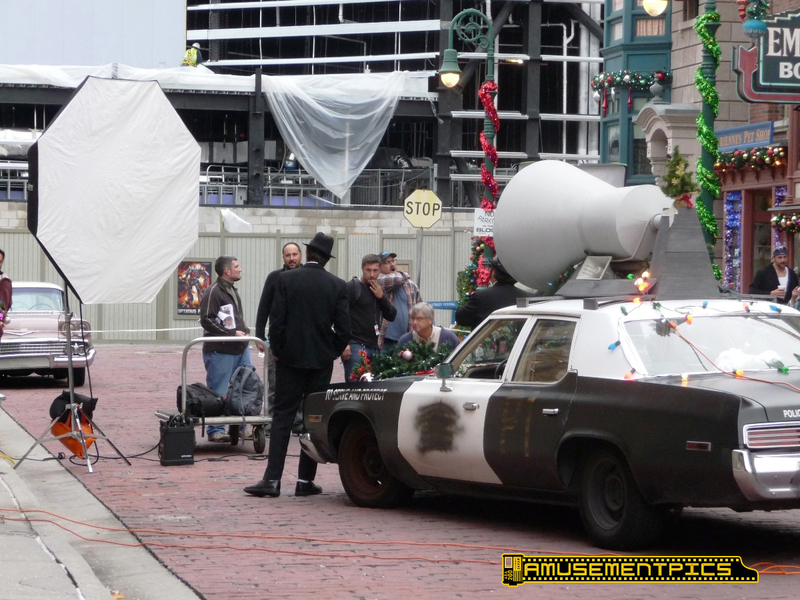 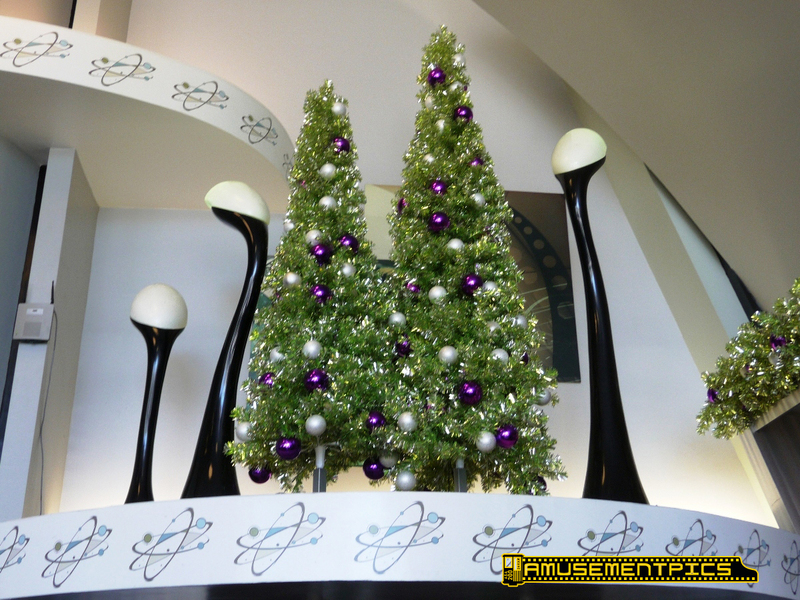 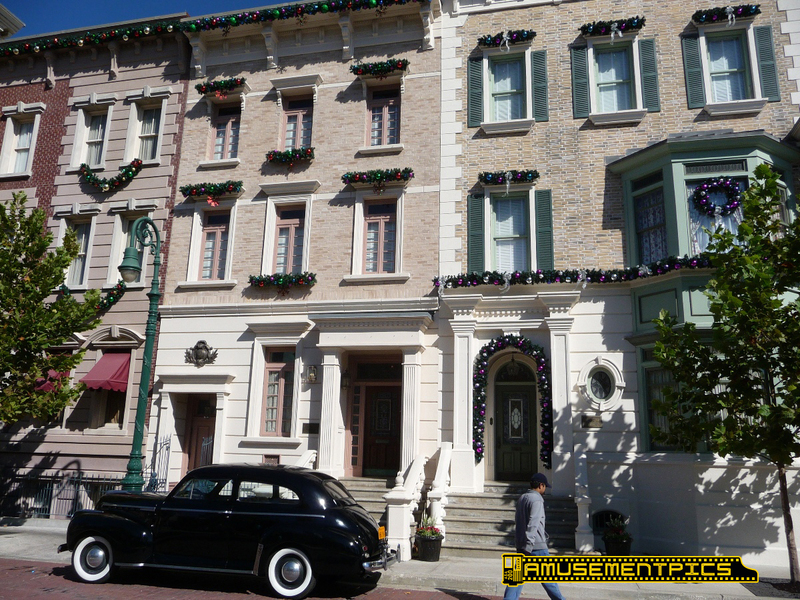 Decorations are going up all around Universal, inside and outside. About a third of the Streets of New York have decorations up now. 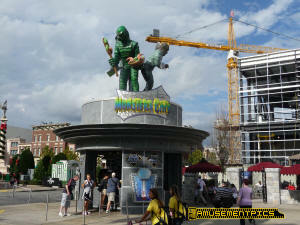 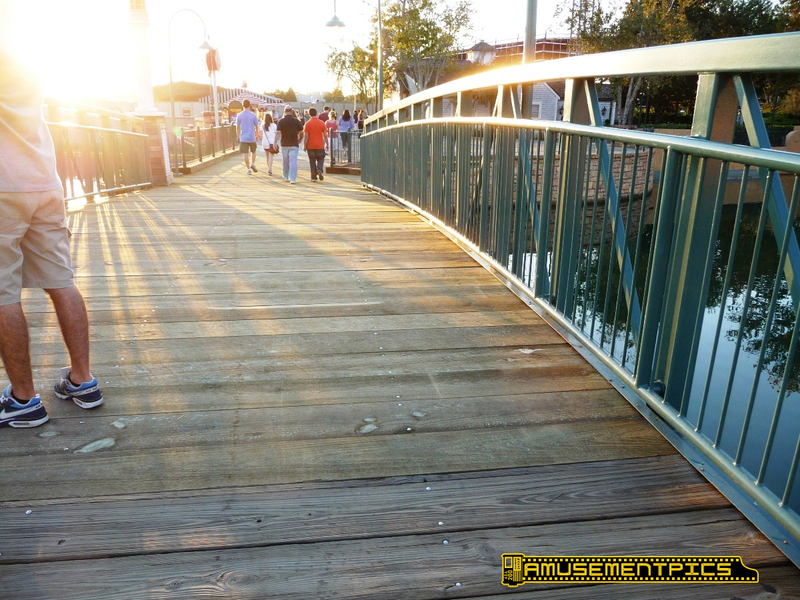 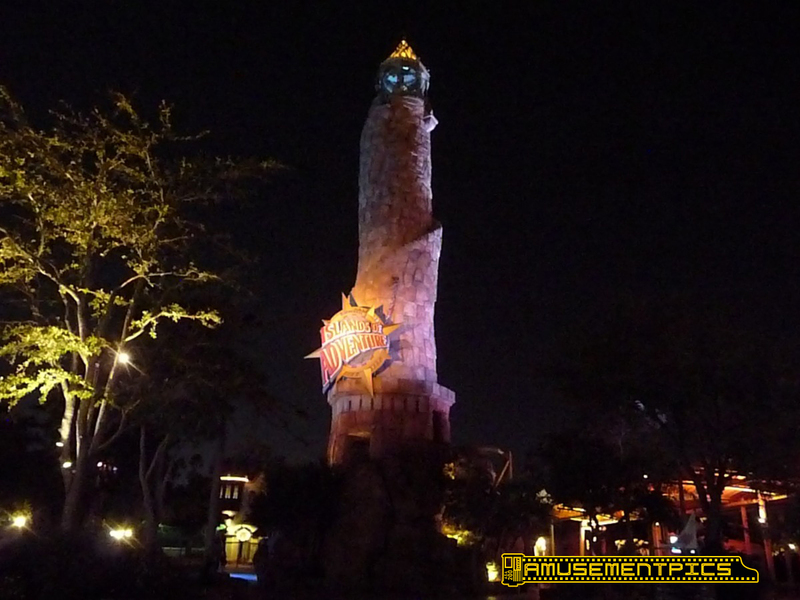 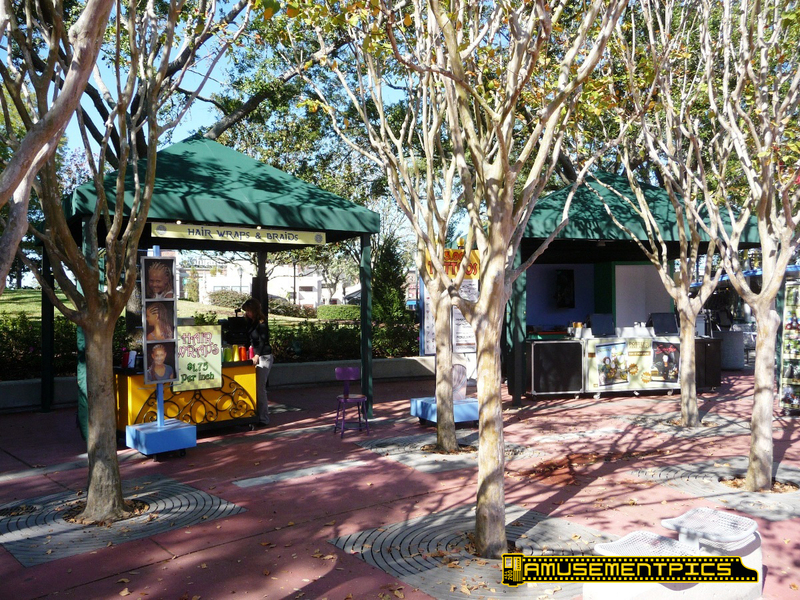 Islands of Adventure is getting decked out as well. 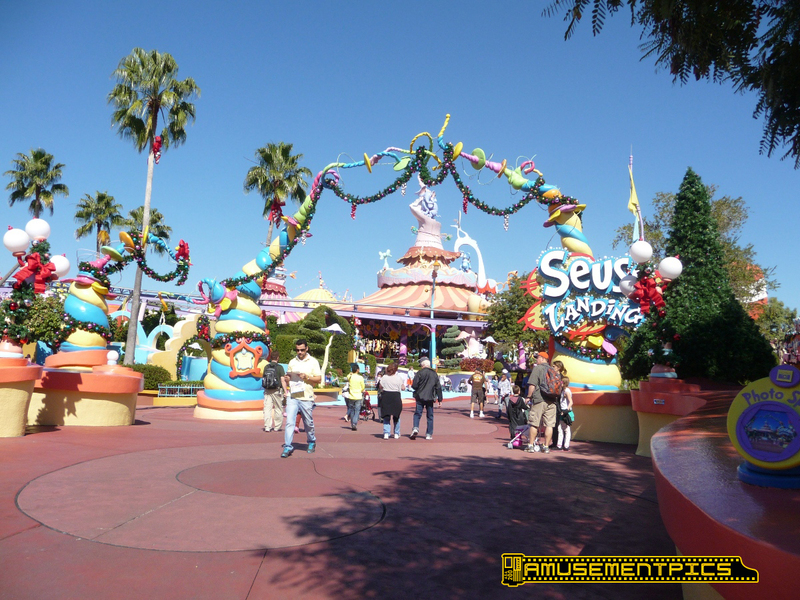 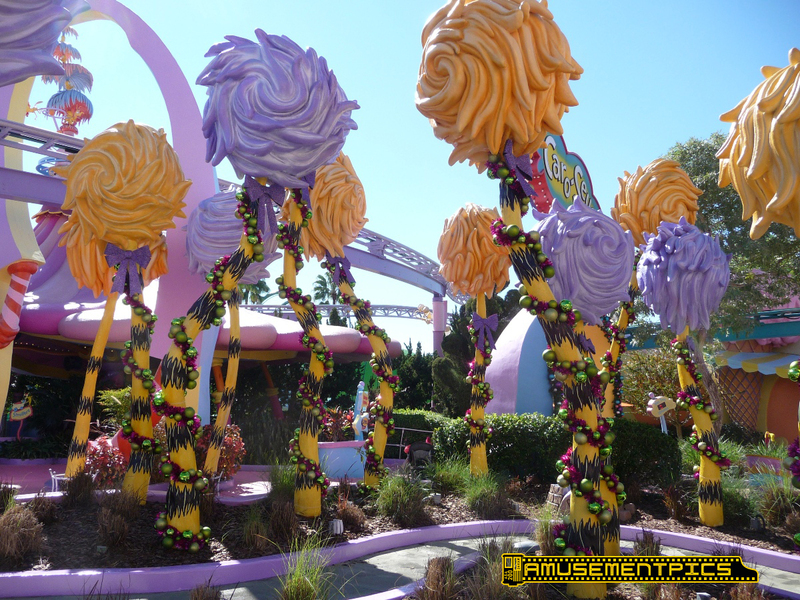 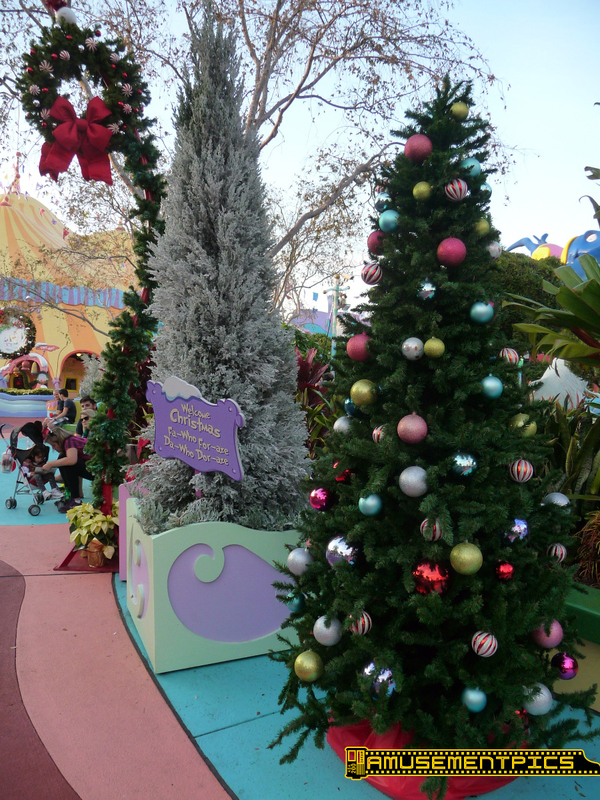 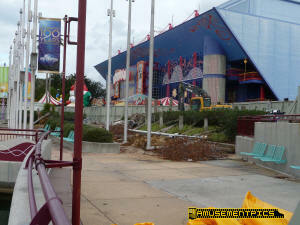 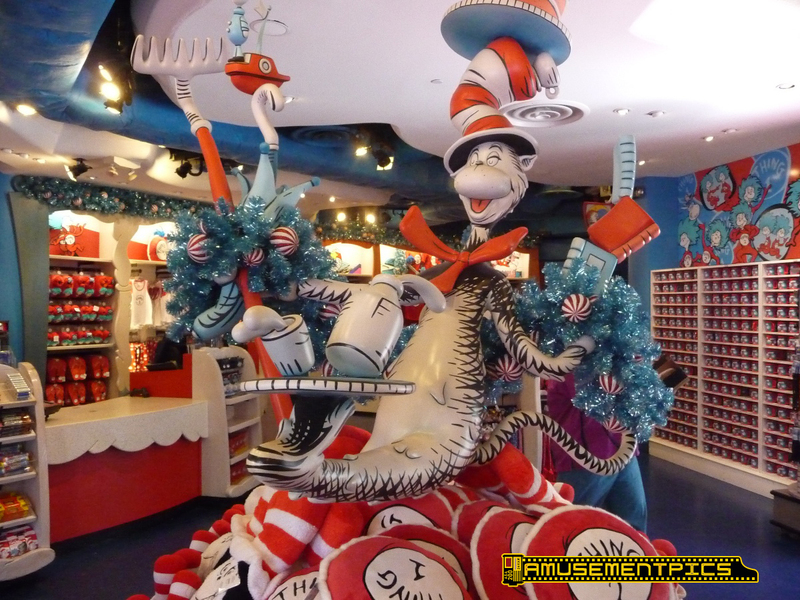 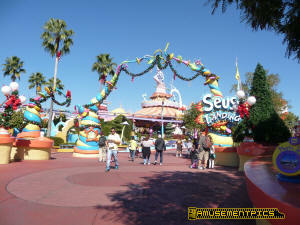 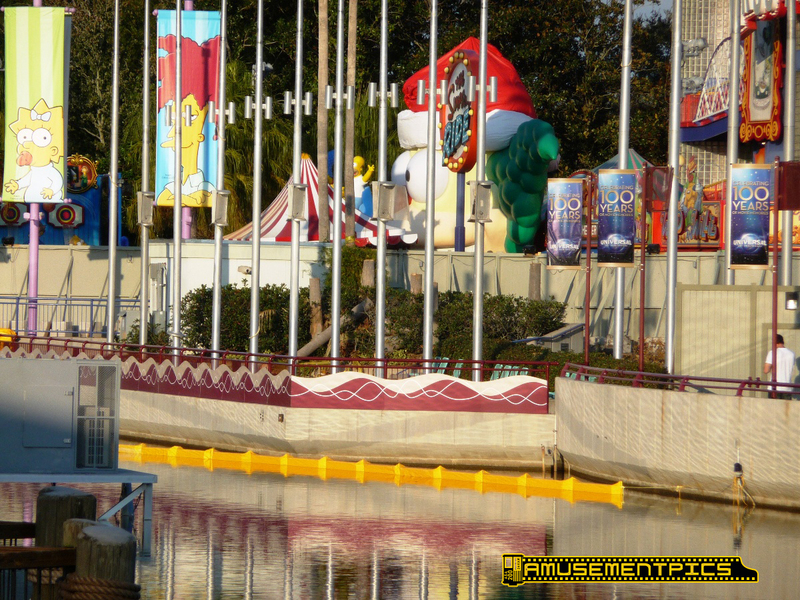 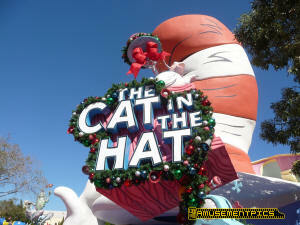 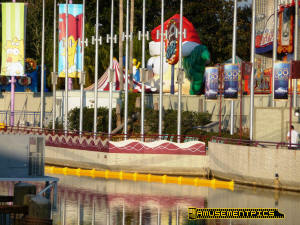 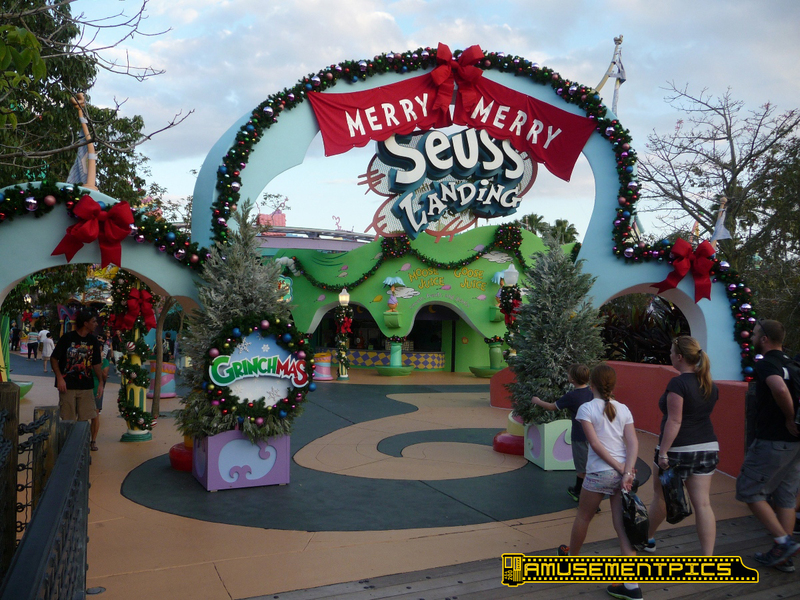 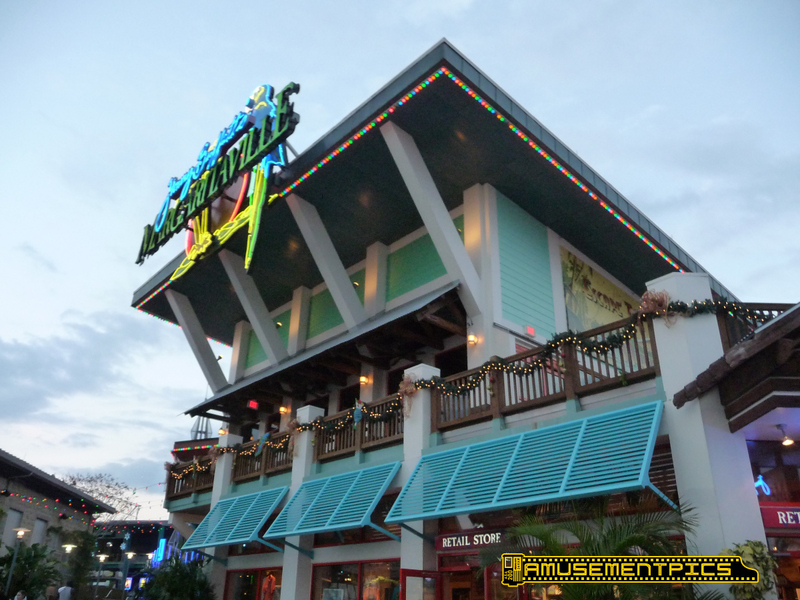 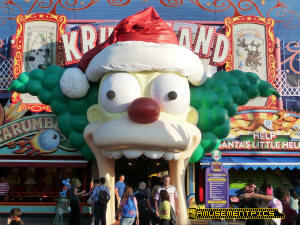 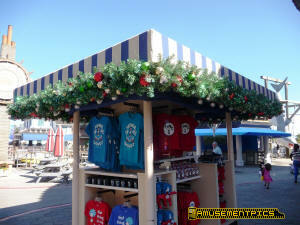 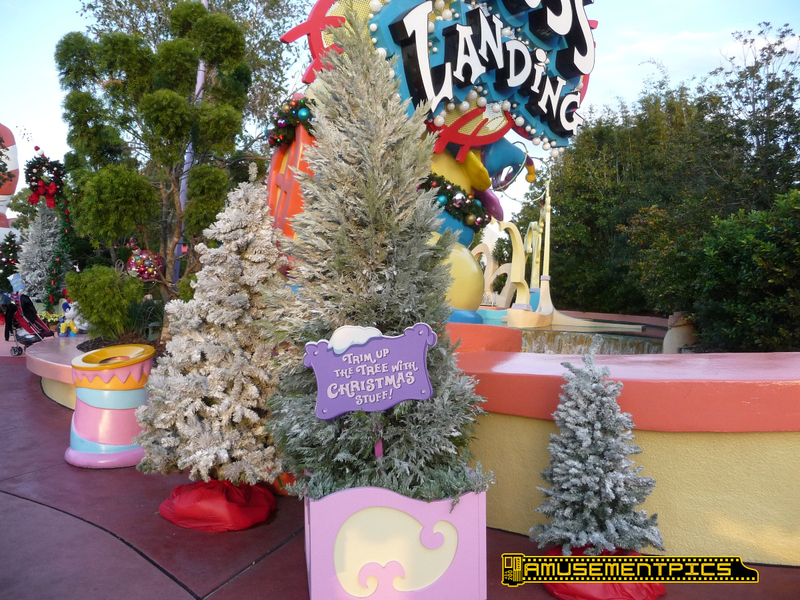 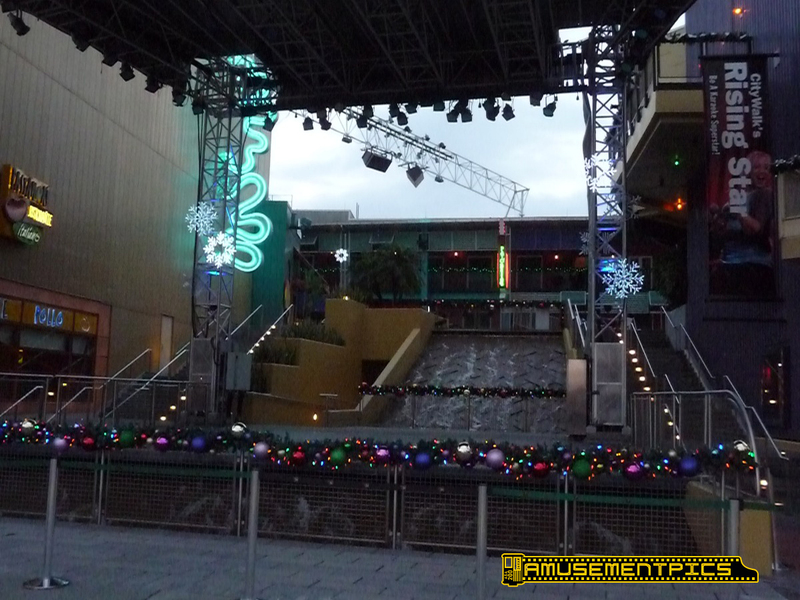 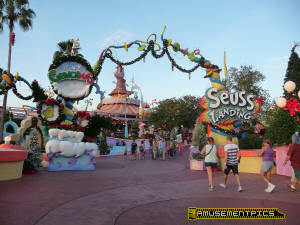 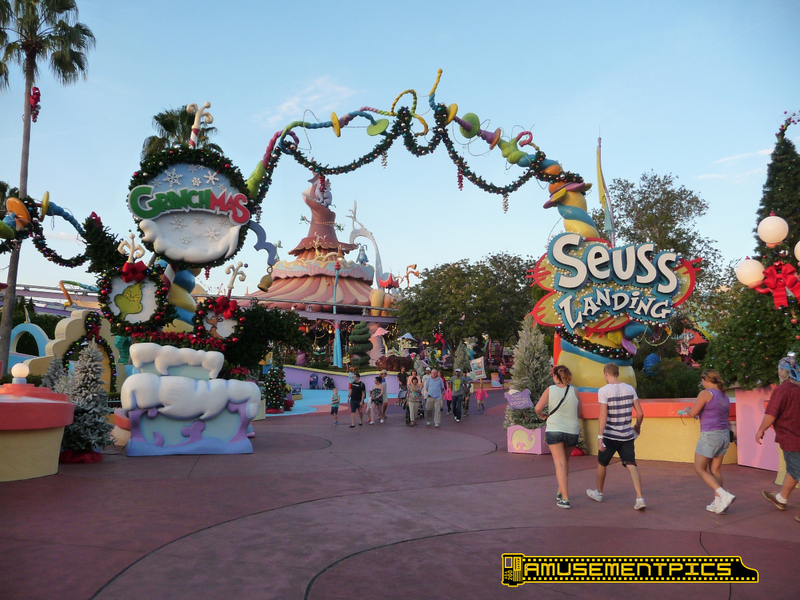 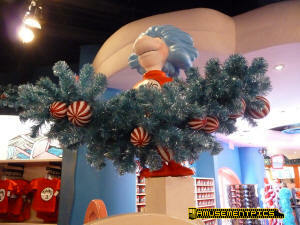 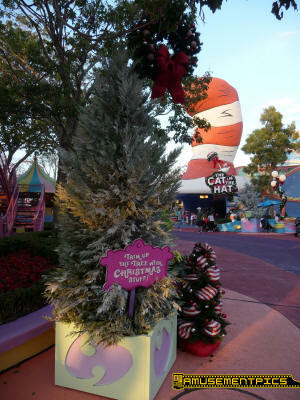 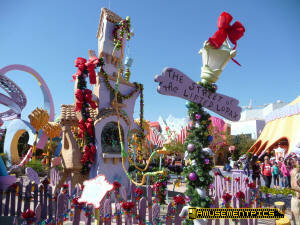 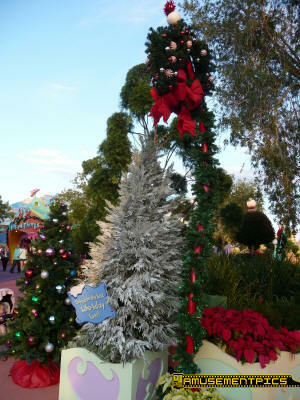 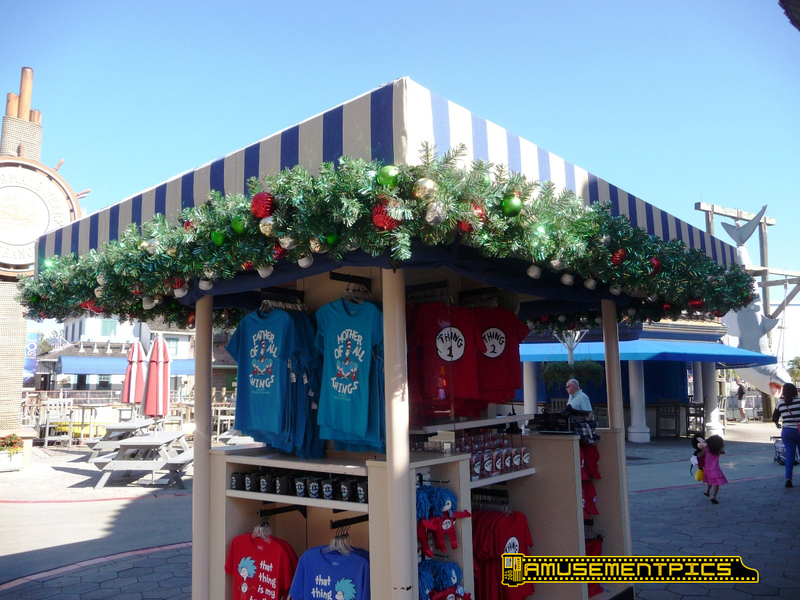 Seuss Landing gets the most decorations and is getting decked out for Grinchmas. 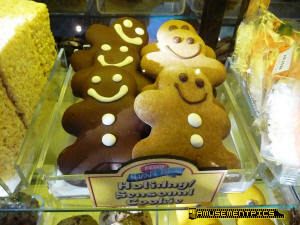 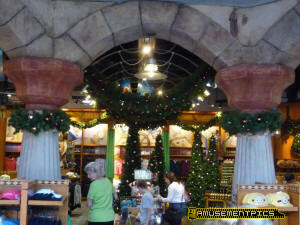 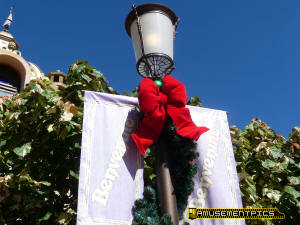 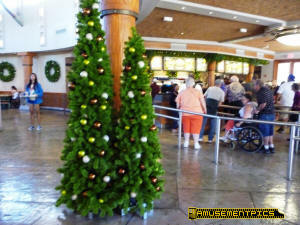 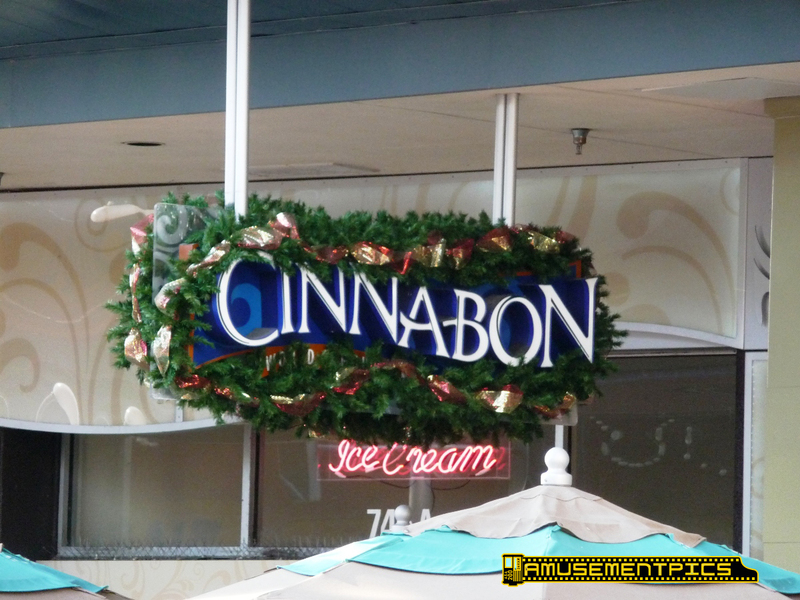 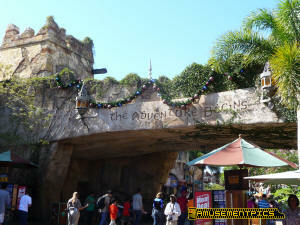 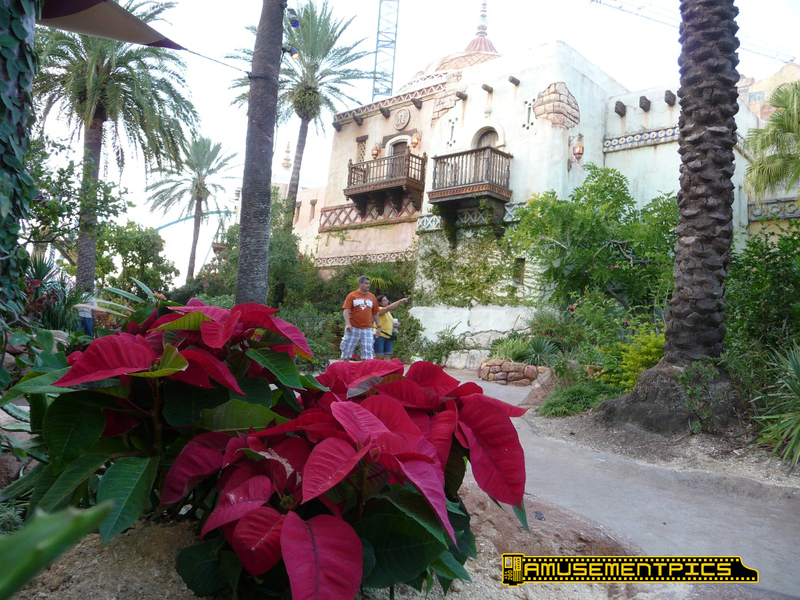 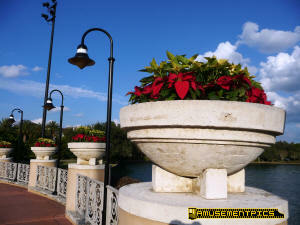 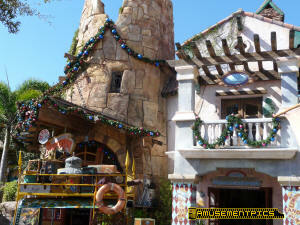 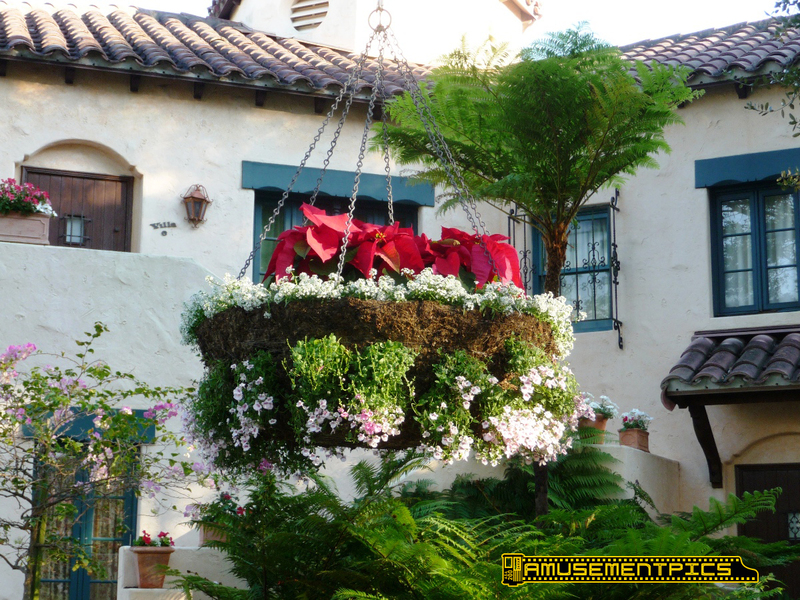 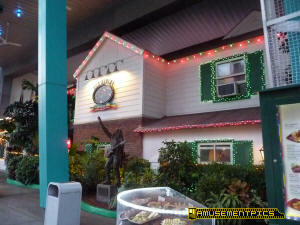 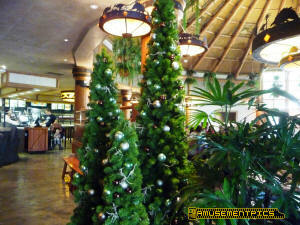 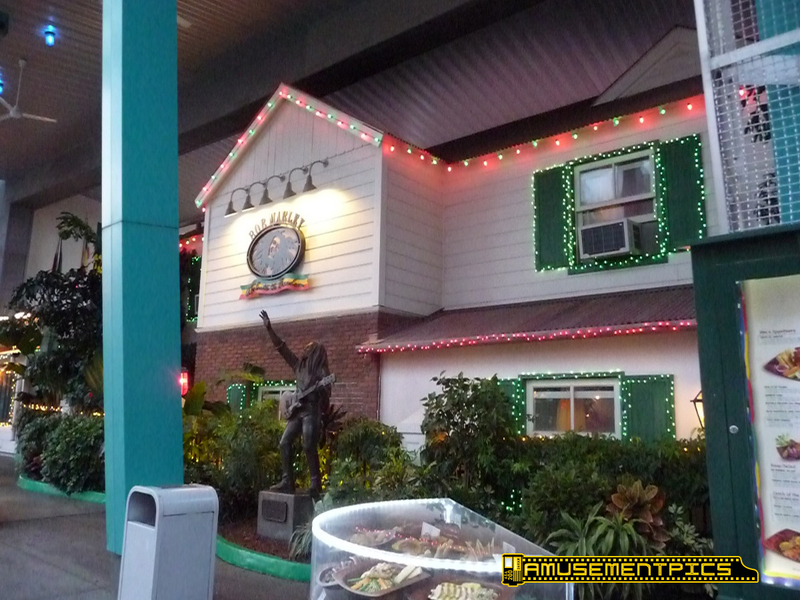 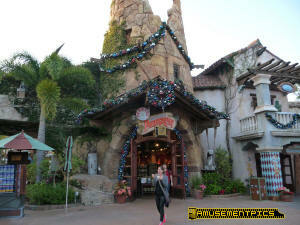 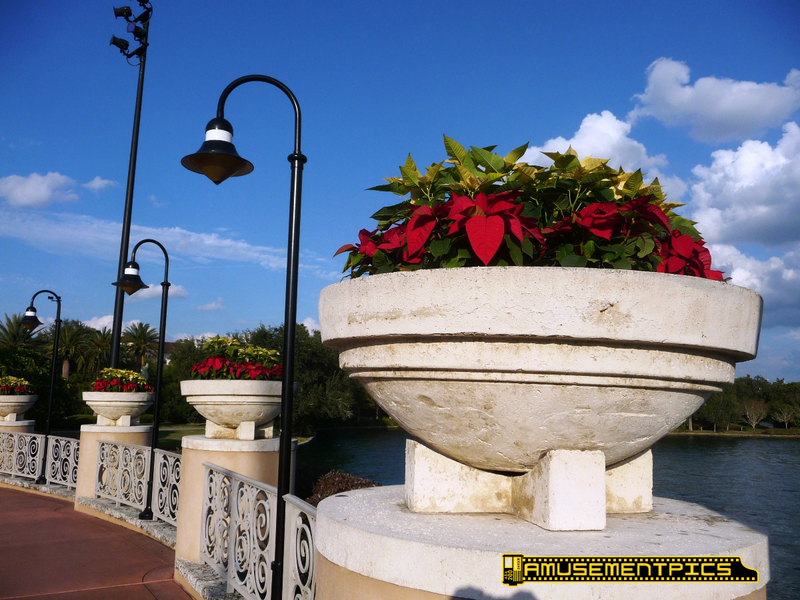 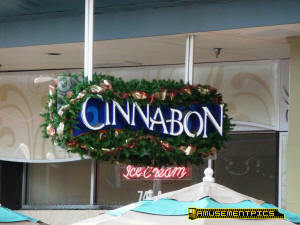 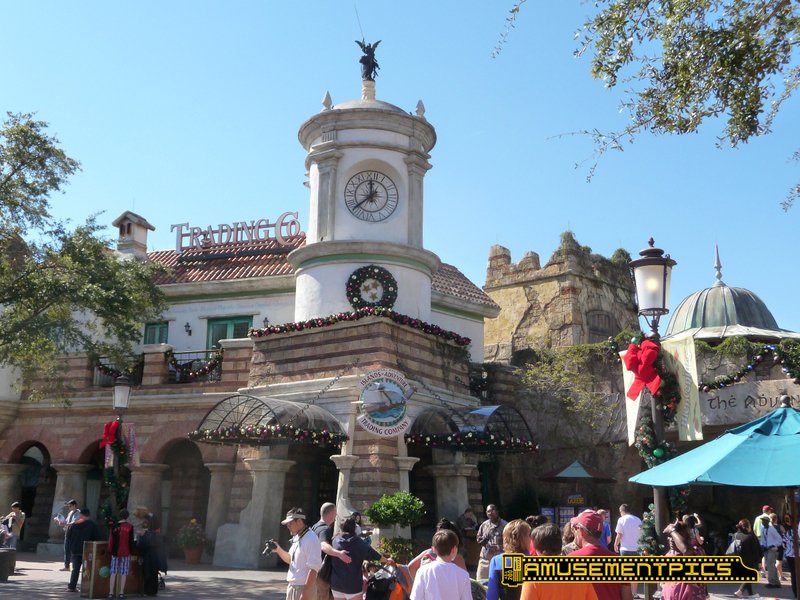 All of the Islands have nicely themed decor for the holidays. 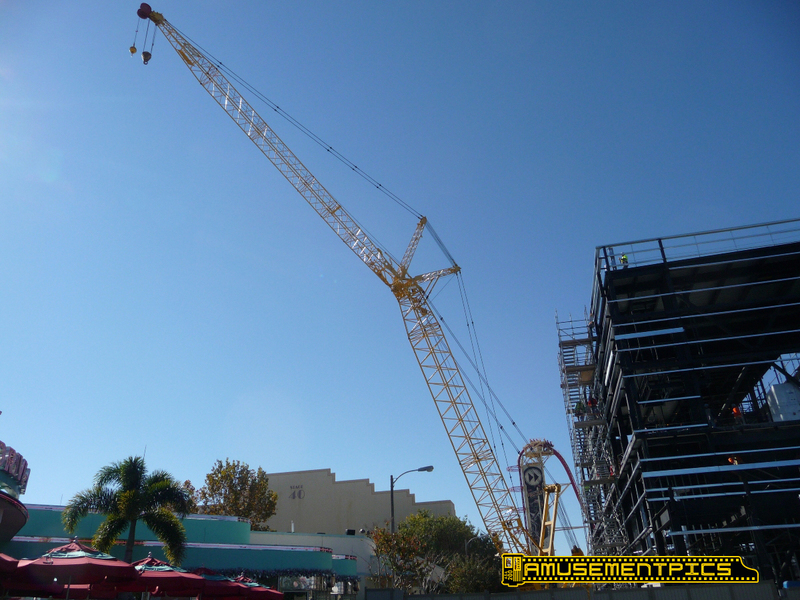 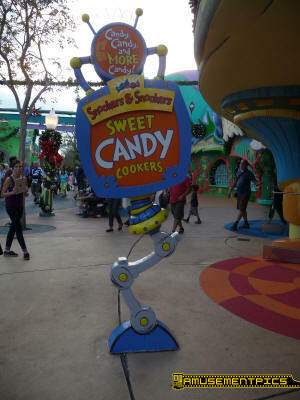 going up in Seuss Landing. 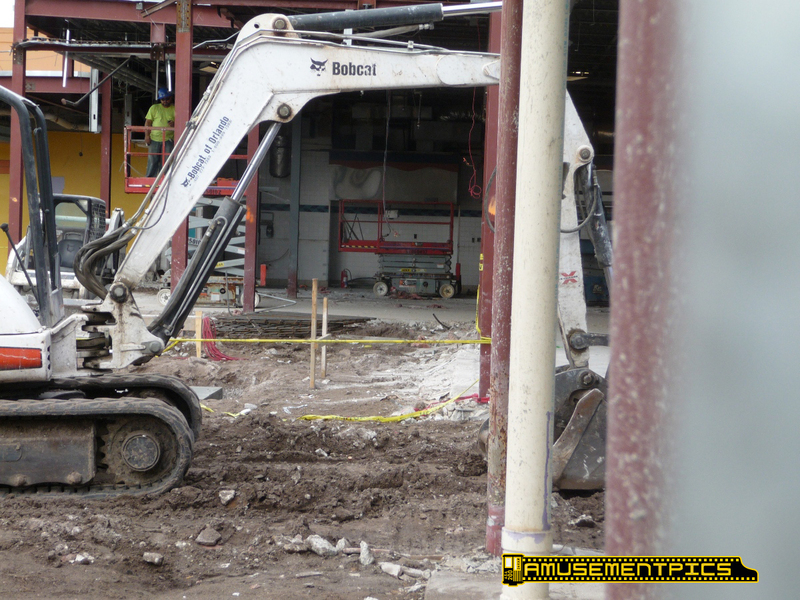 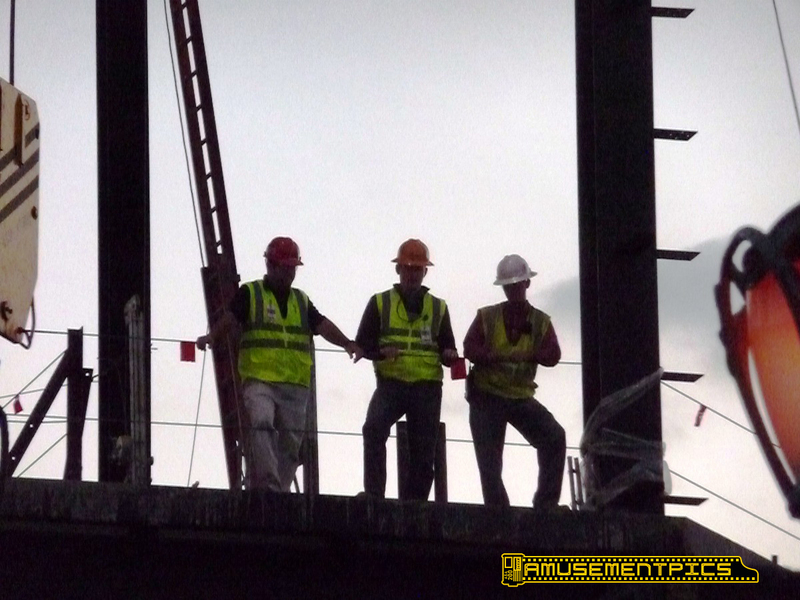 a pile driver on the site. 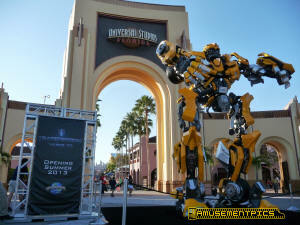 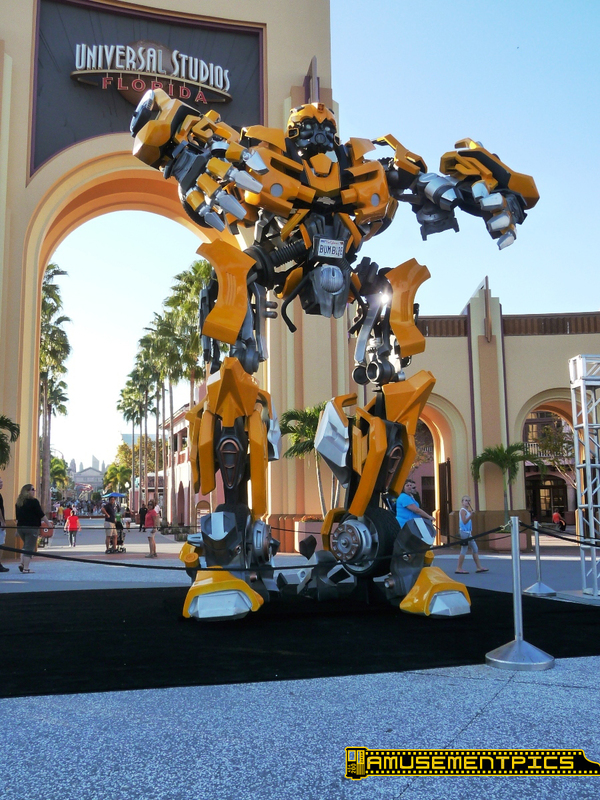 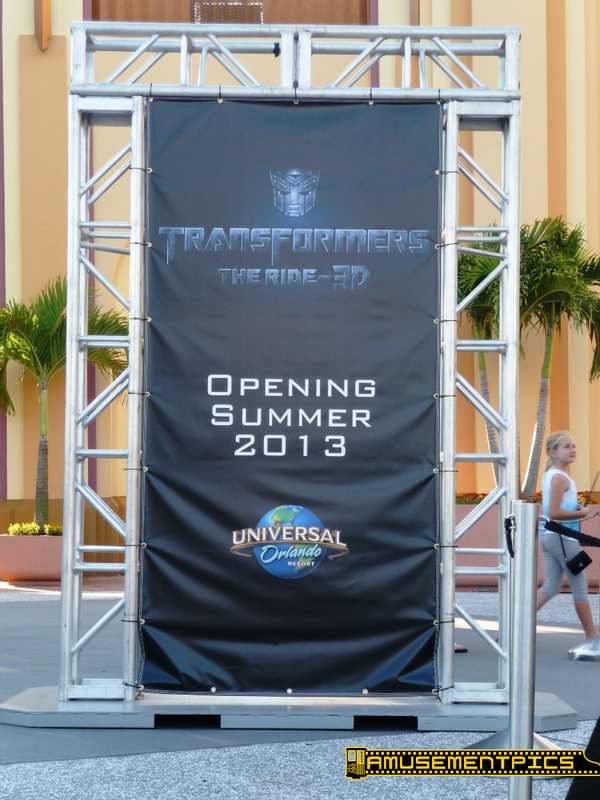 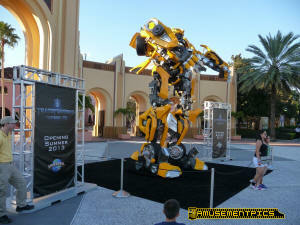 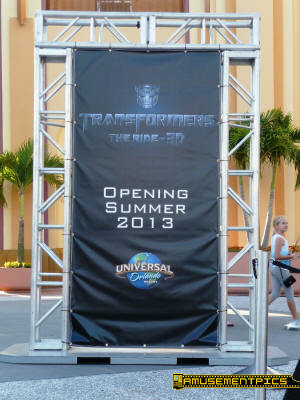 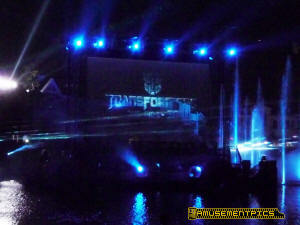 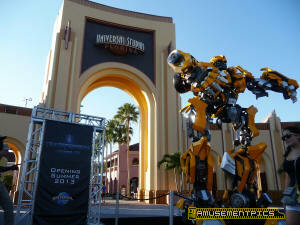 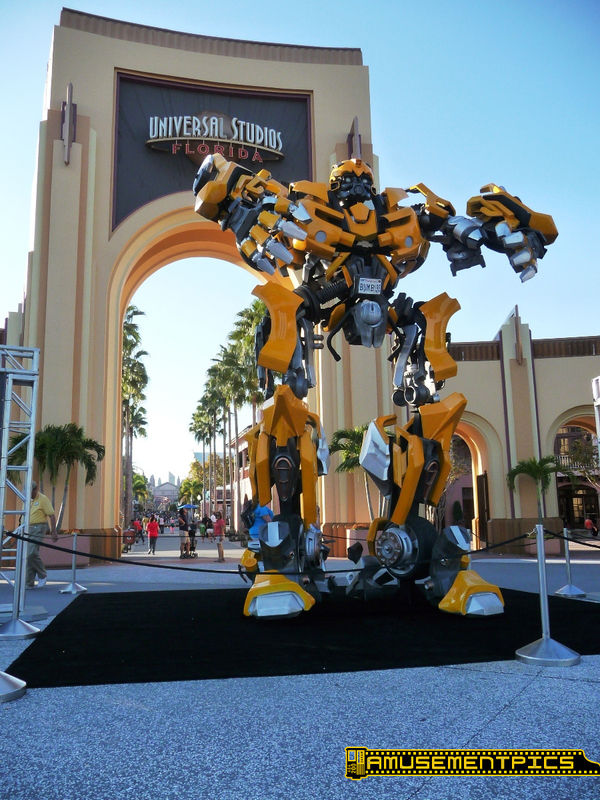 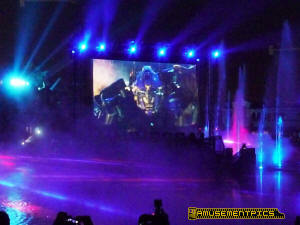 This weekend this huge Transformer statue is out in front of the Studios gates. set pieces still in the park. 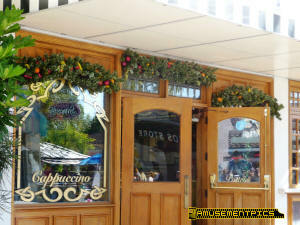 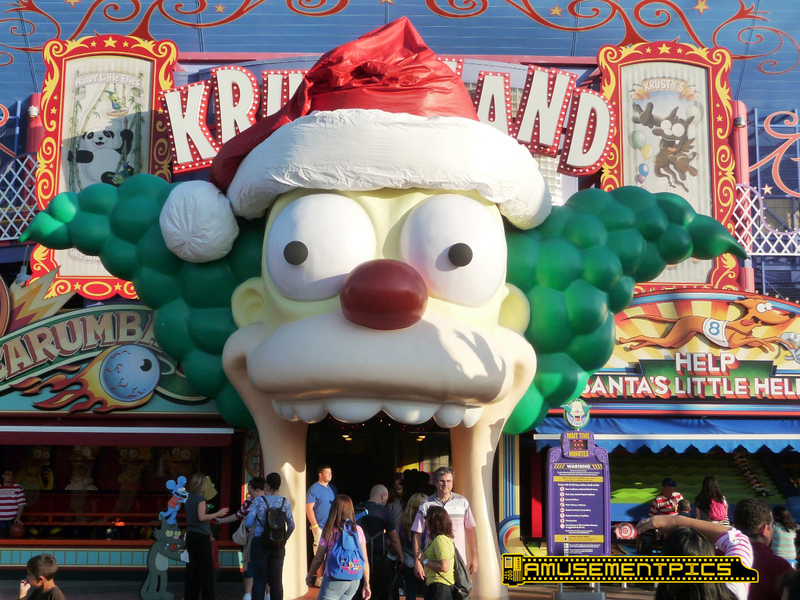 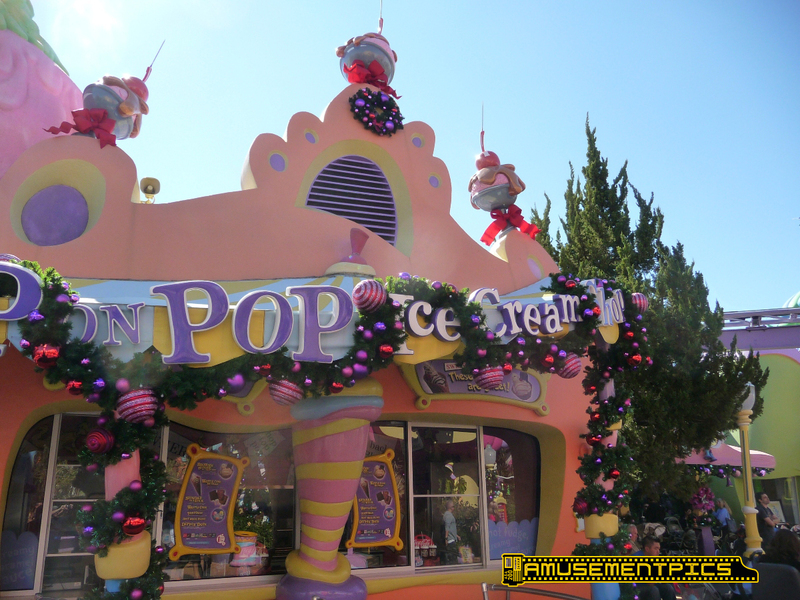 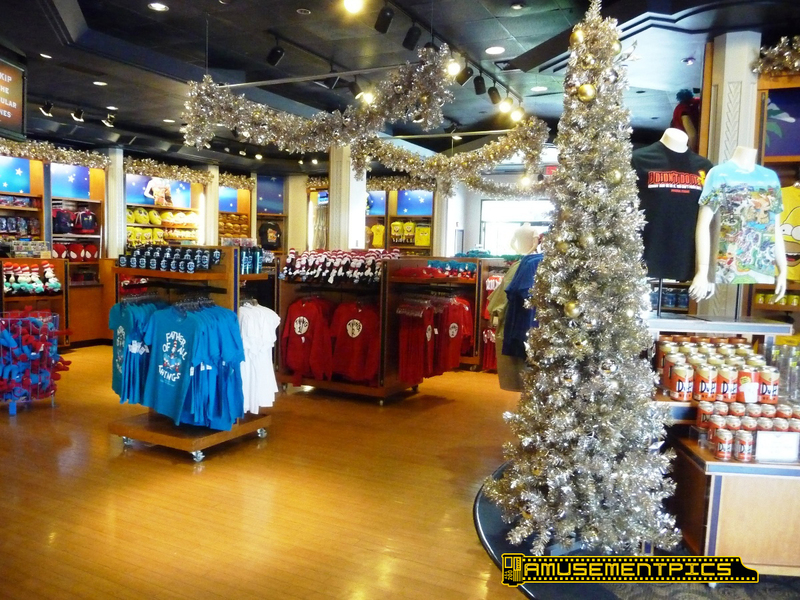 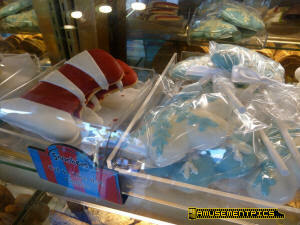 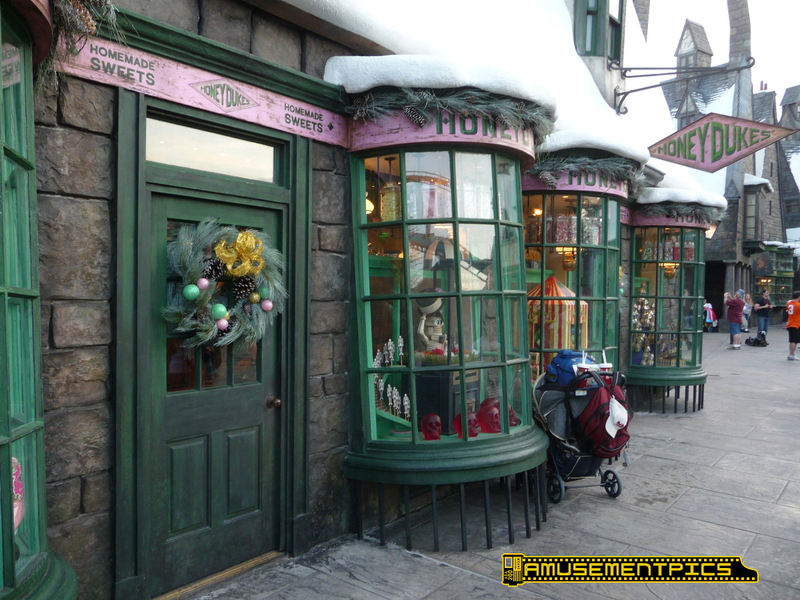 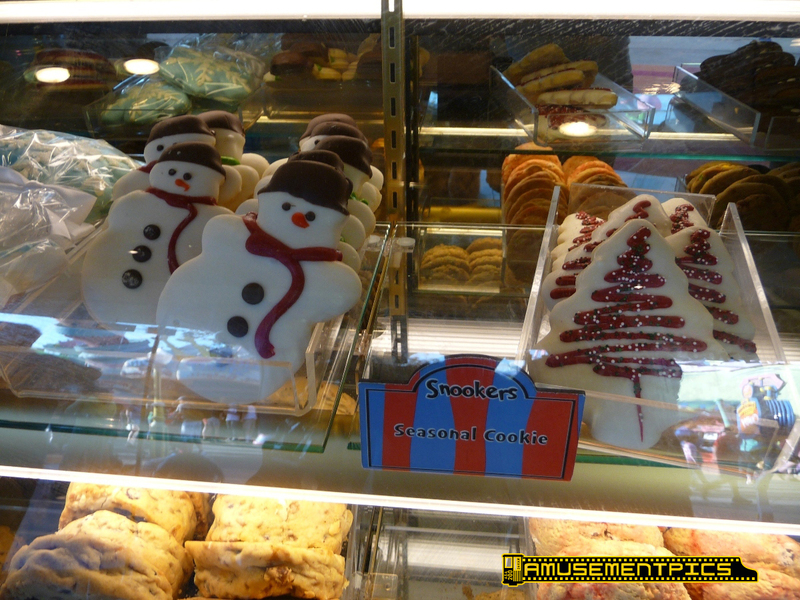 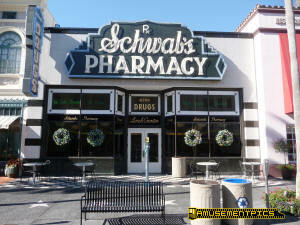 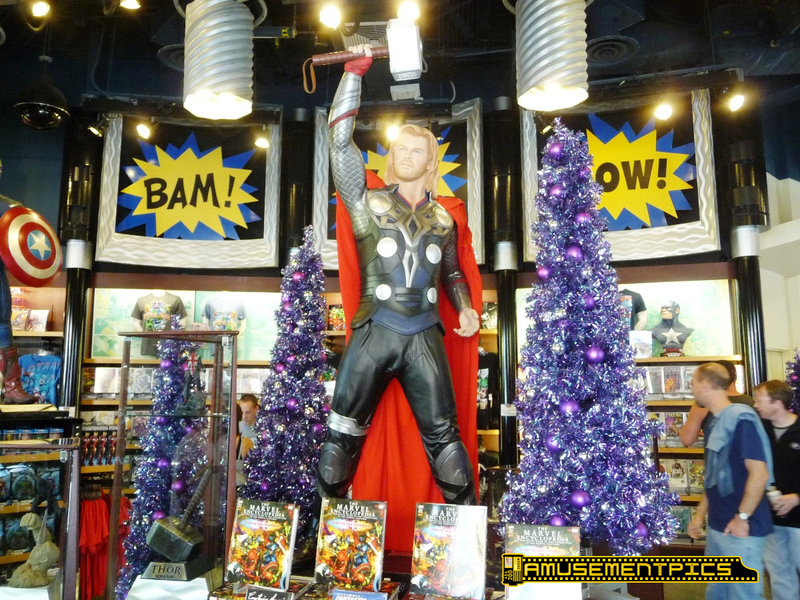 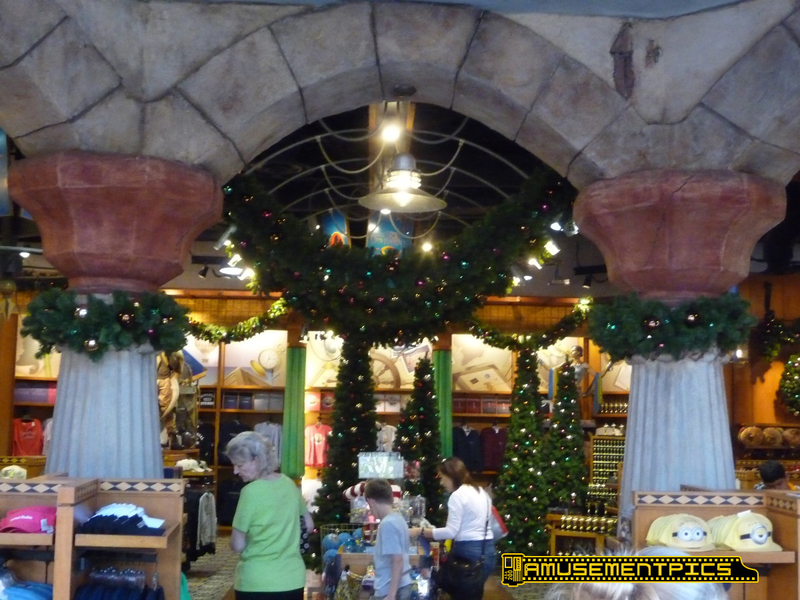 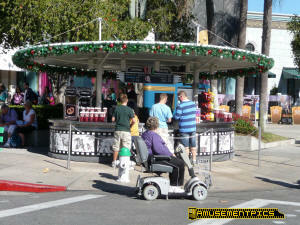 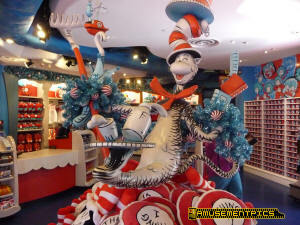 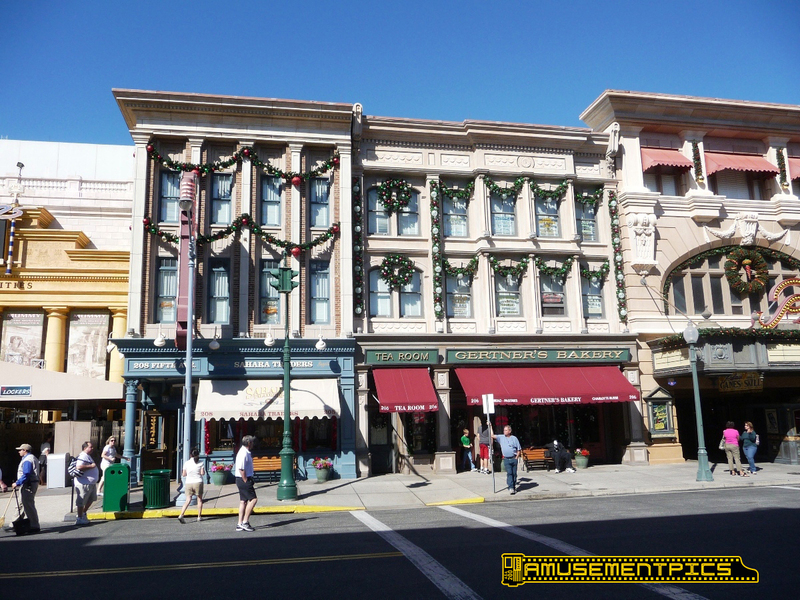 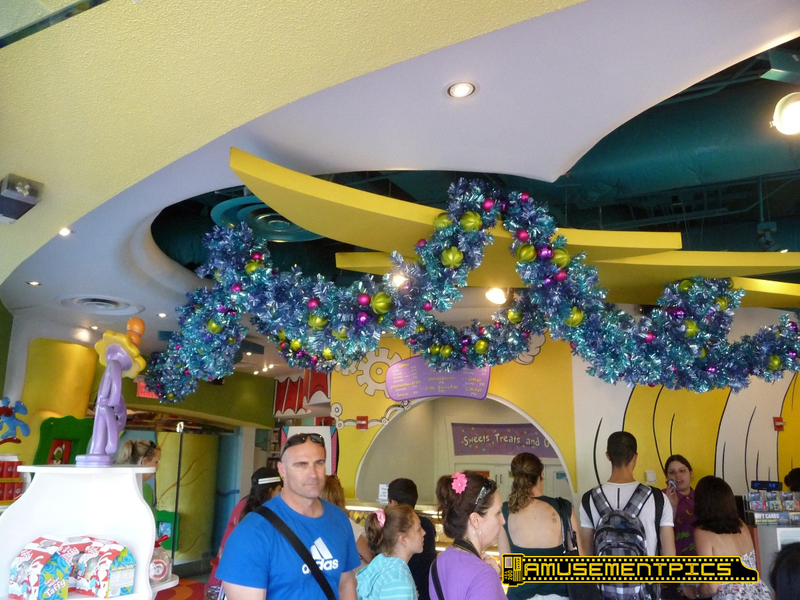 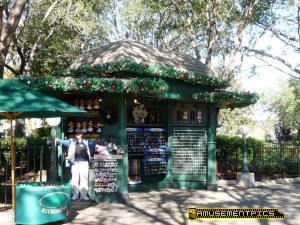 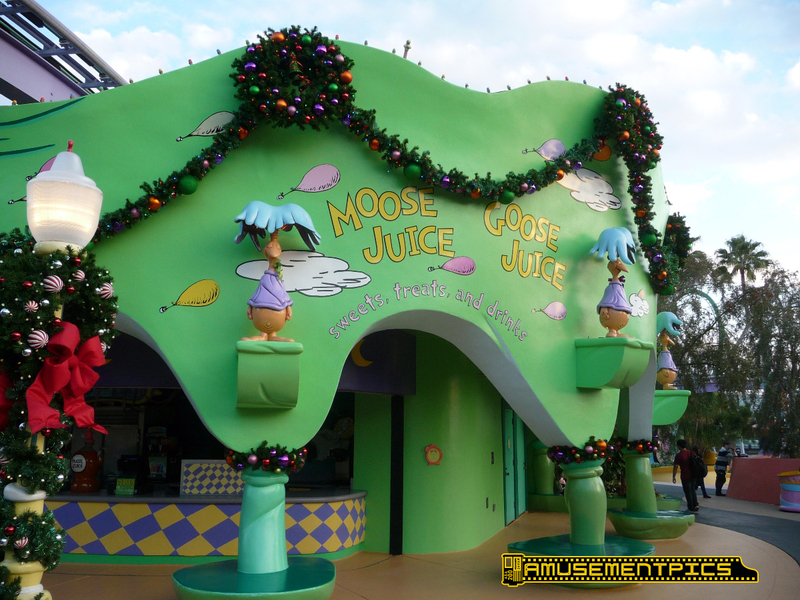 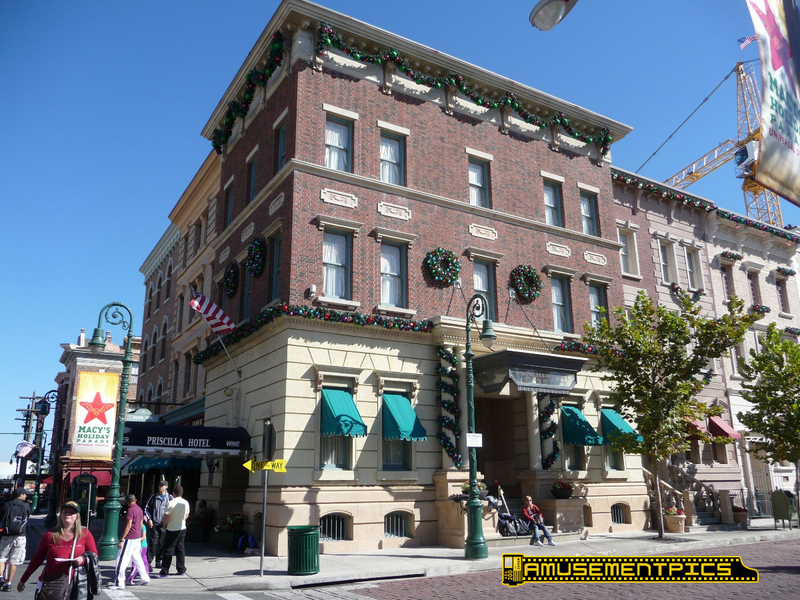 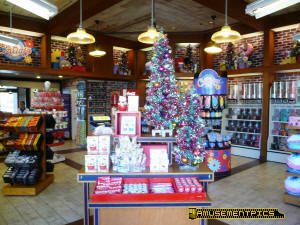 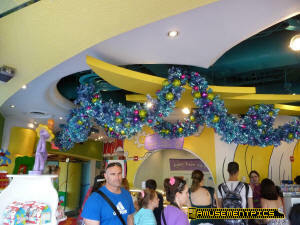 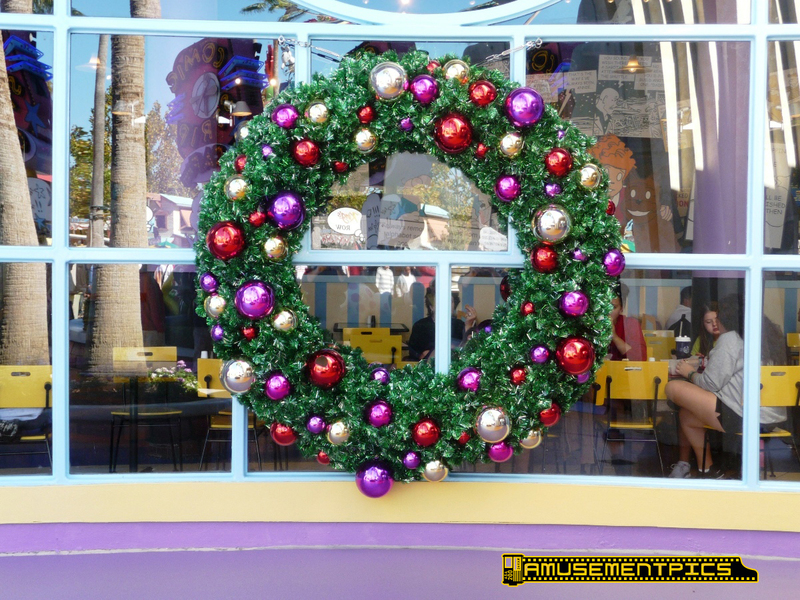 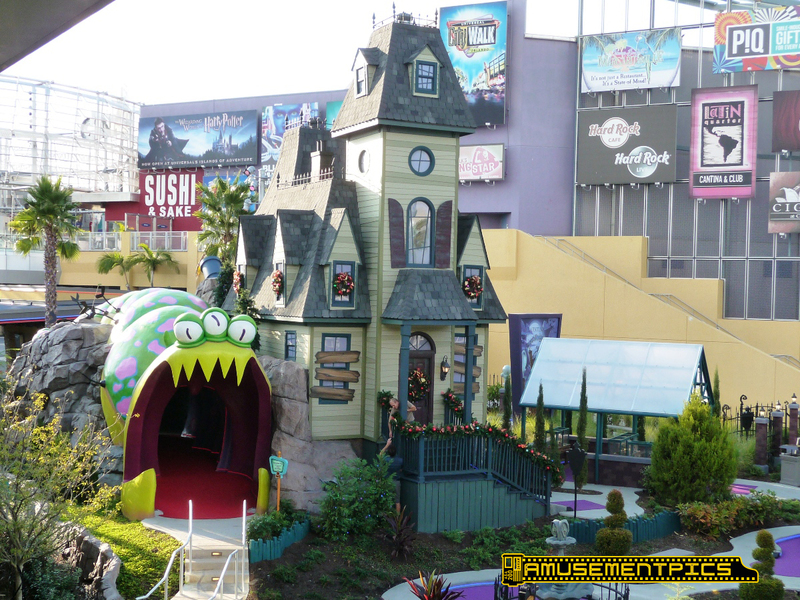 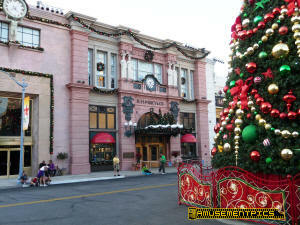 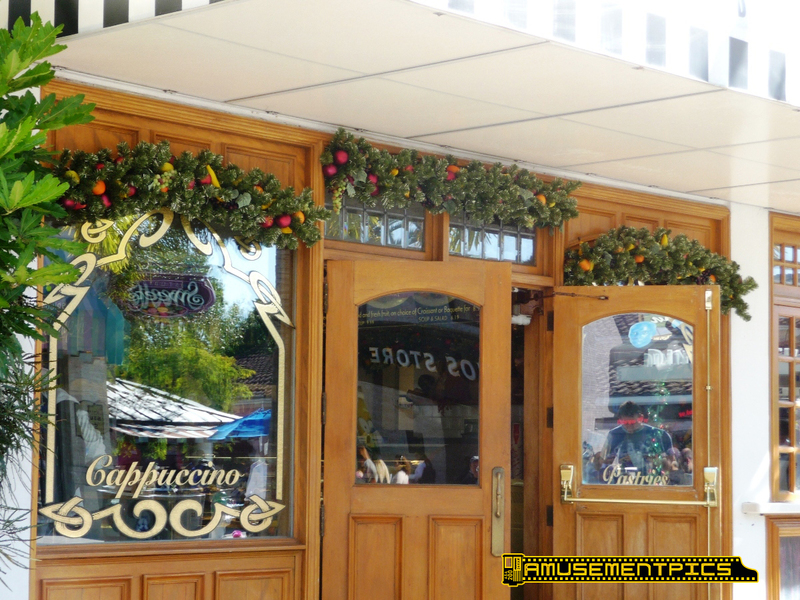 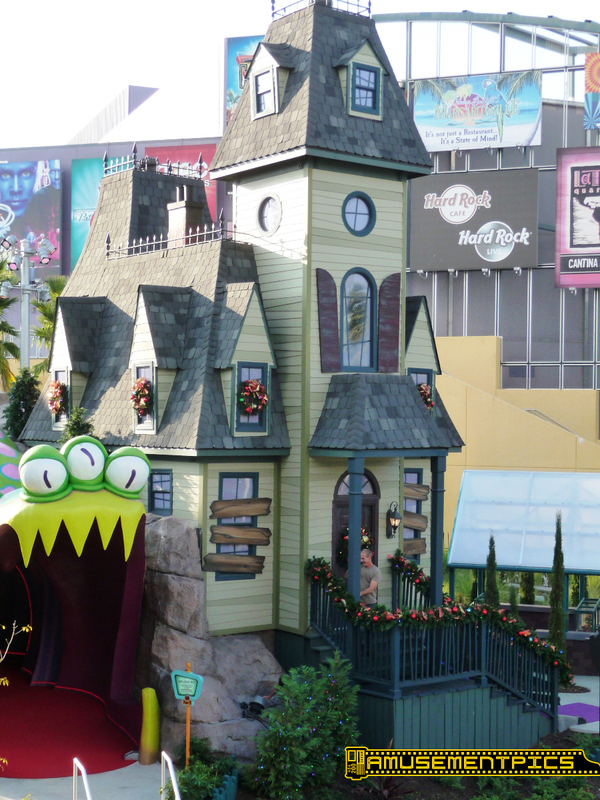 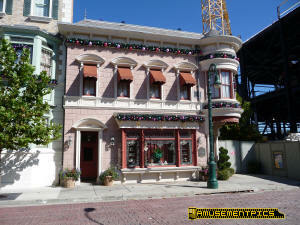 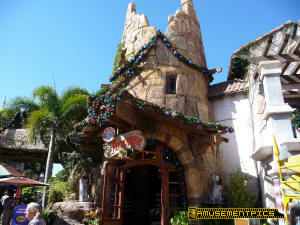 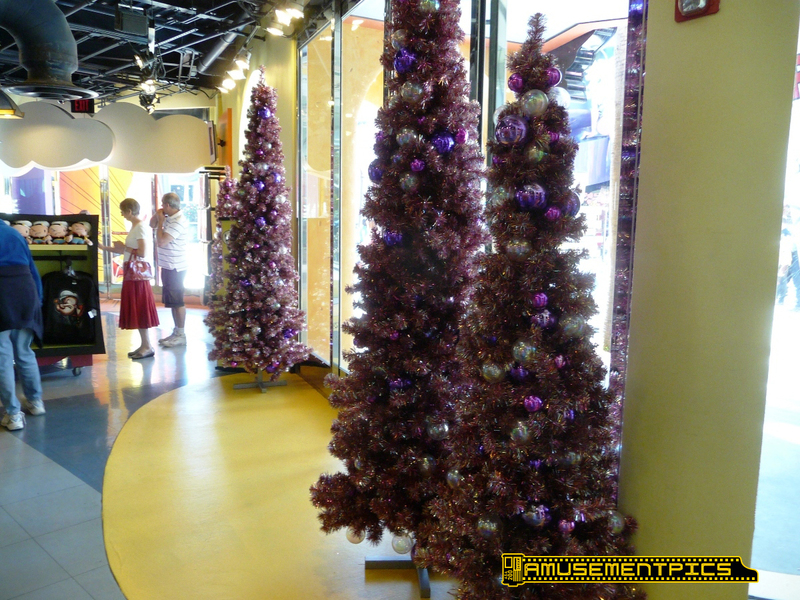 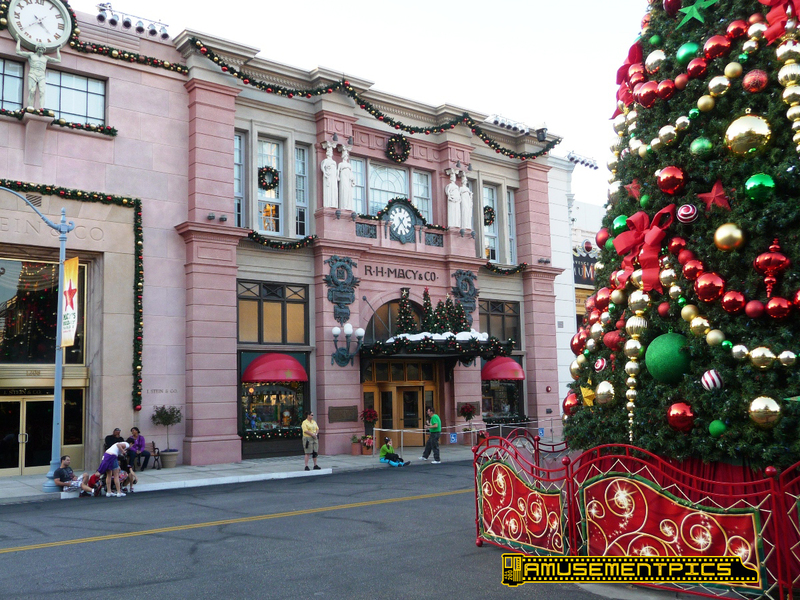 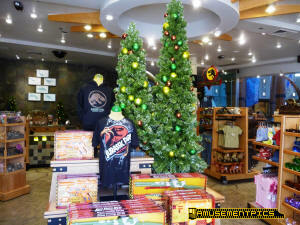 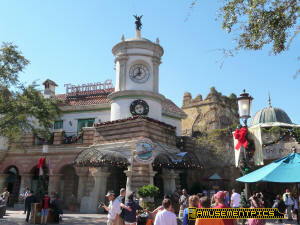 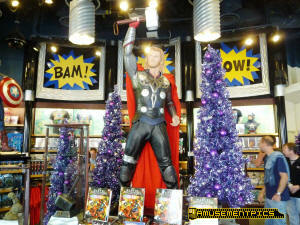 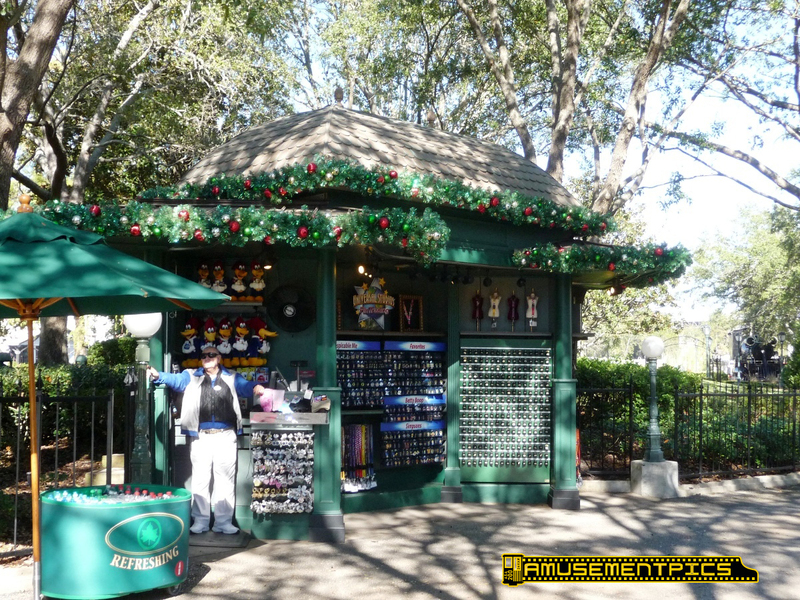 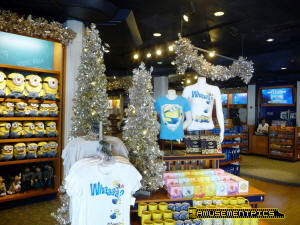 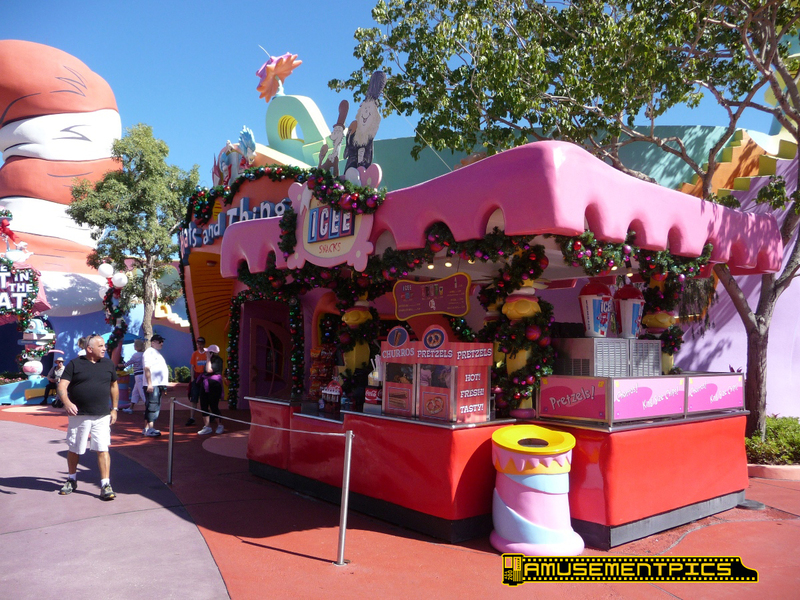 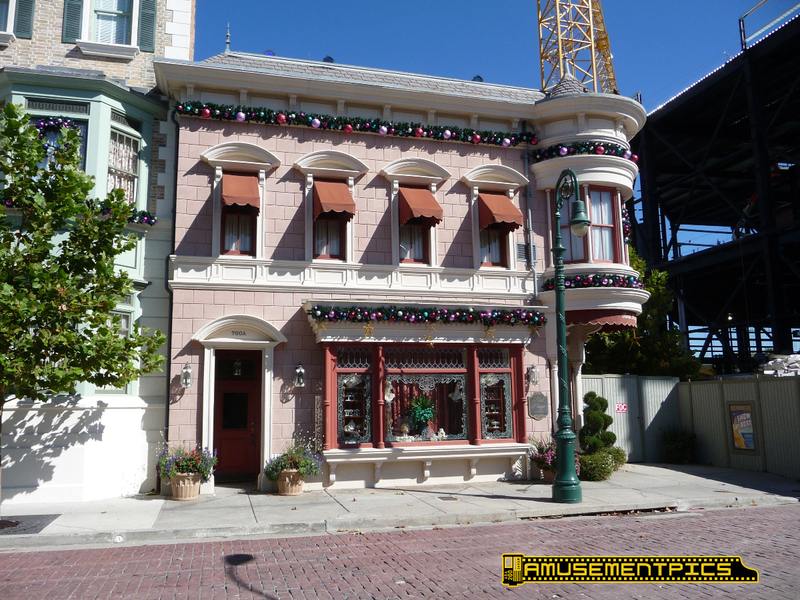 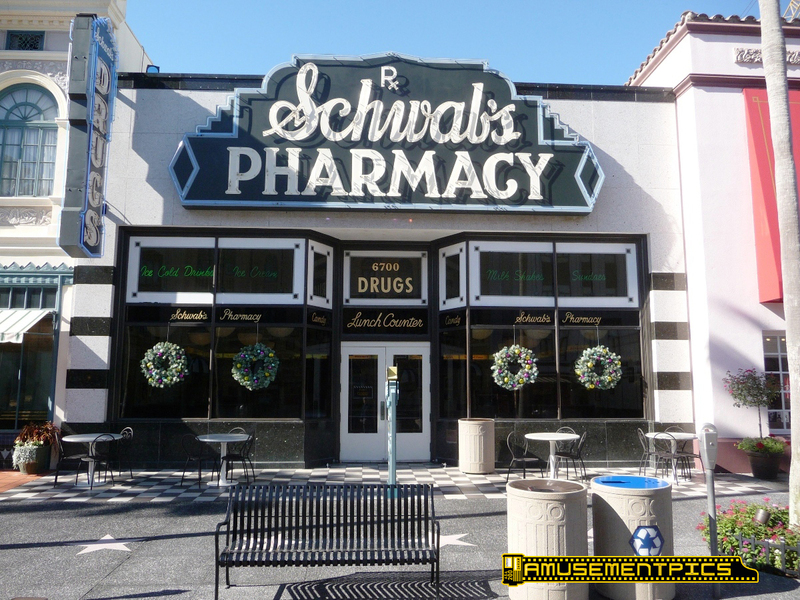 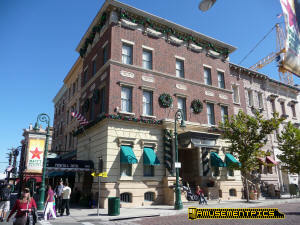 This little shop is now all Grinchmas (after being all Halloween Horror Nights stuff). the food stand as well. All the temporary games have been removed. 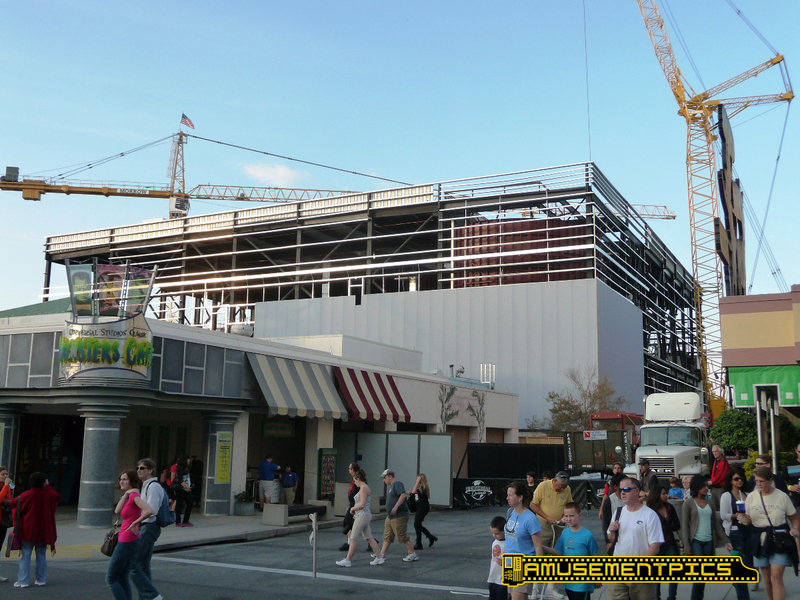 The progress on Transformers is really amazing! 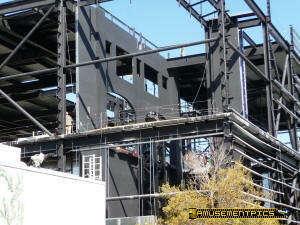 Just two days later there's a lot more done. the building now. 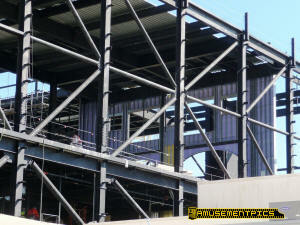 More parts of the HVAC system have been placed. 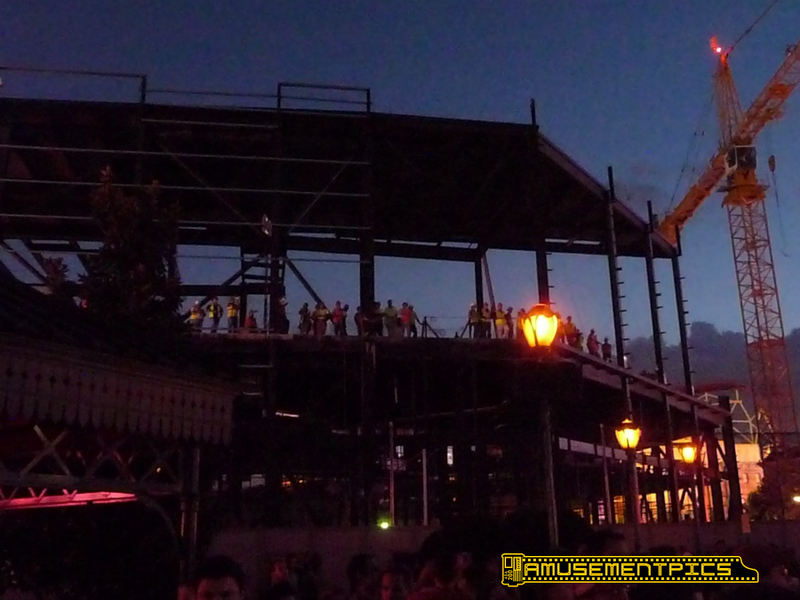 The crews are hard at work day and night. 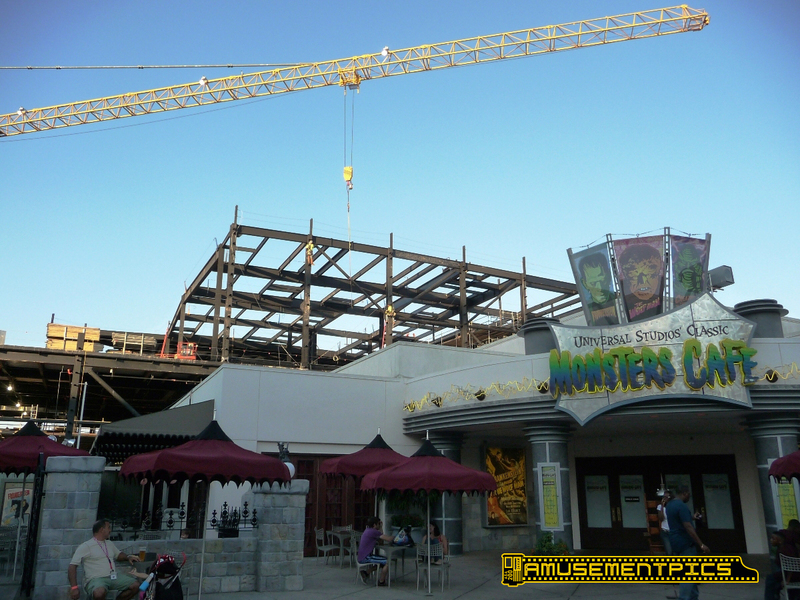 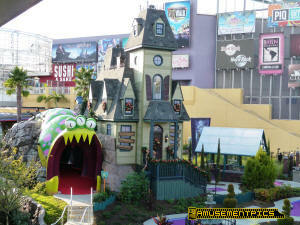 The building is going to really dwarf Monsters Cafe. 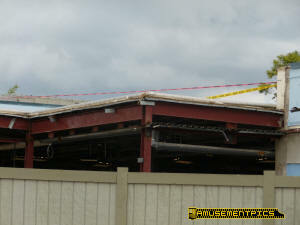 roof framework is up now. 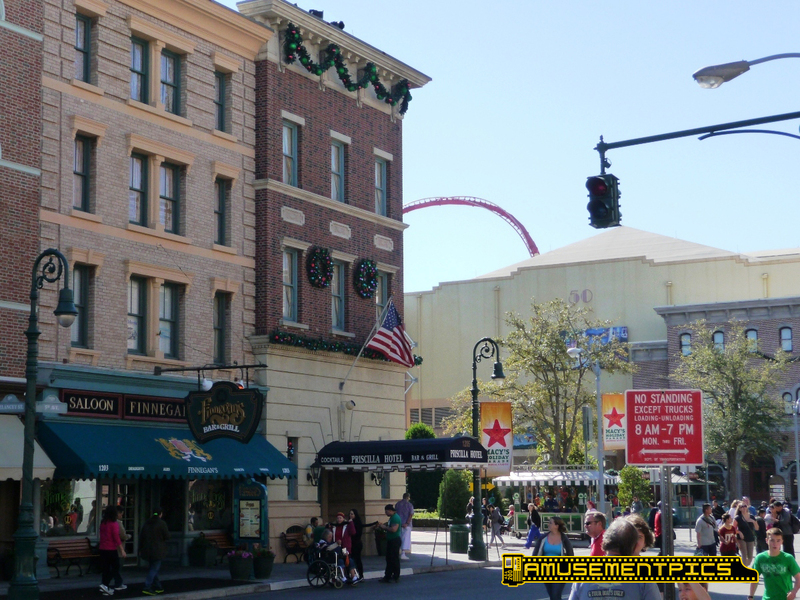 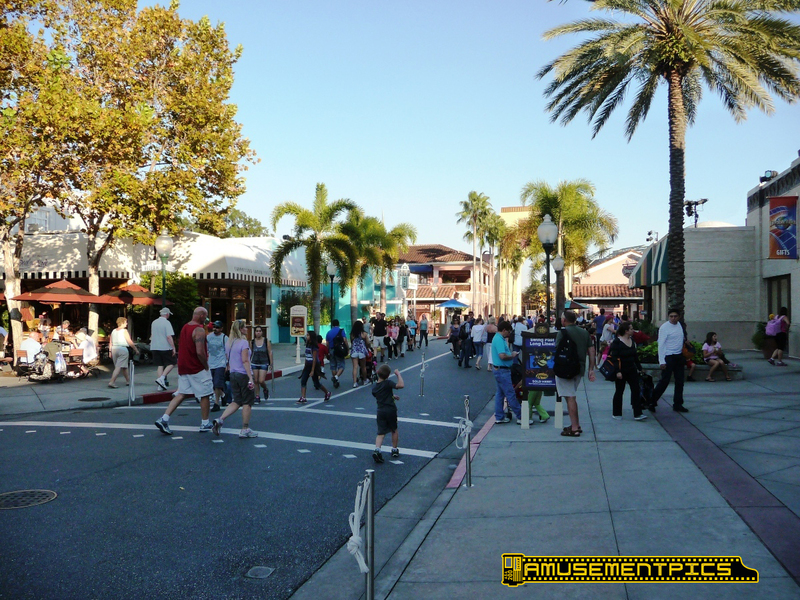 facing the apartment buildings seems to be the same beige color as the soundstages. 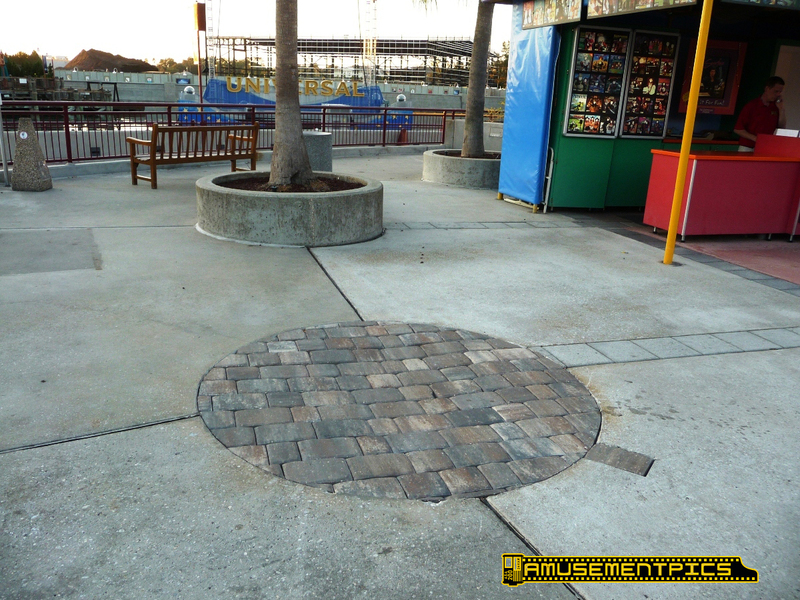 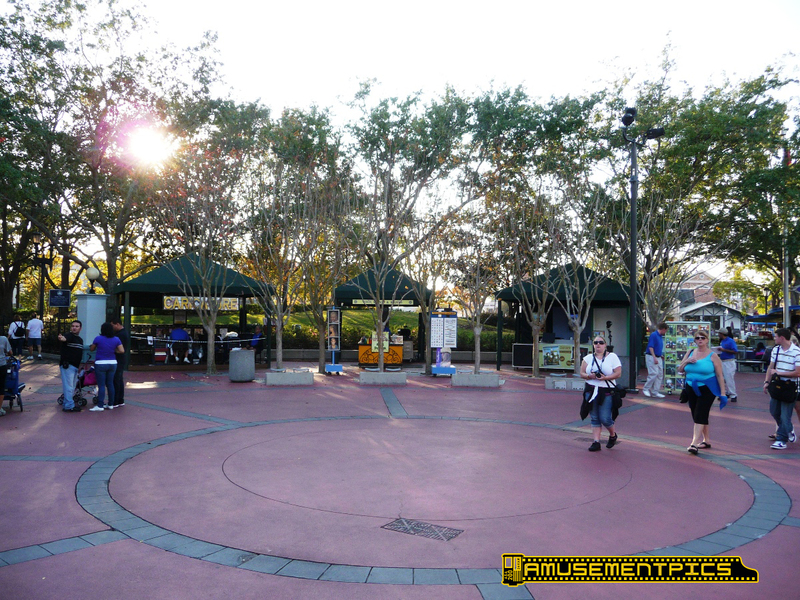 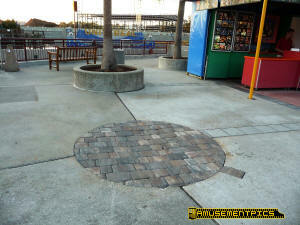 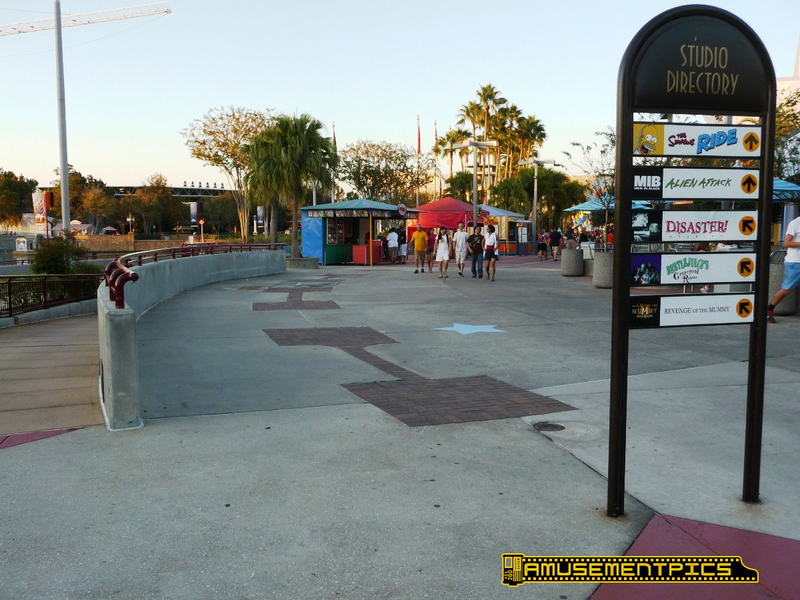 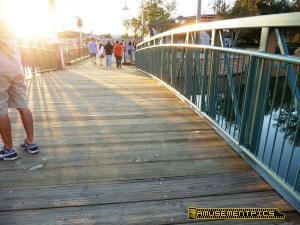 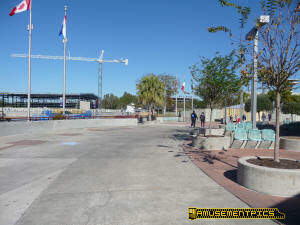 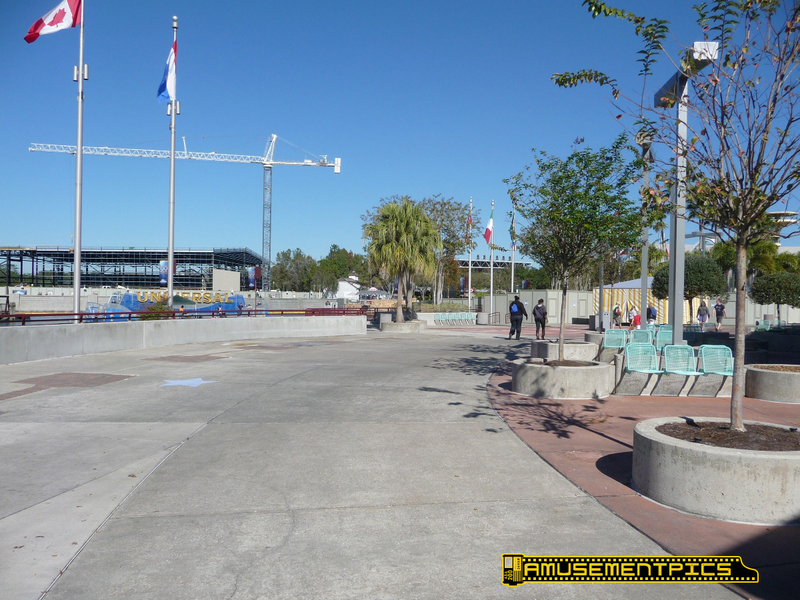 benches have been removed along the walkway. roll down walls in place. 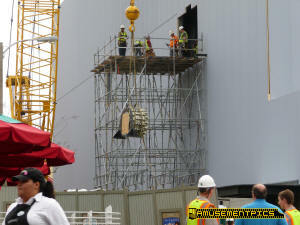 The robot is still in scaffolding. 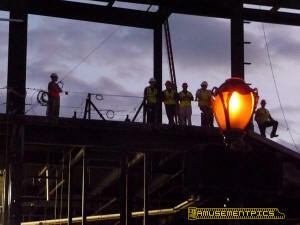 As announcement time drew near and it got darker, the crew gathered to watch. 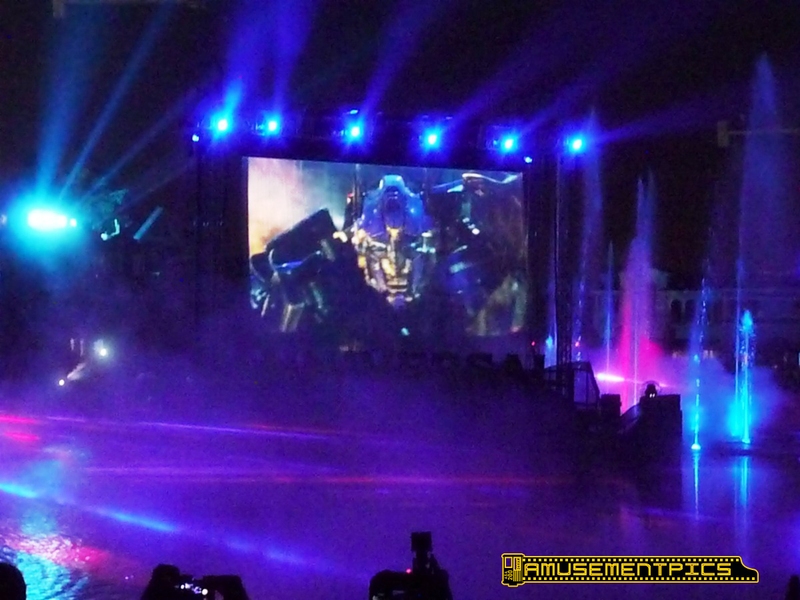 comes through... ...and Transformers is revealed! 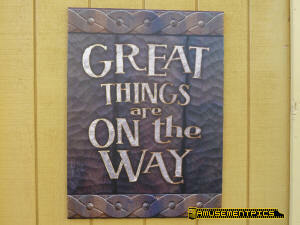 People seem REALLY excited by the announcement! 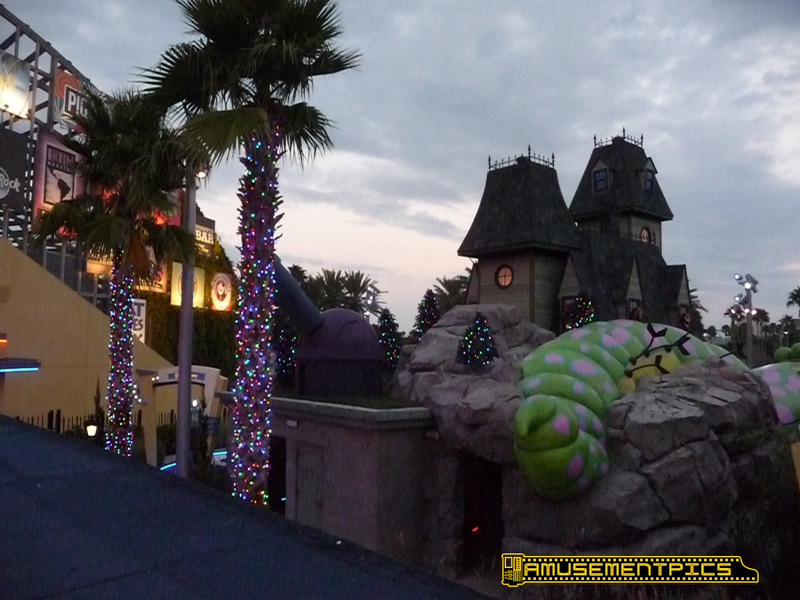 On the way out we noticed the light is still out on the Lighthouse (after several weeks), but the mirror is still rotating up there in the dark.